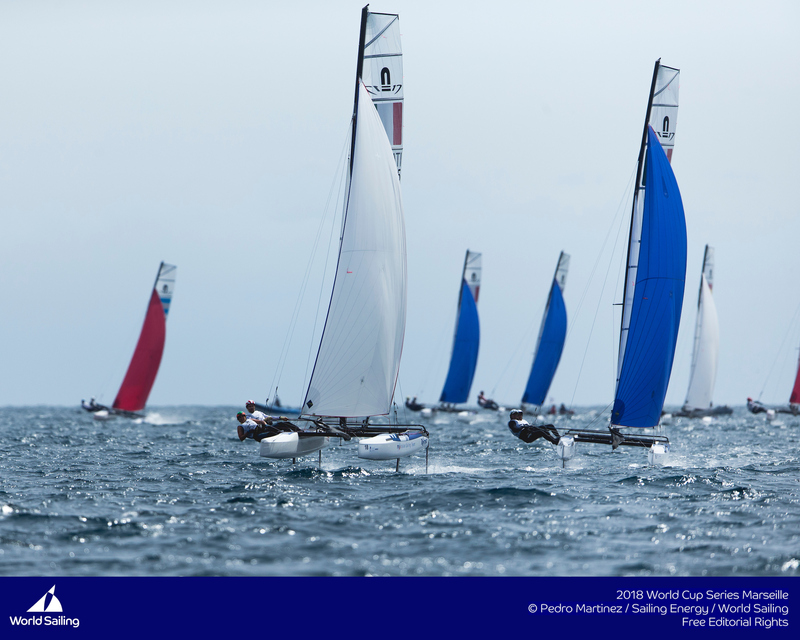 Each year there is a warm up regatta prior to the Miami World Cup on Martin Luther King holiday weekend in the USA. 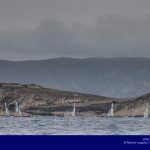 This year it was the 2018 mid-winter regatta and it was a perfect warm up regatta. 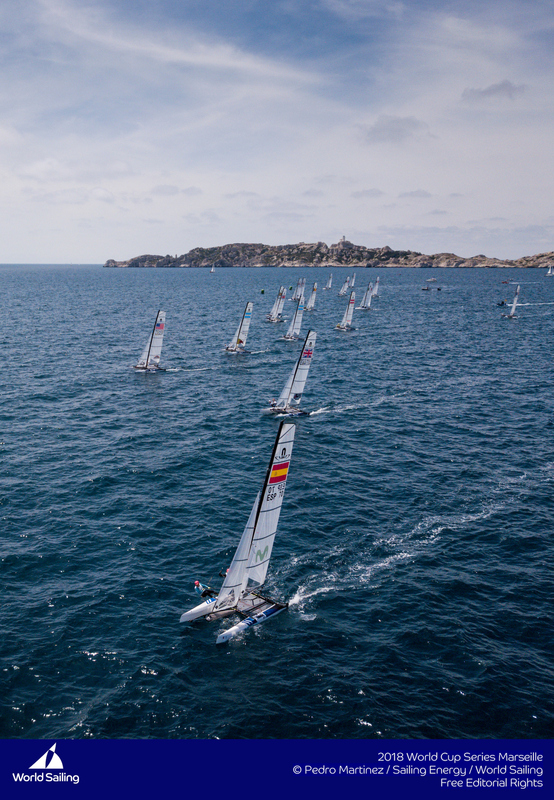 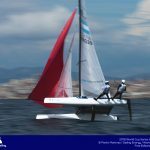 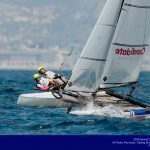 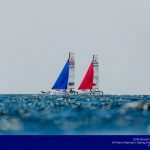 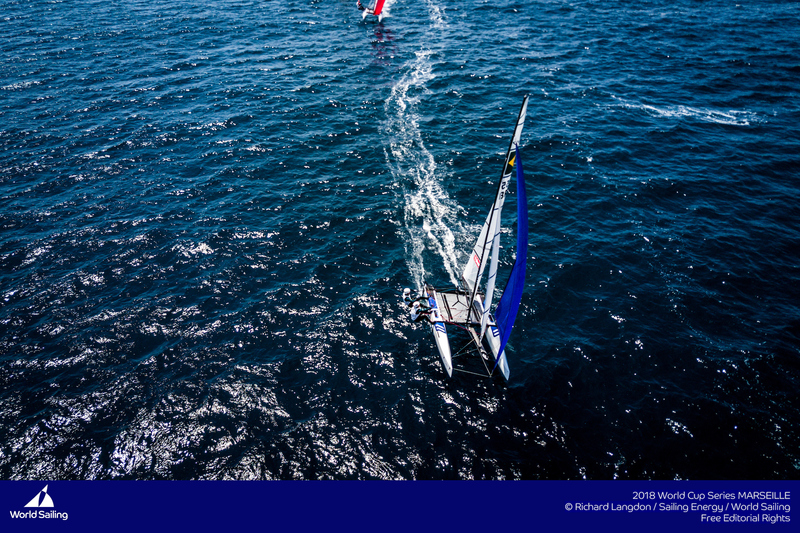 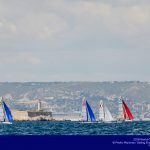 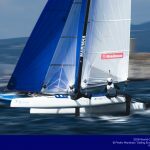 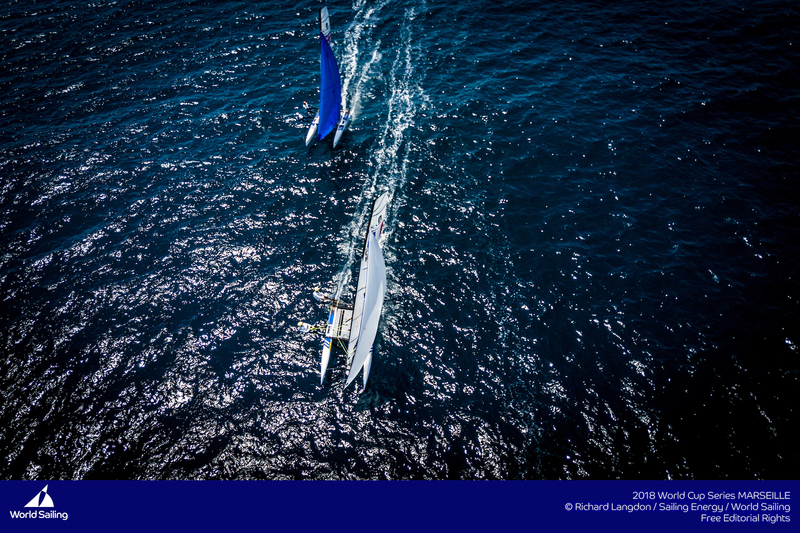 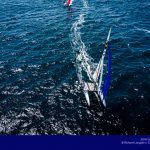 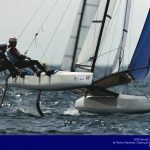 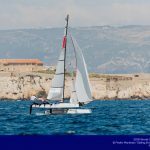 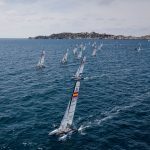 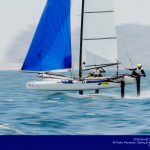 There are still boat supply limitations on Nacra 17, with few teams having two boats and therefore few teams opting to ship to regattas and preferring to stay at their winter training venues. 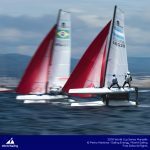 20 teams (including the american’s) have managed to get their gear to Miami, and 14 of those participated in the mid winters. 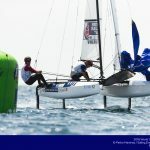 Each day brought different wind strengths, from light on day 1 to windy on day 2 and medium on day 3. 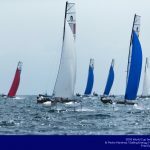 It was offshore breeze, and therefore shifty, but with the flat water conditions of Miami these full foilers reveled and performed well. 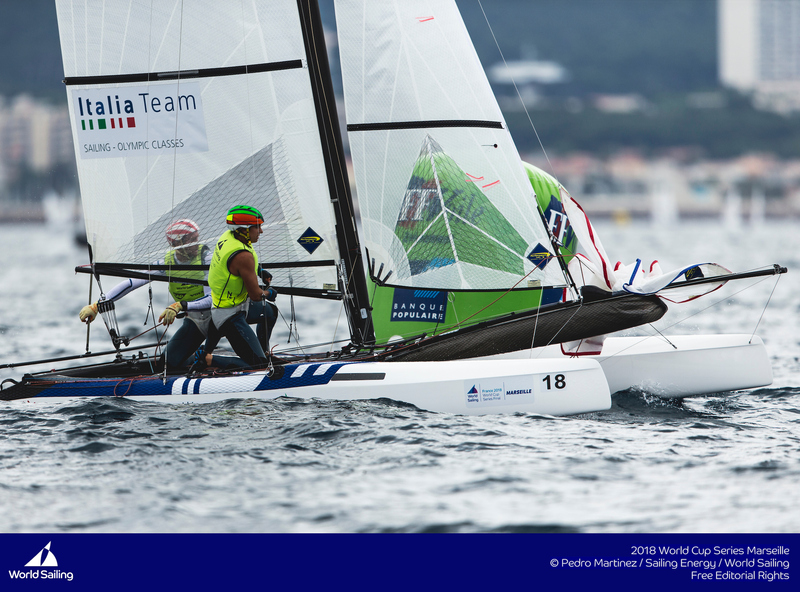 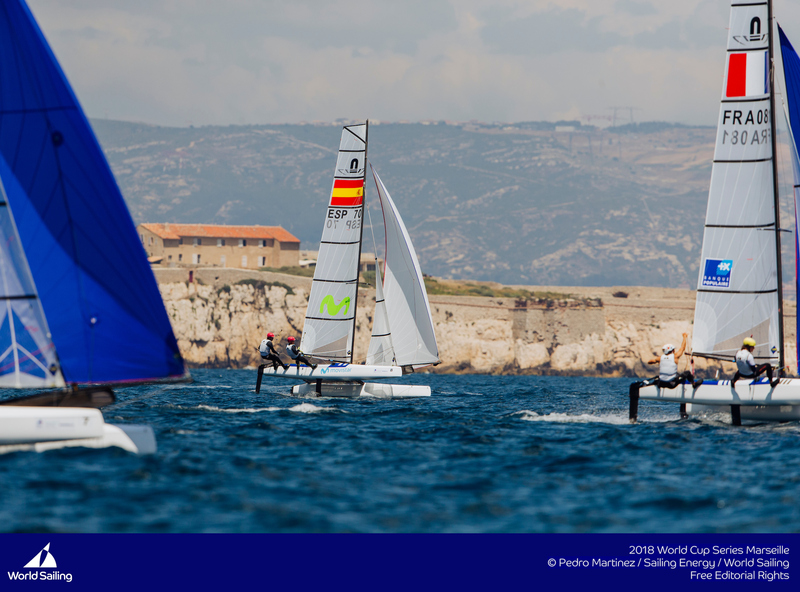 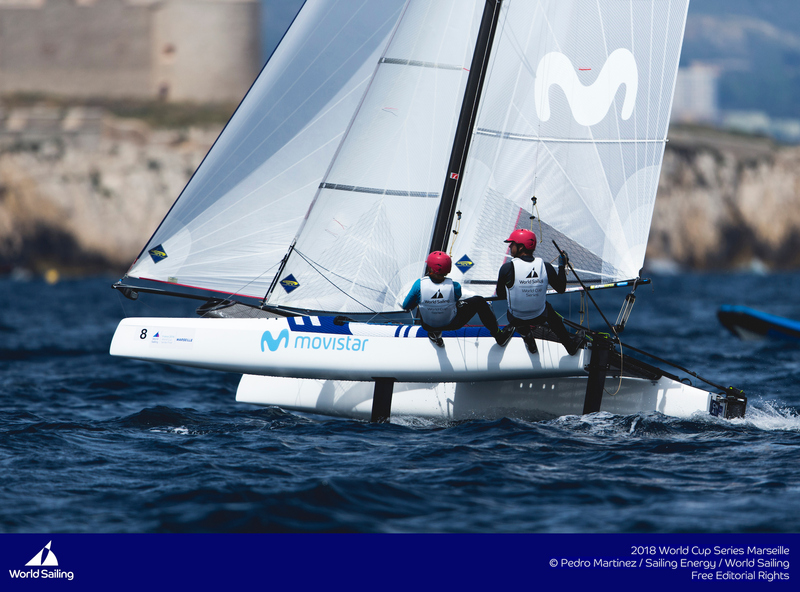 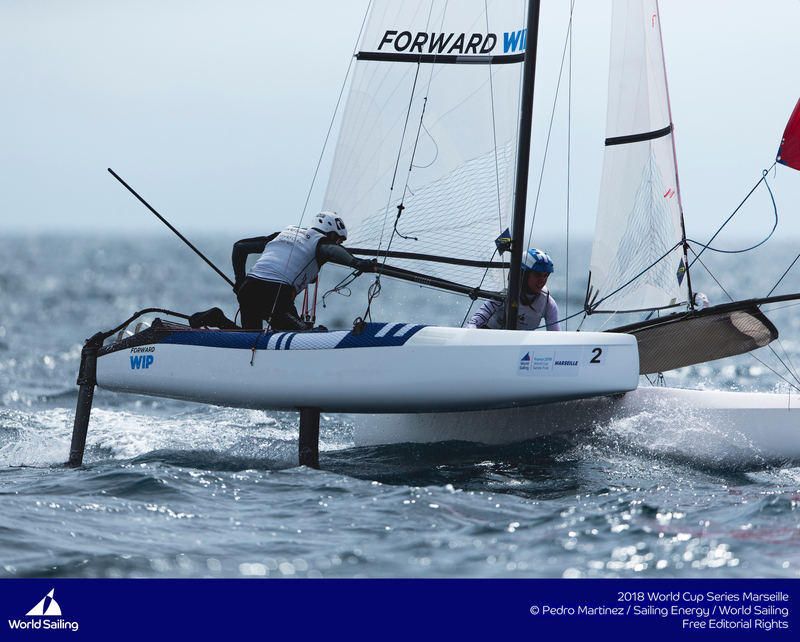 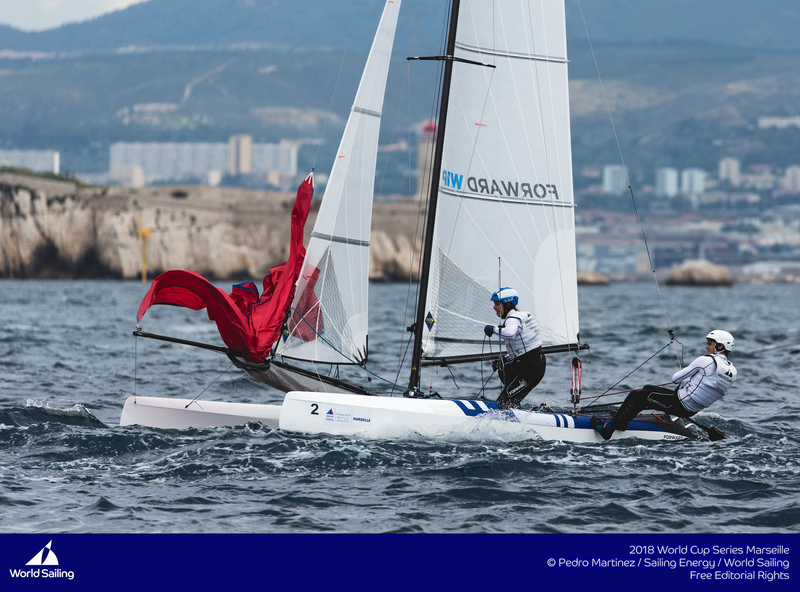 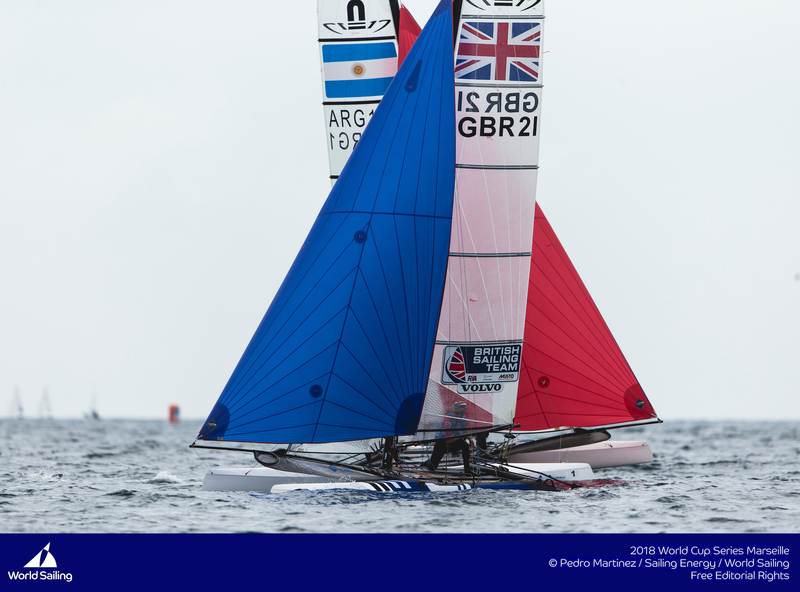 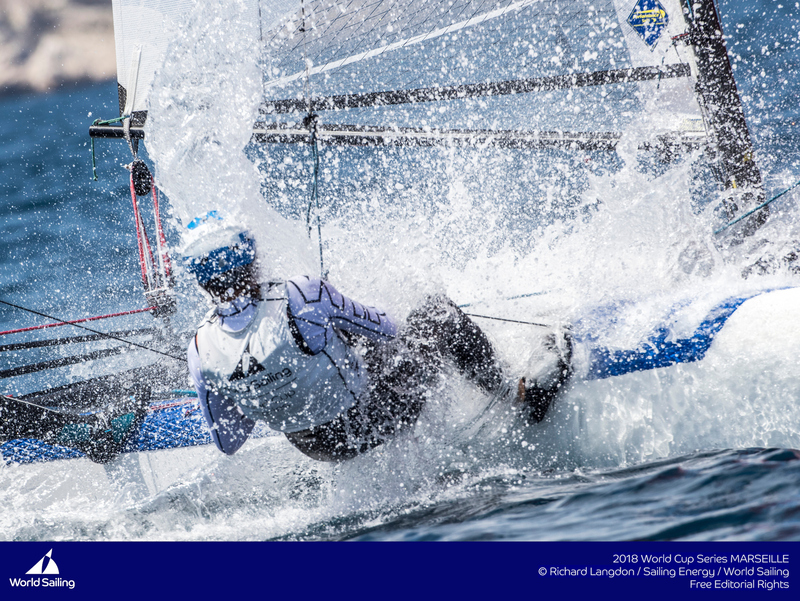 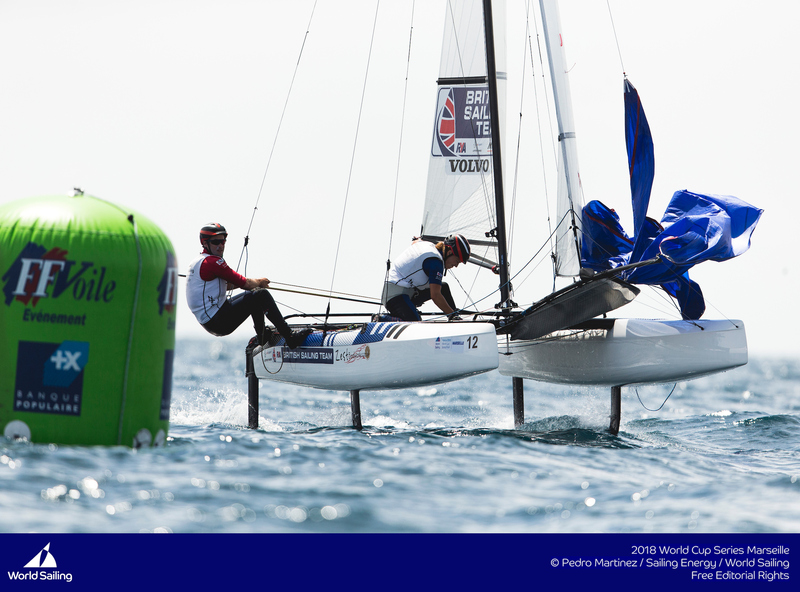 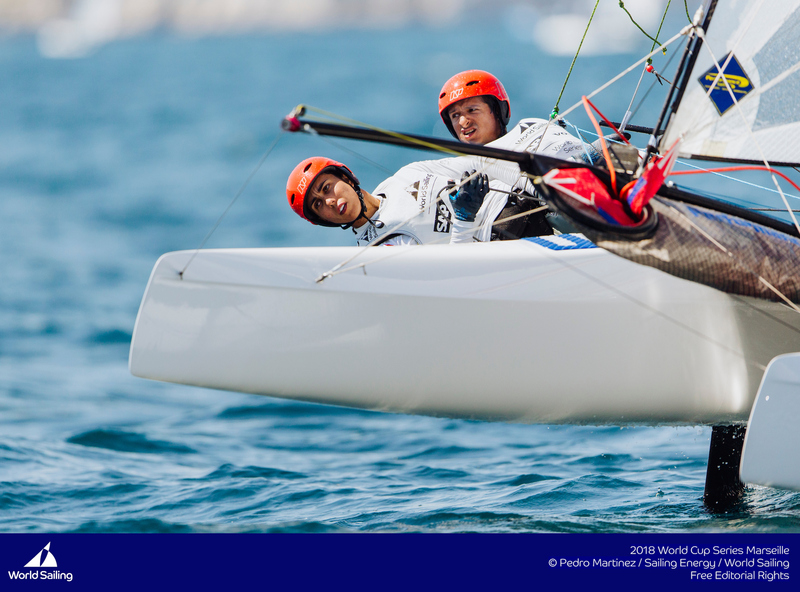 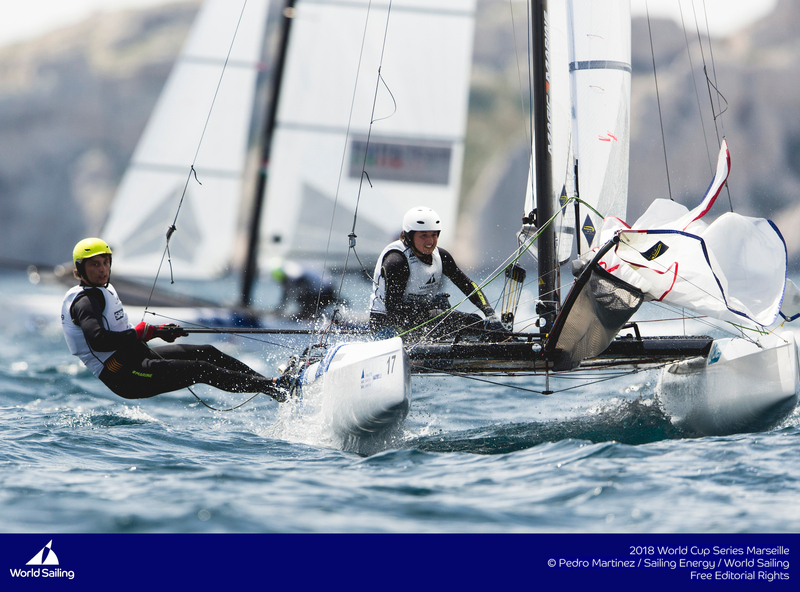 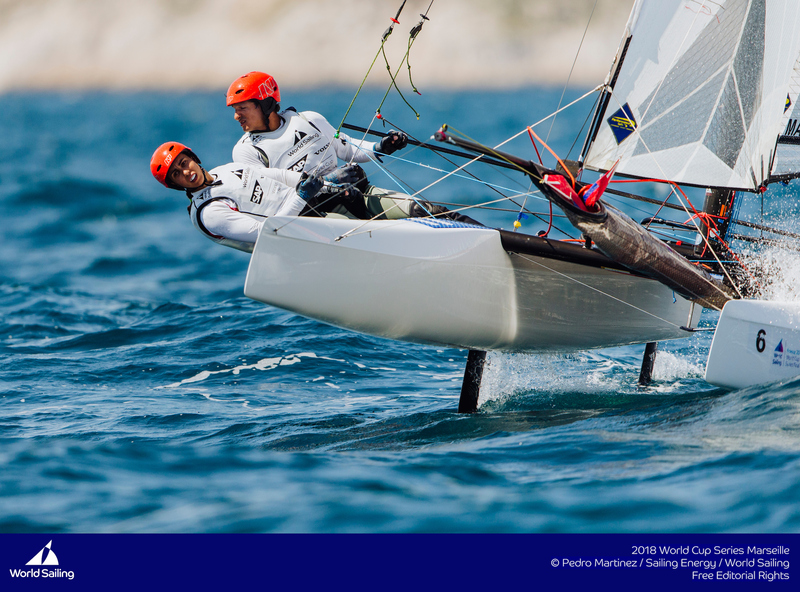 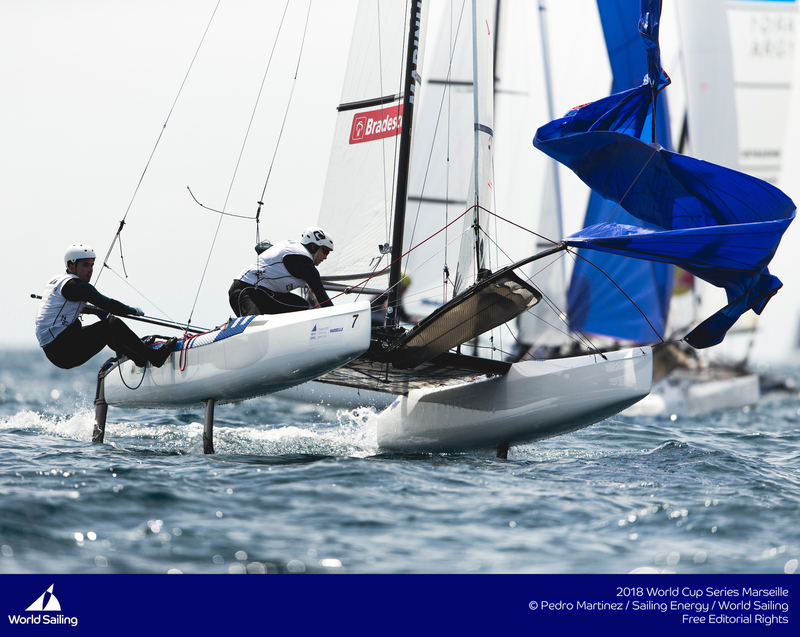 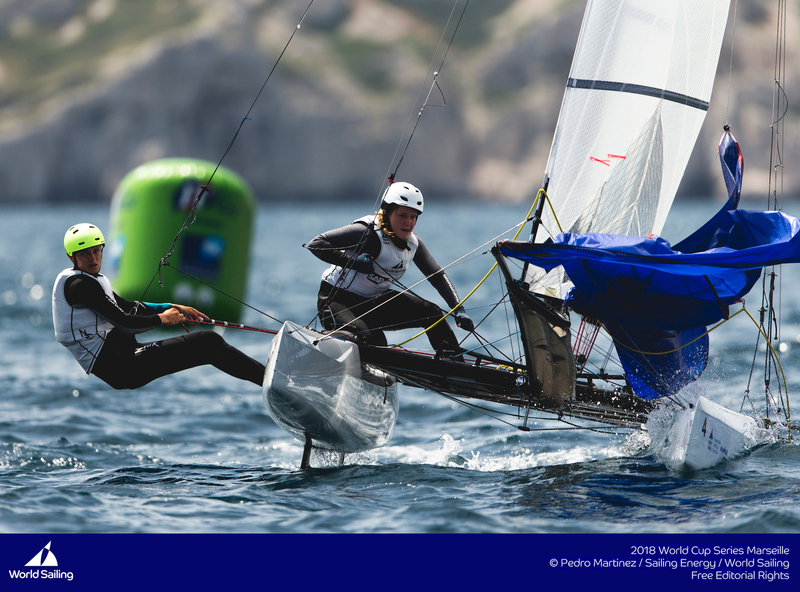 Sail number 1, Santiago Lange and Cecilia Carranza (ARG) took the win, in what was quite a competitive regatta. 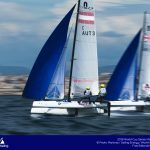 The only race they won was the final race, but didn’t sail a poor race the whole series. 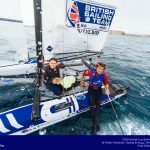 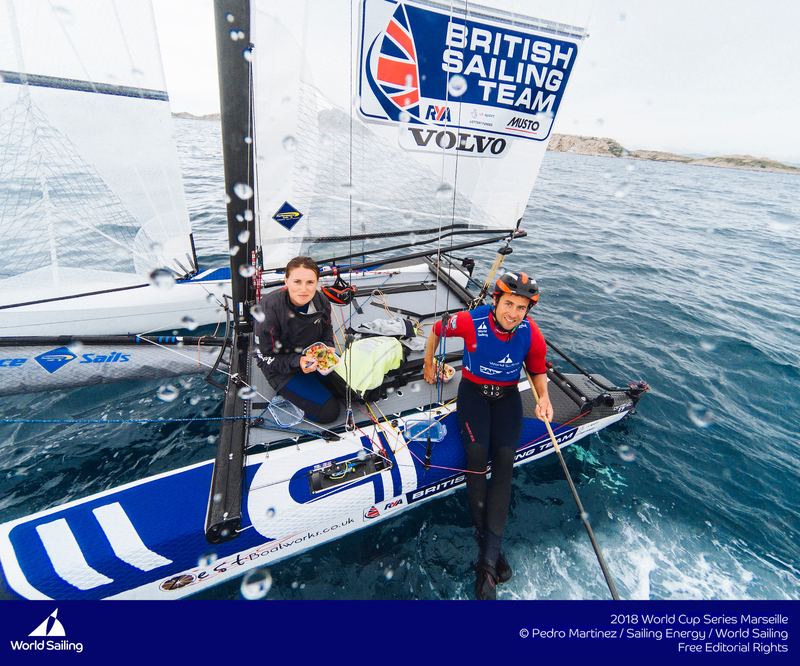 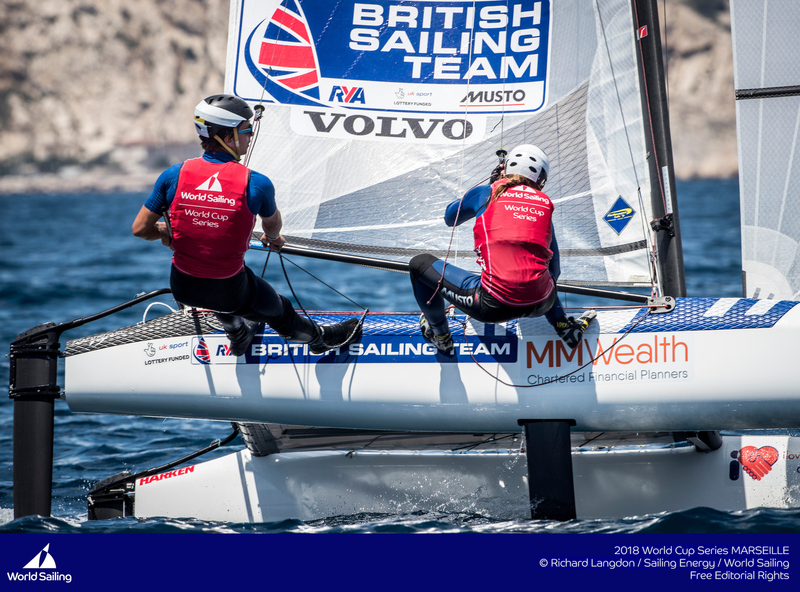 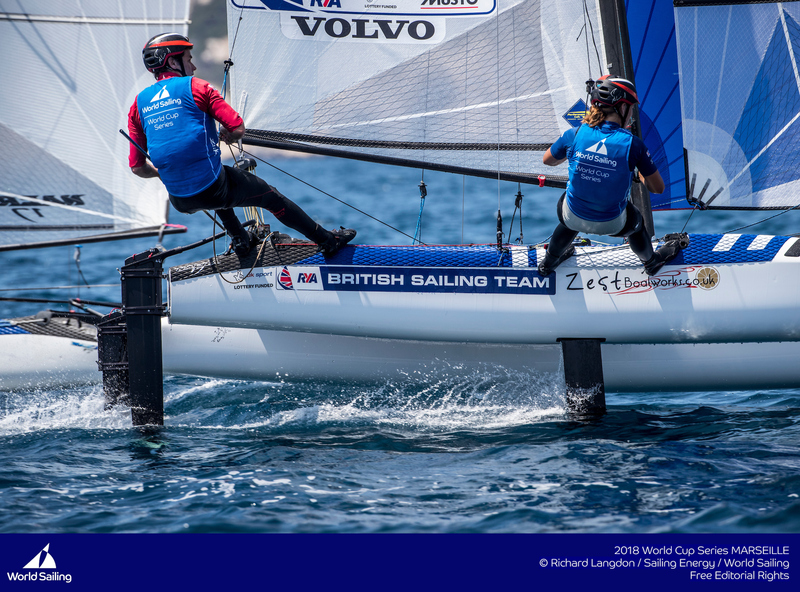 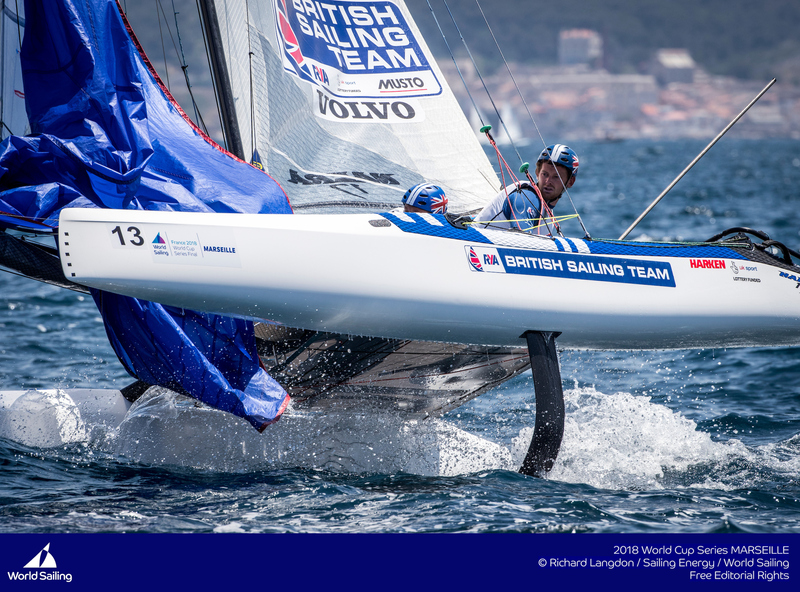 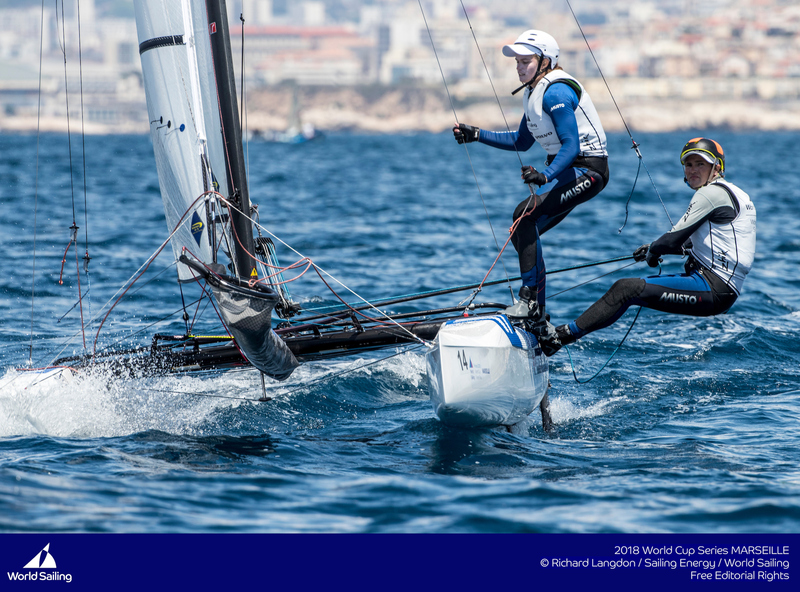 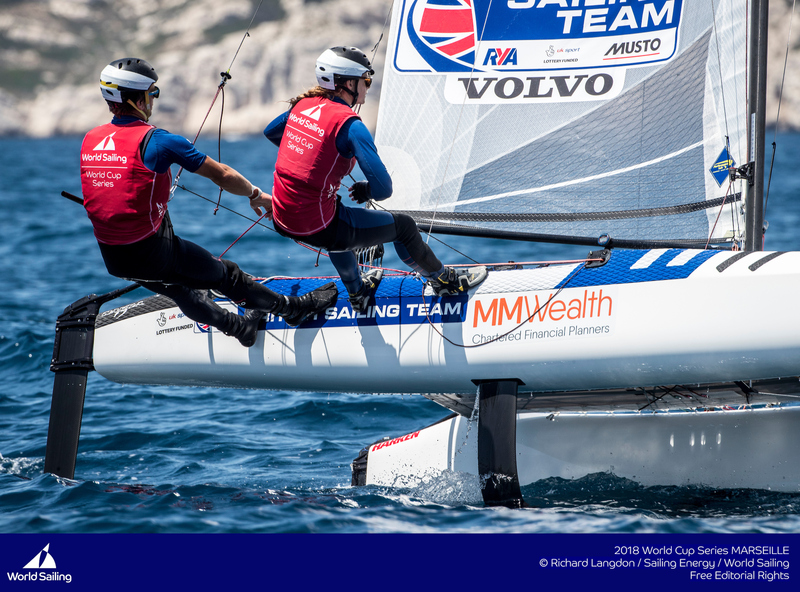 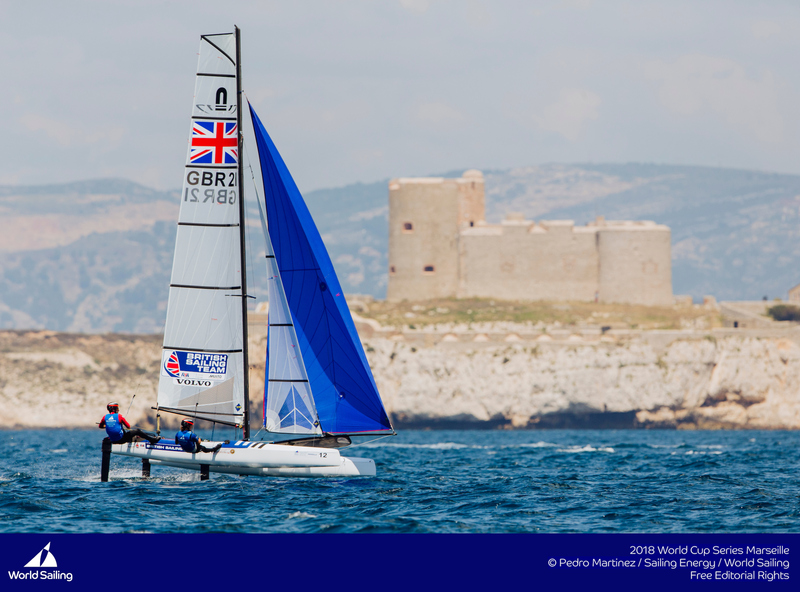 Winner of the 2017 Worlds, Ben Saxton and Katie Dabson (GBR) finished second with 2016 Olympic Bronze medalist Thomas Zajac with Barbara Matz finished 3rd. 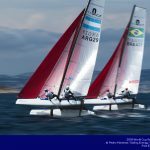 As a side note, sail number guru’s will note the Argi’s with sail number 1. 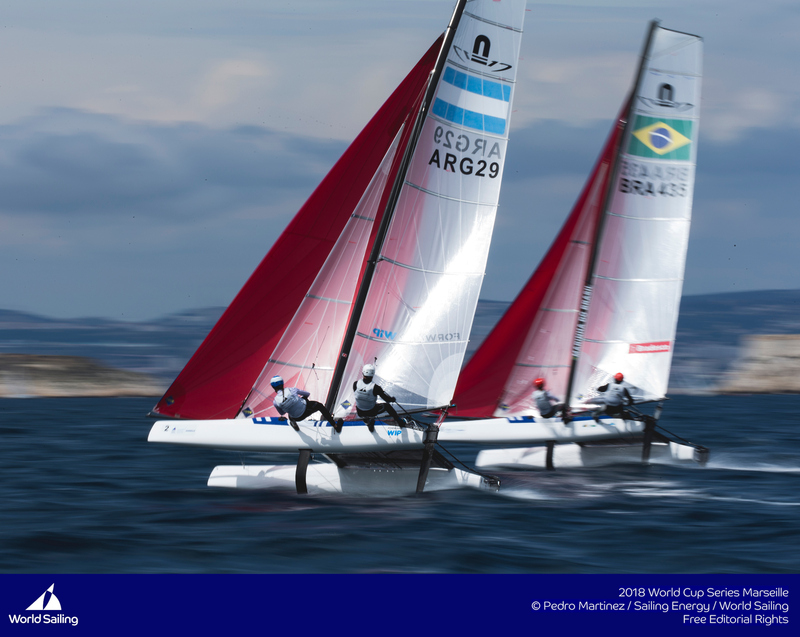 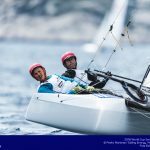 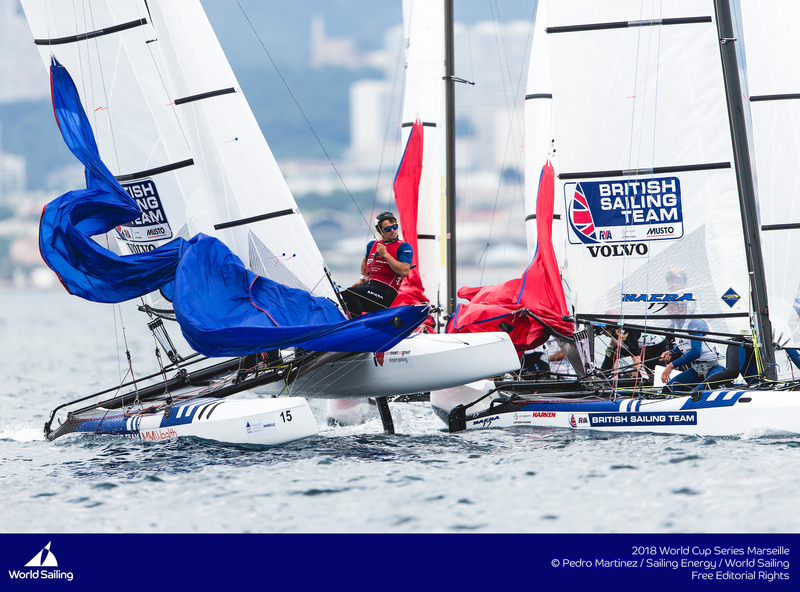 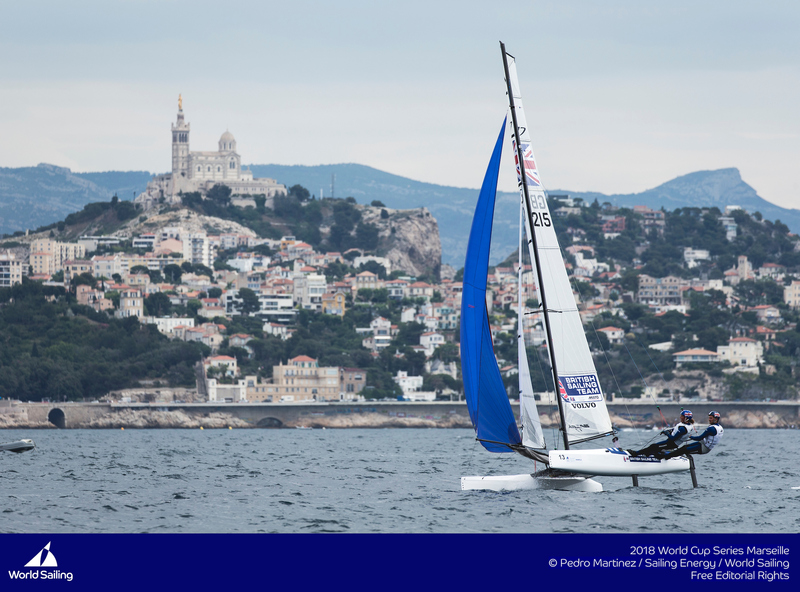 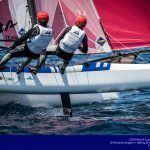 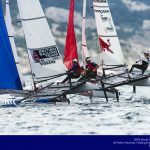 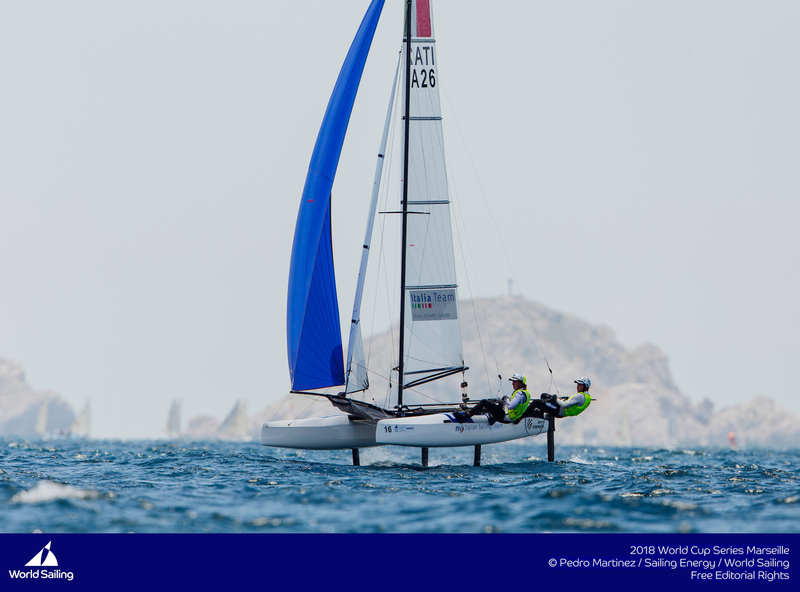 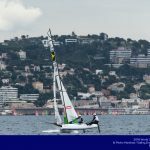 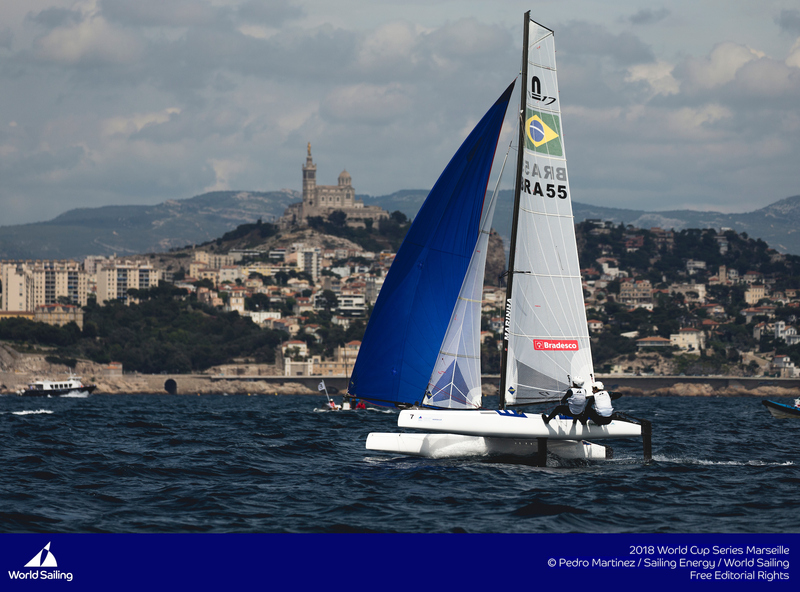 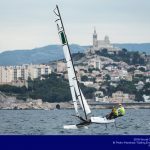 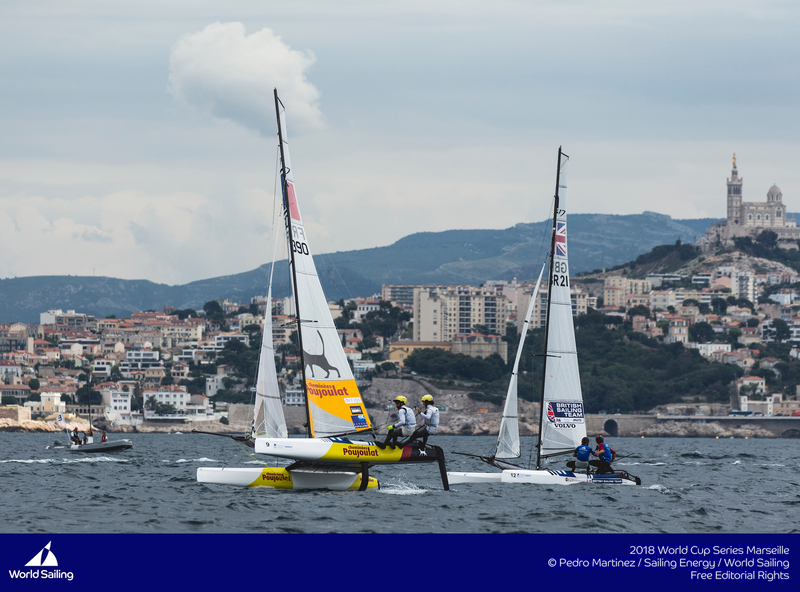 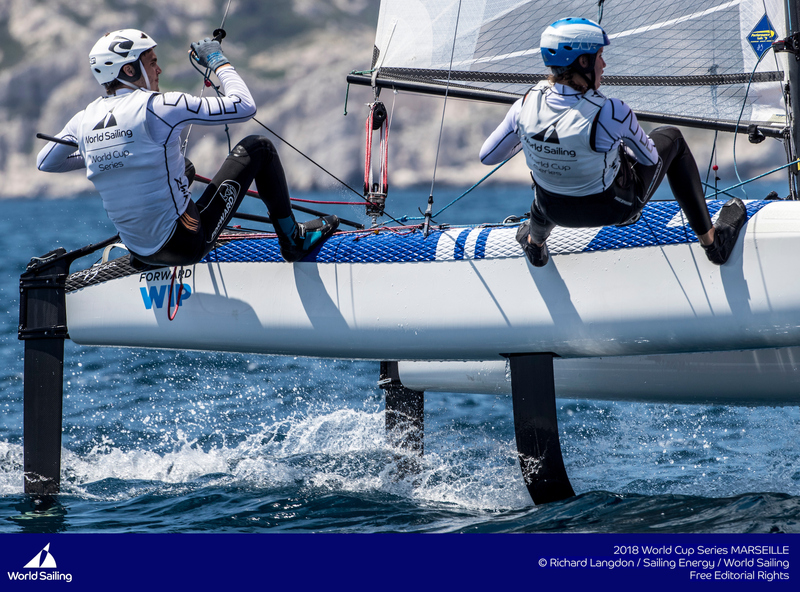 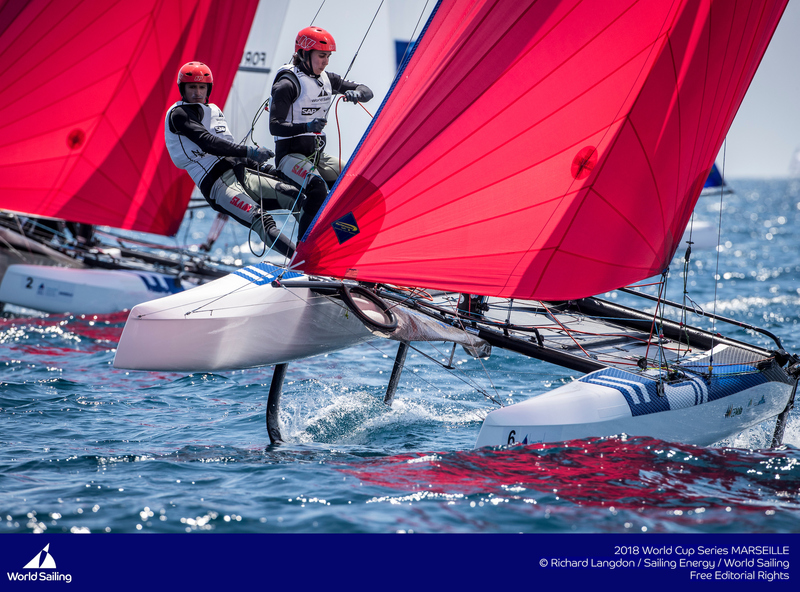 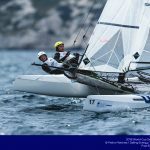 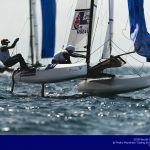 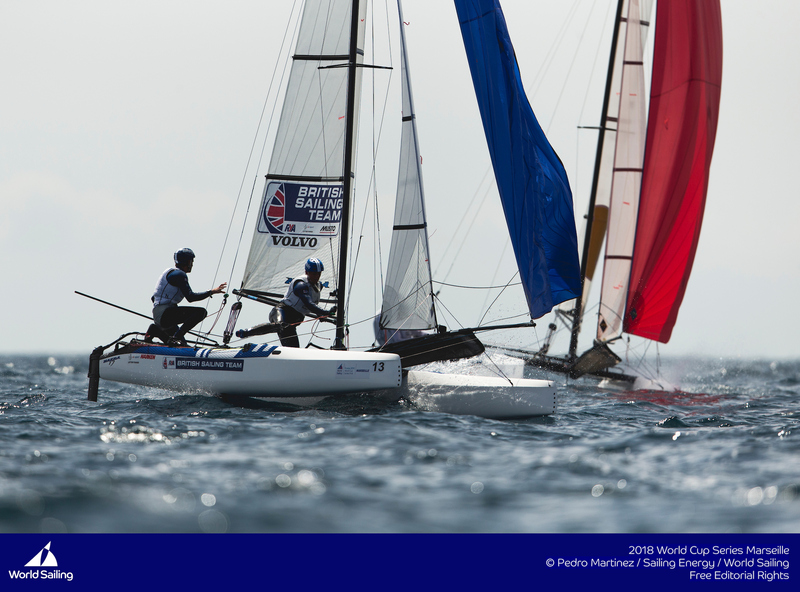 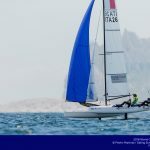 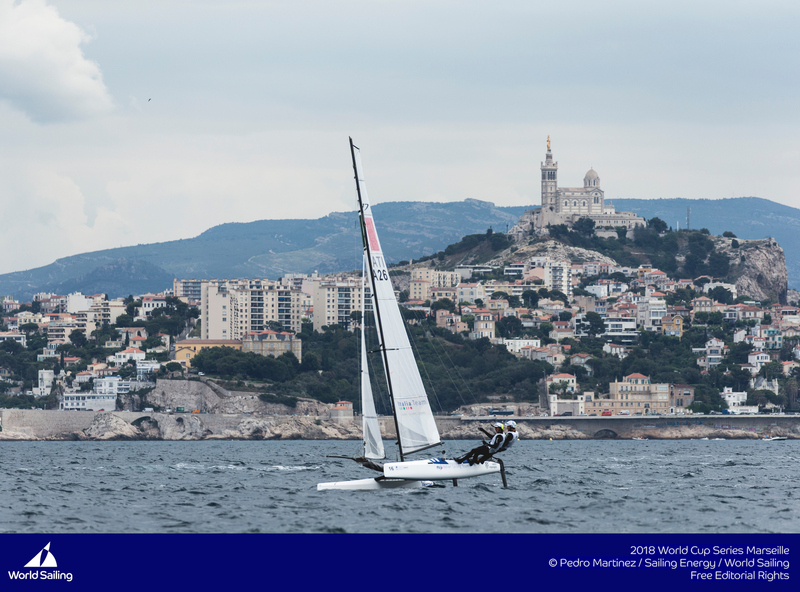 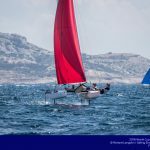 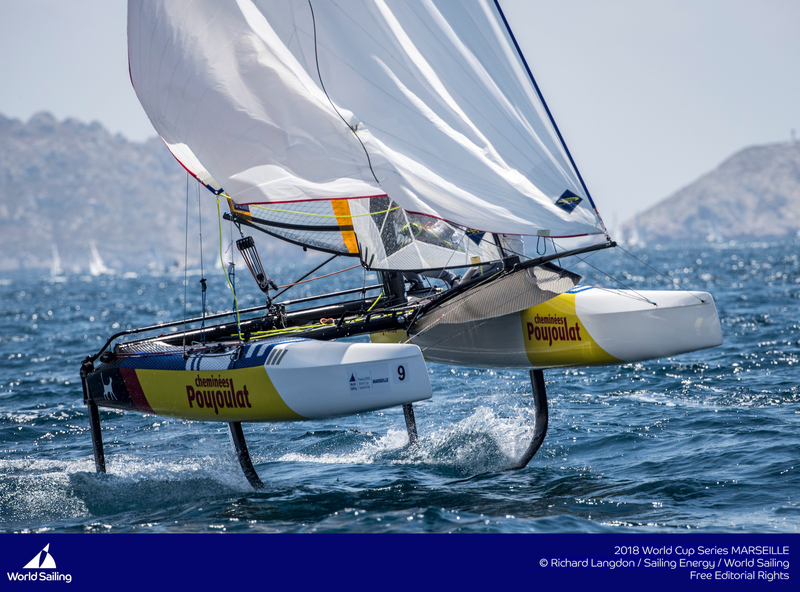 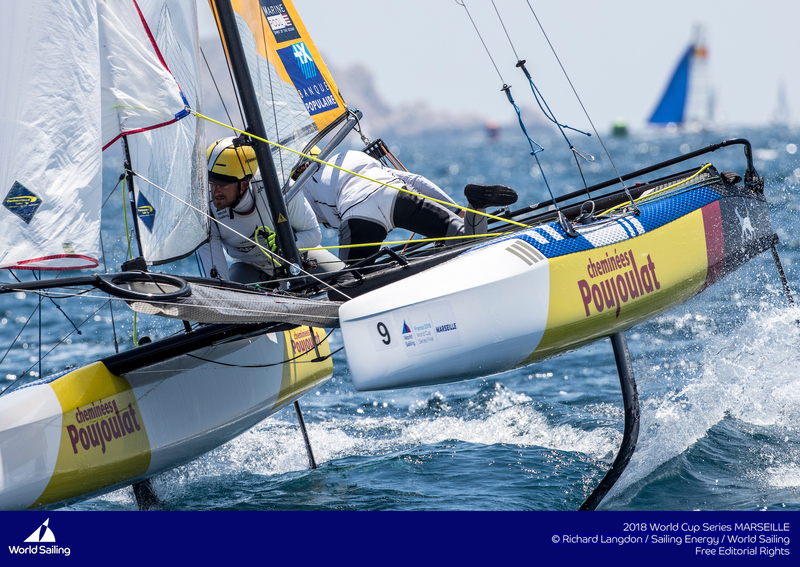 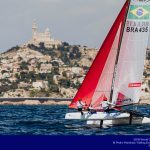 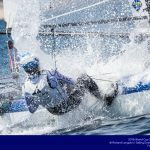 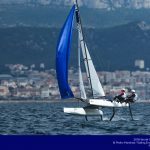 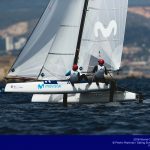 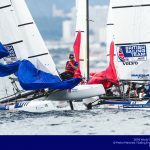 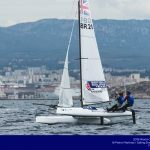 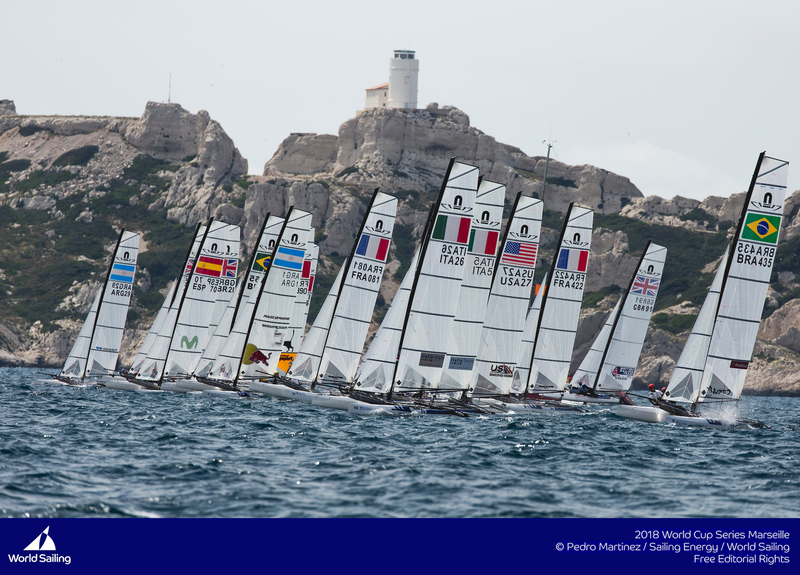 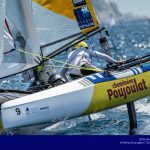 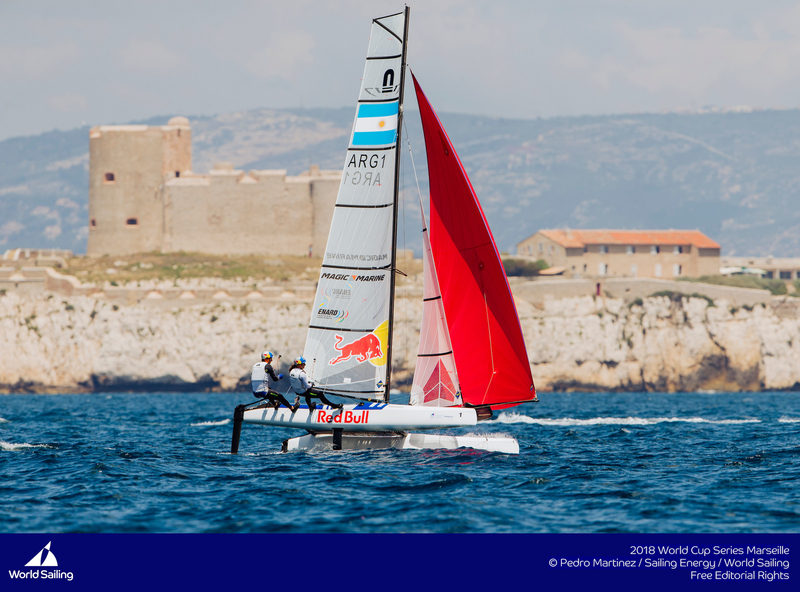 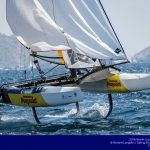 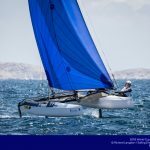 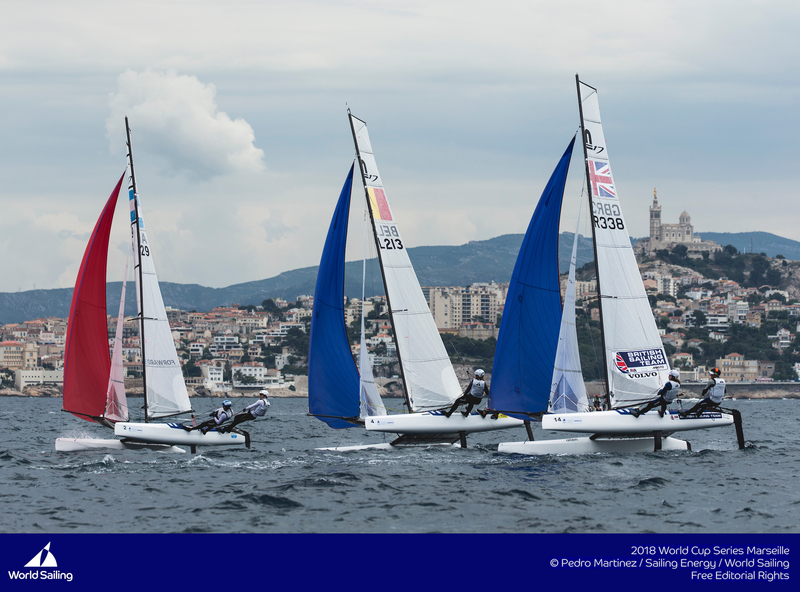 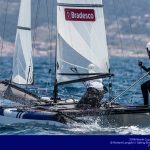 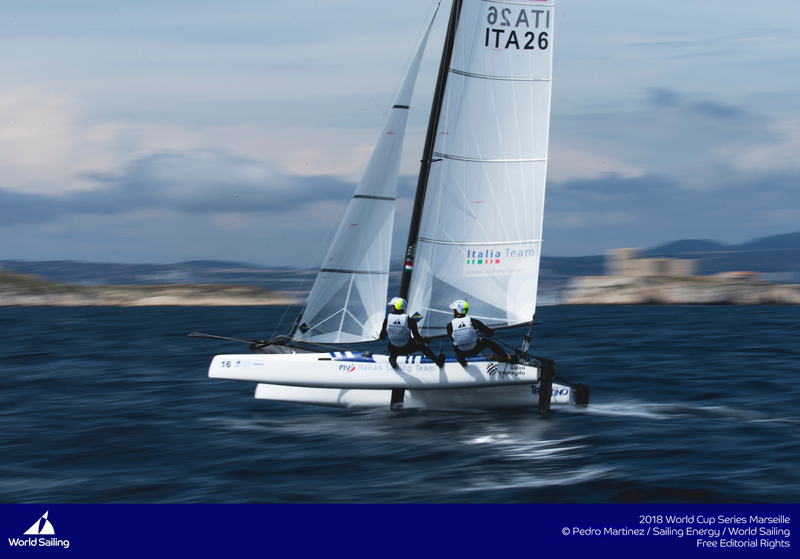 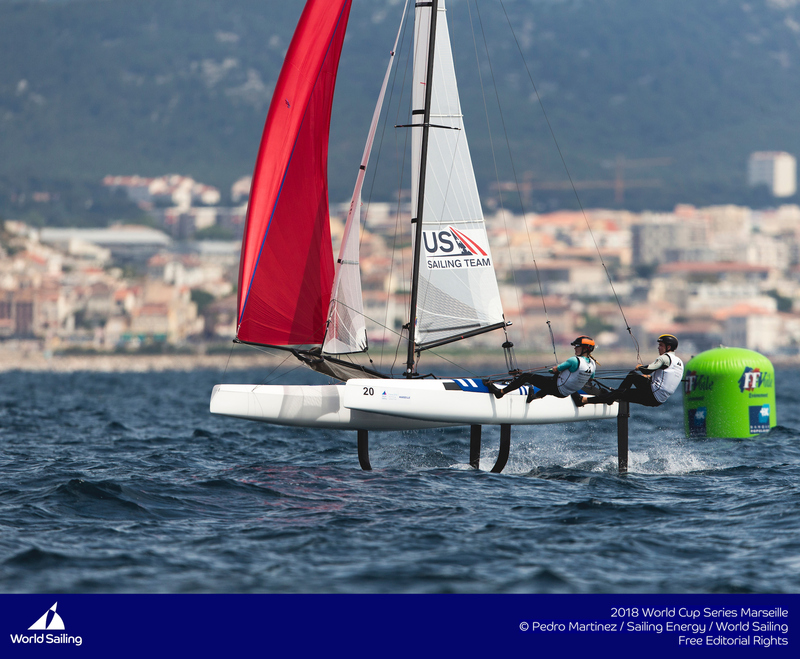 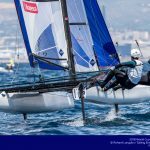 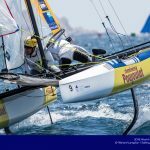 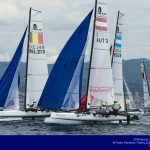 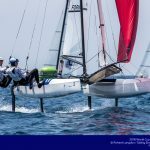 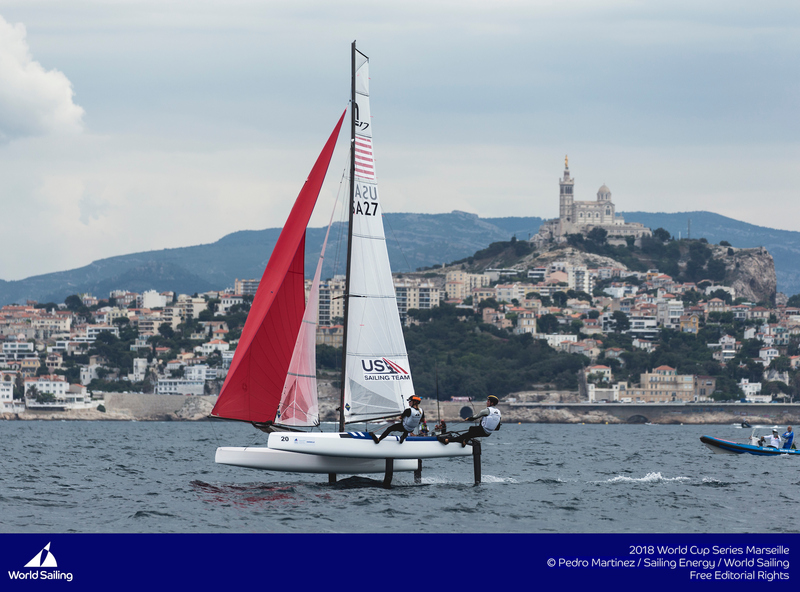 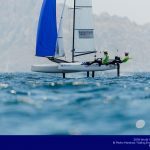 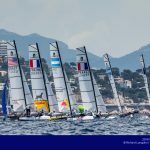 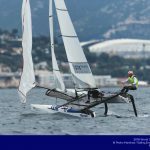 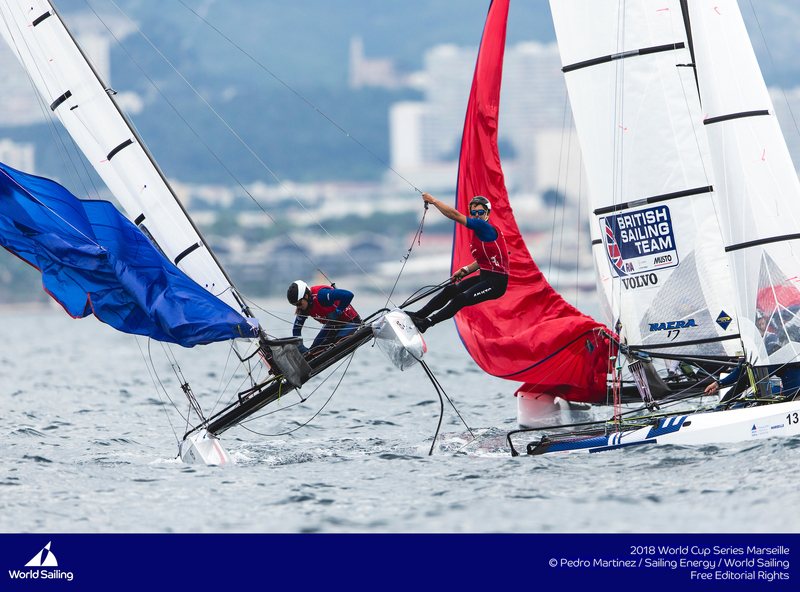 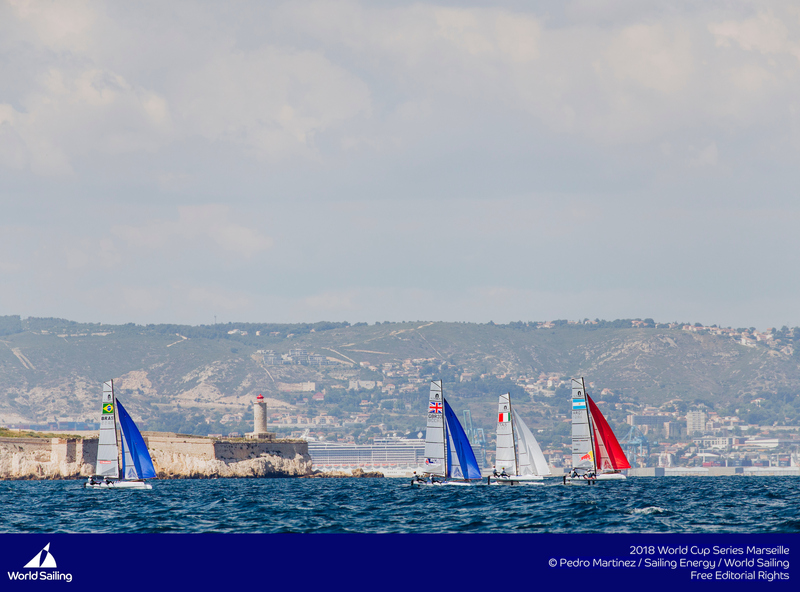 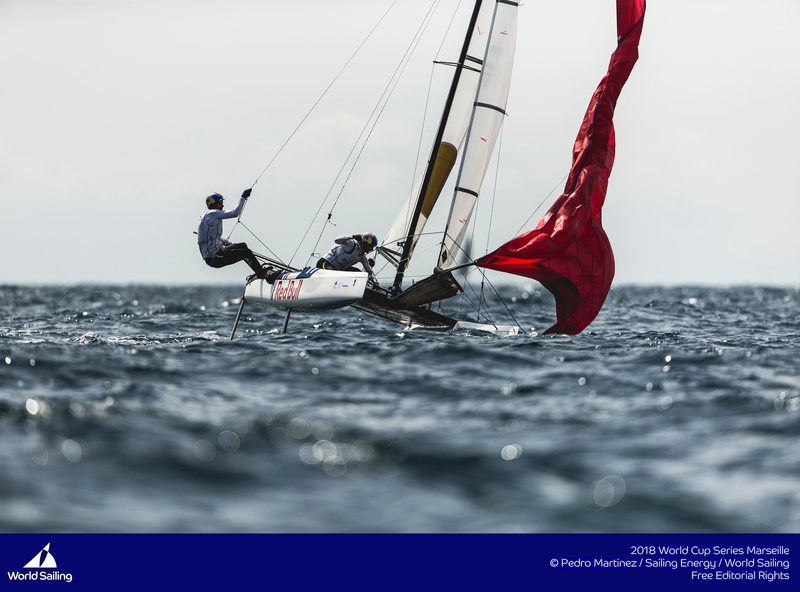 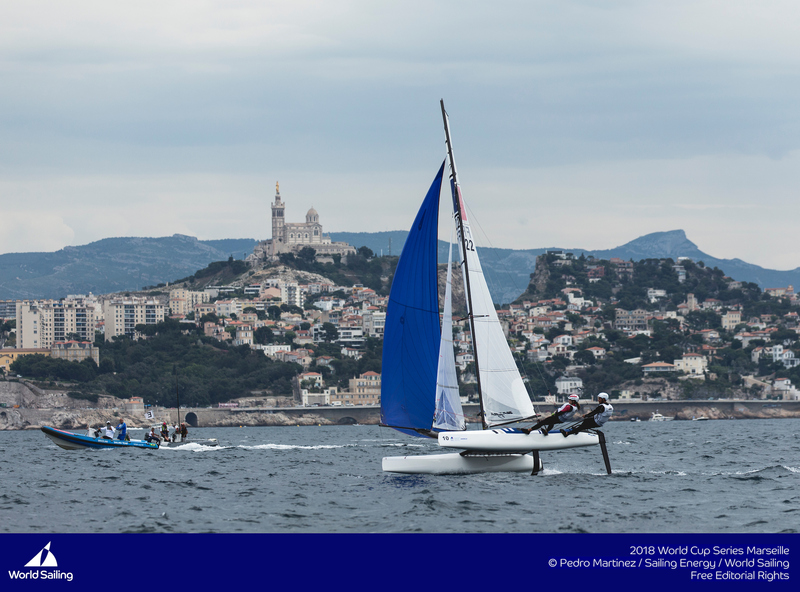 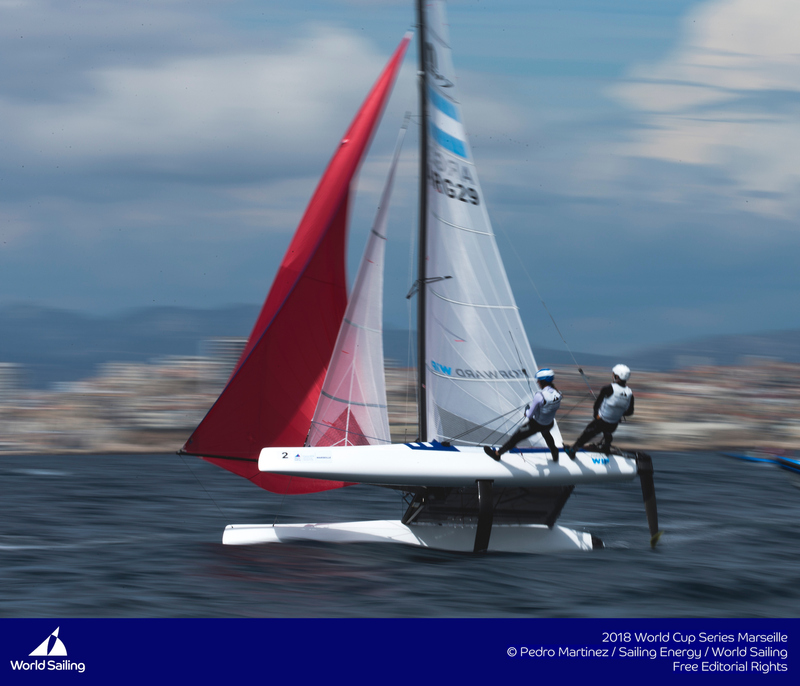 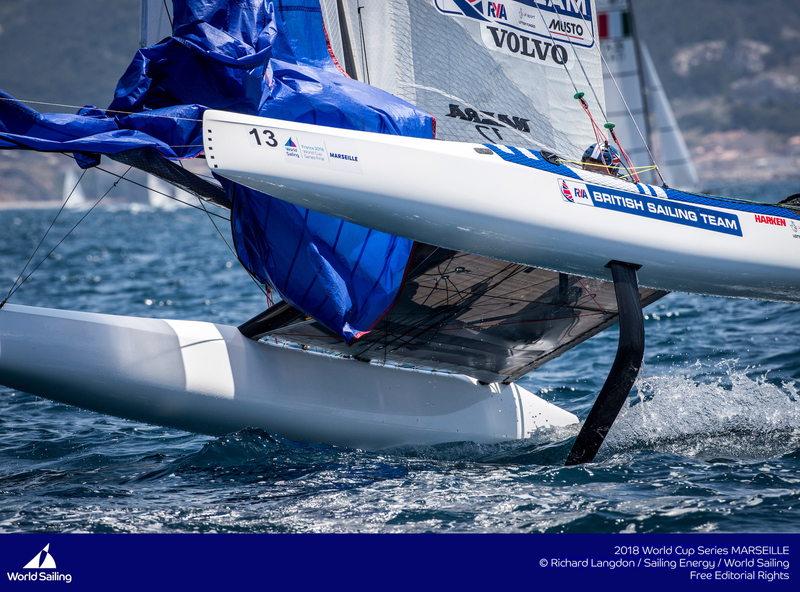 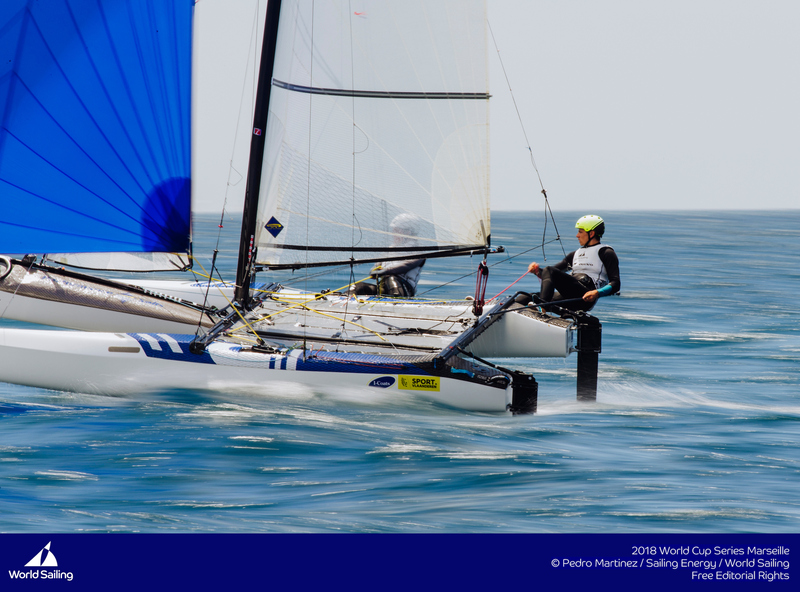 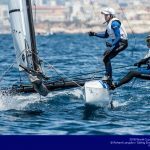 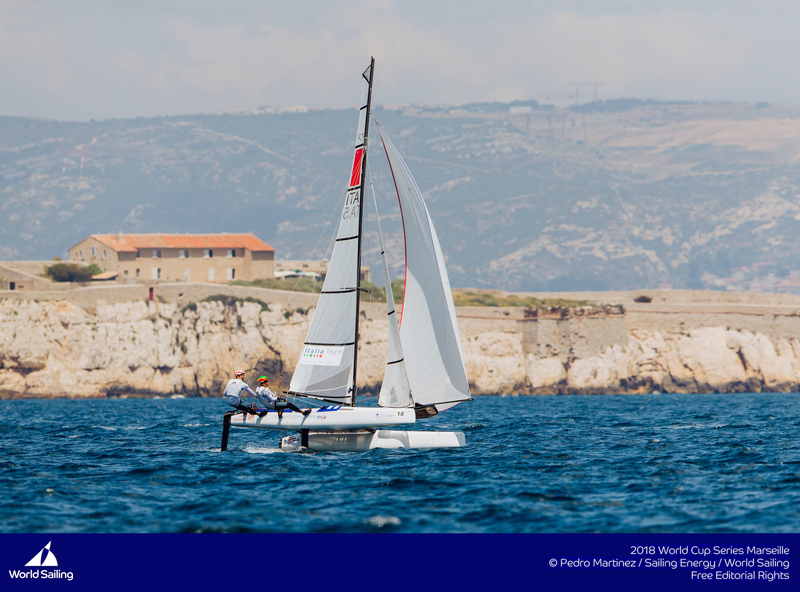 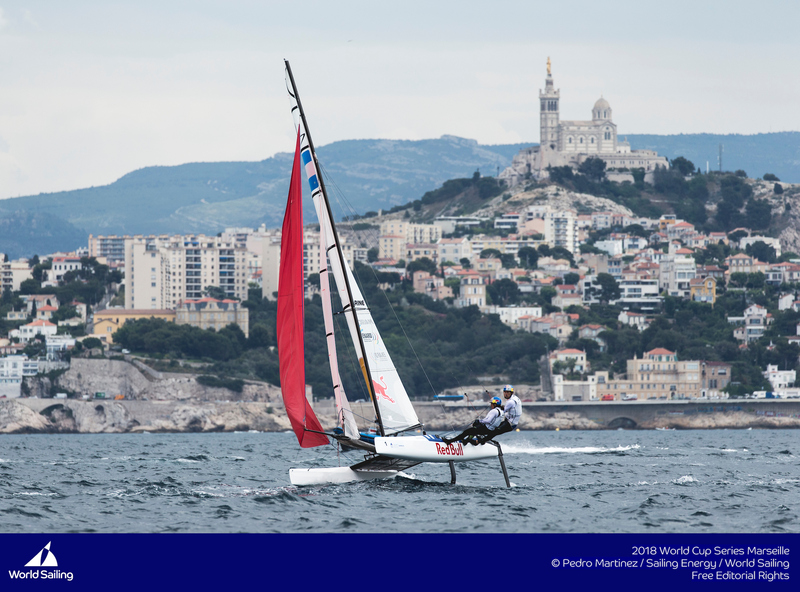 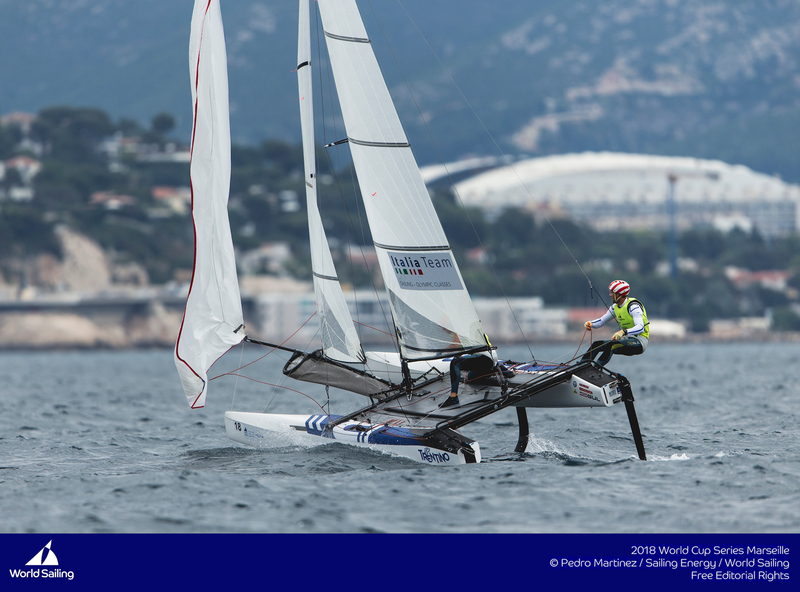 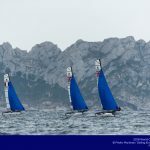 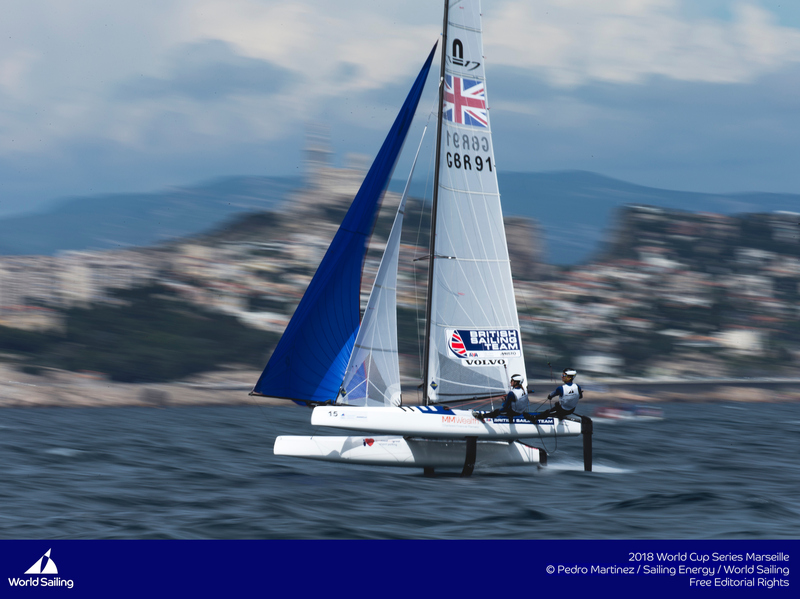 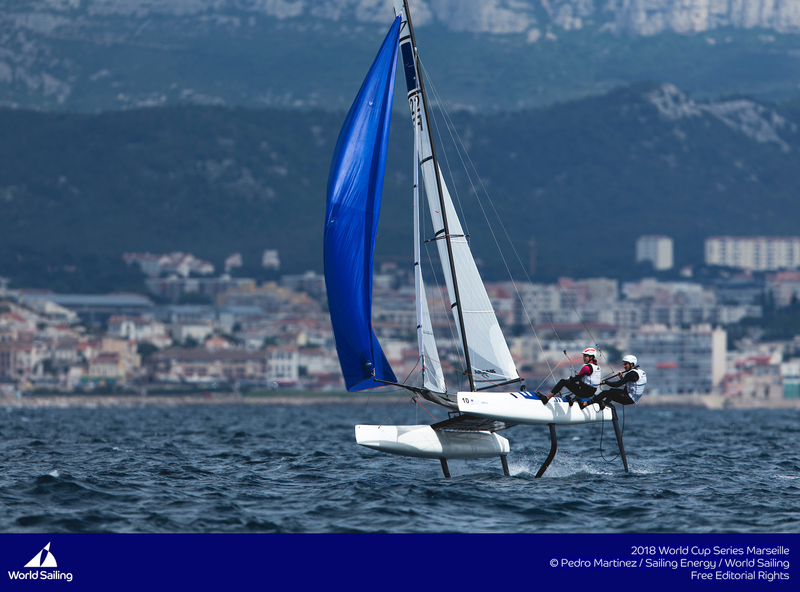 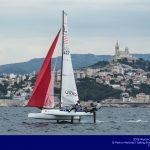 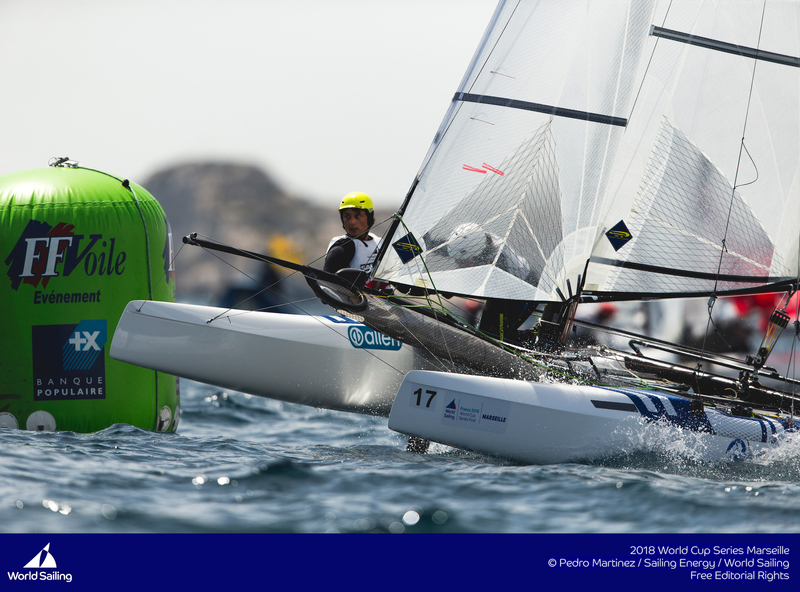 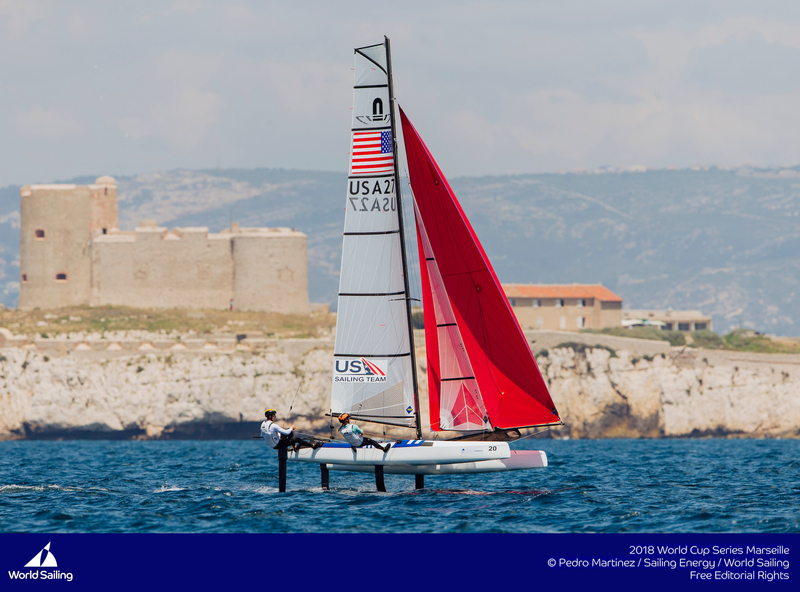 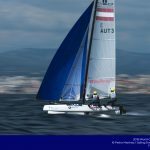 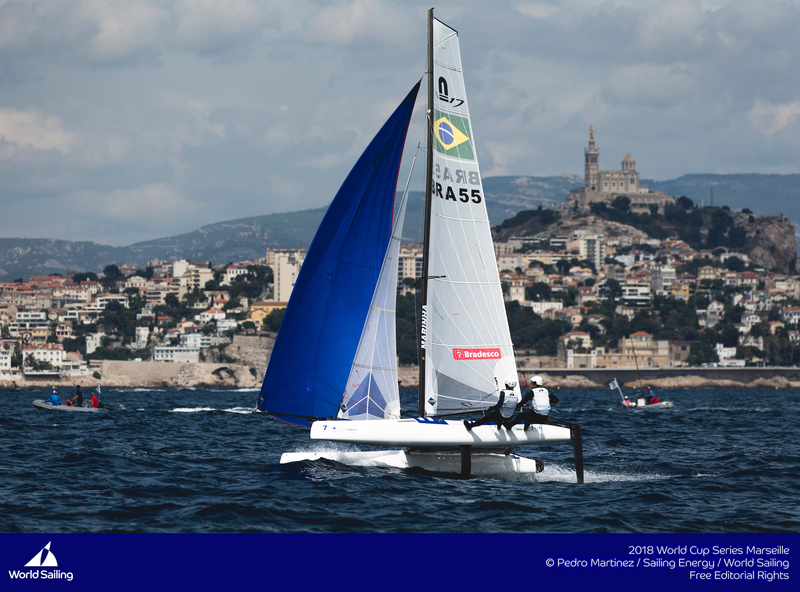 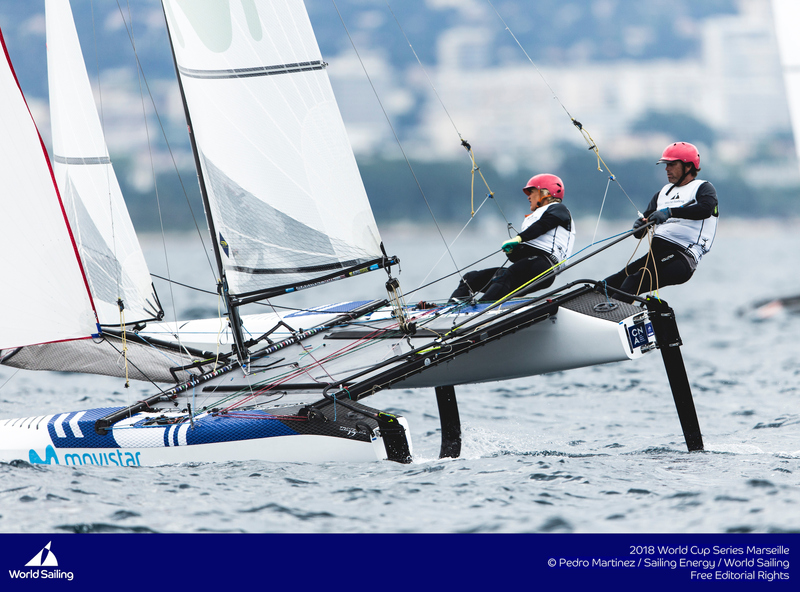 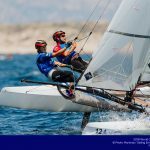 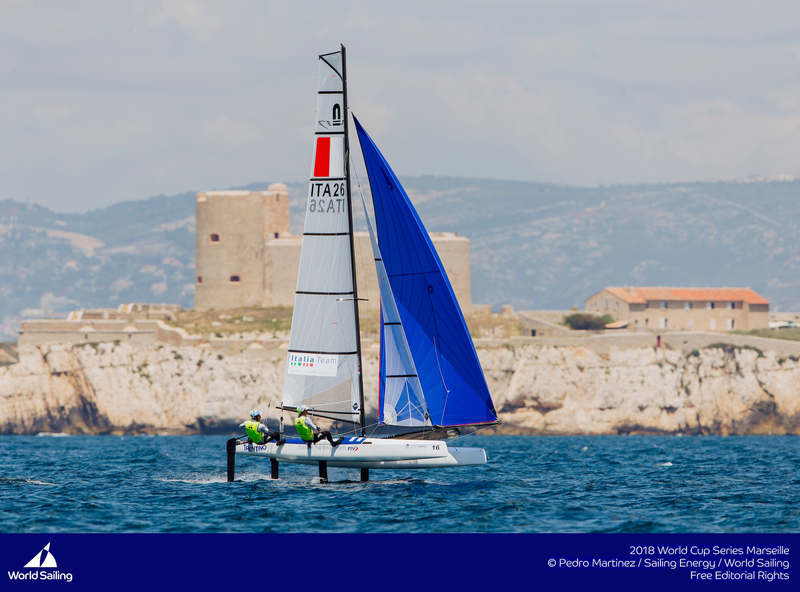 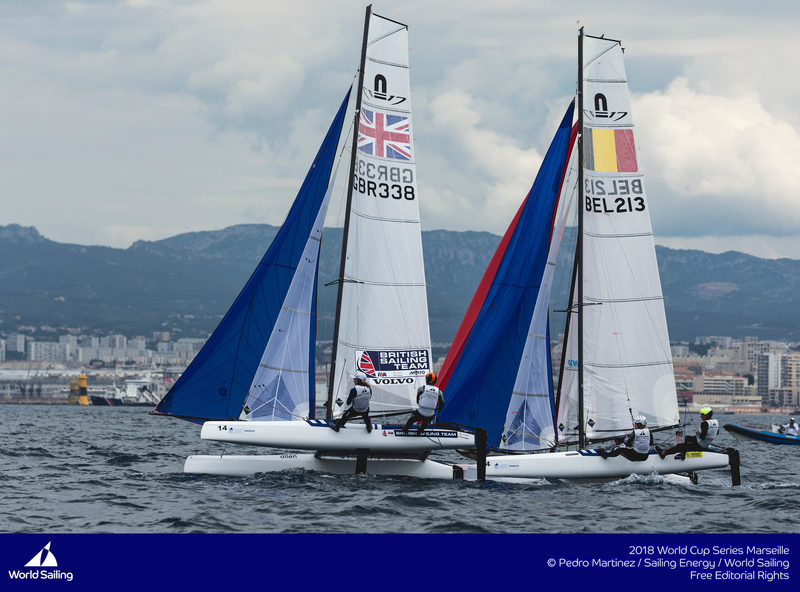 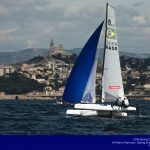 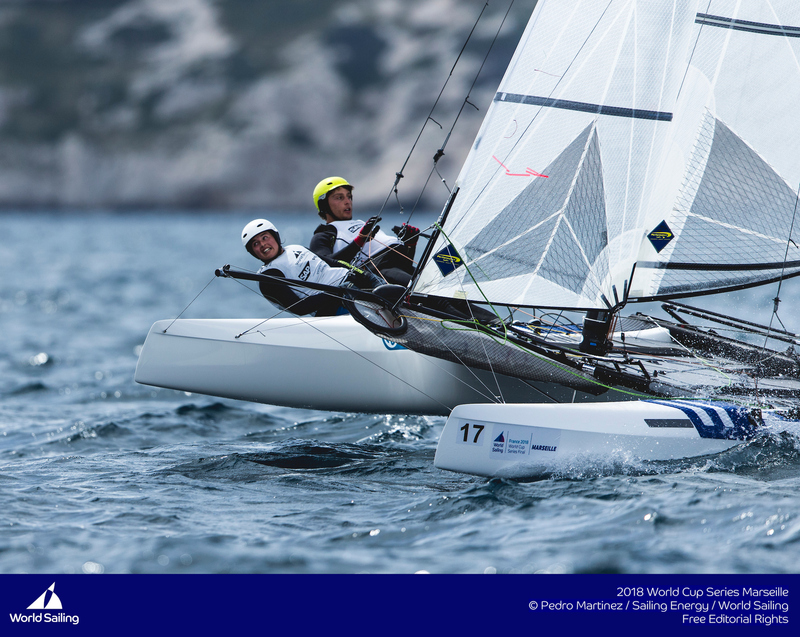 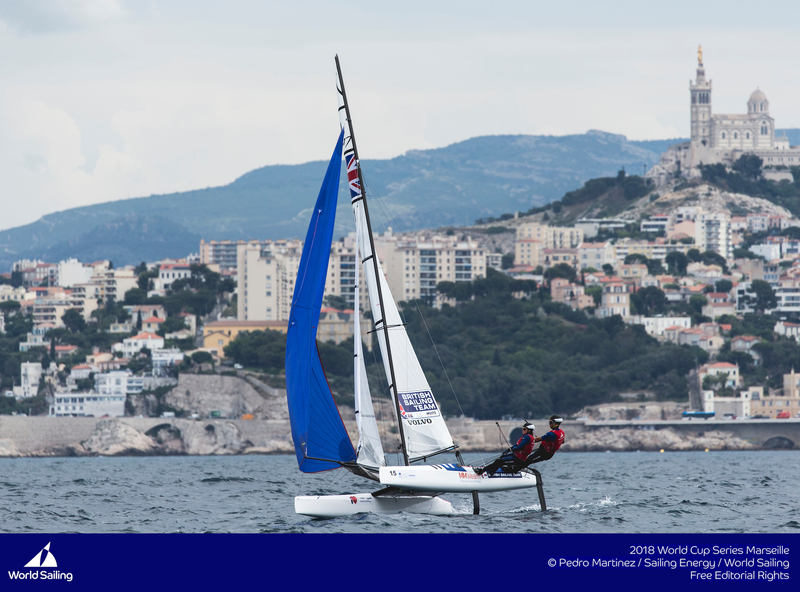 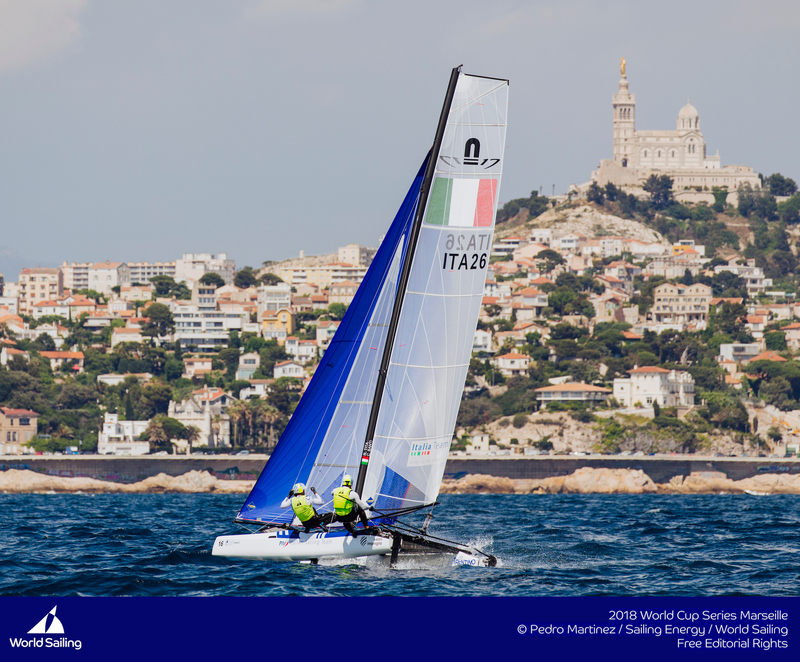 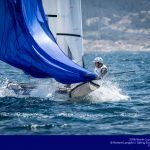 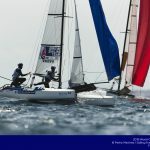 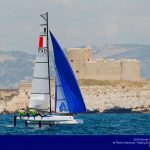 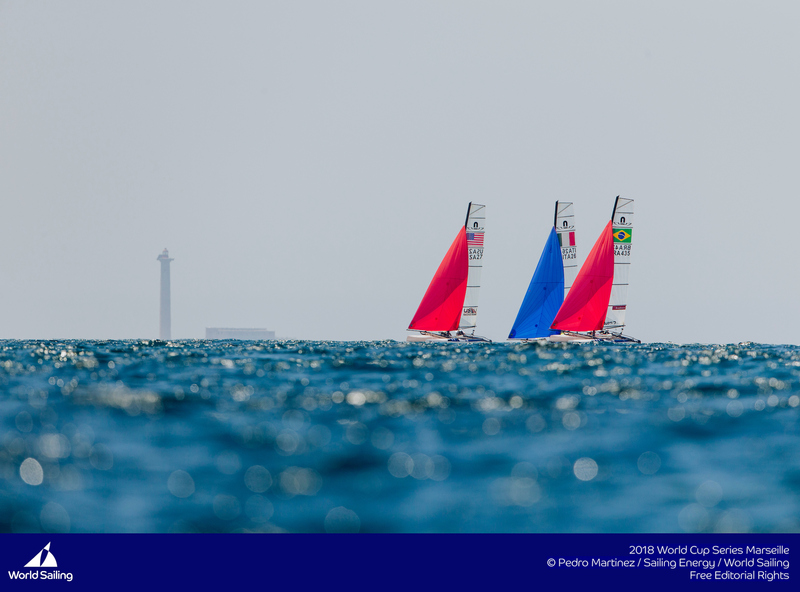 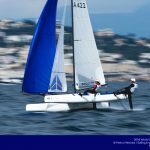 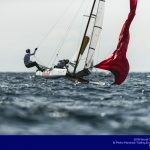 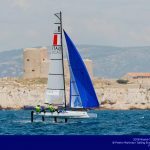 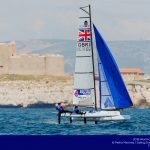 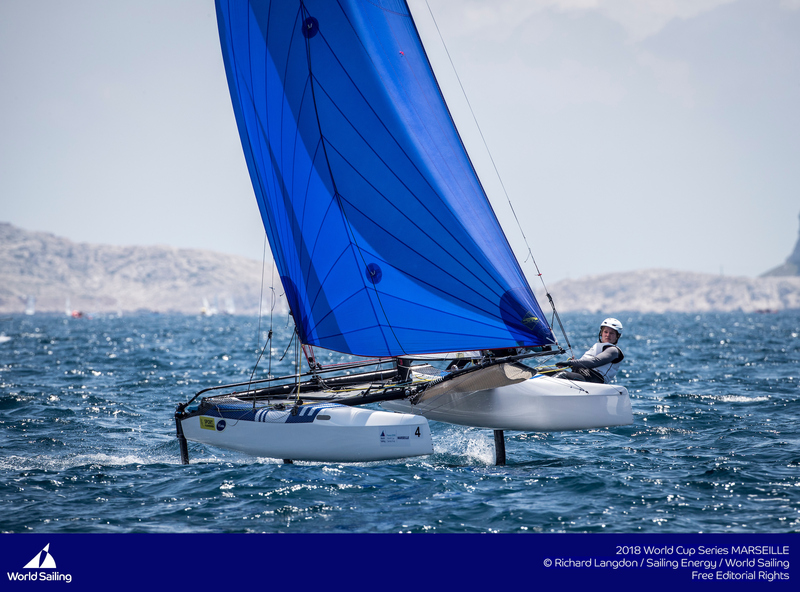 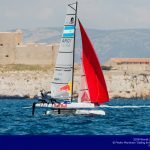 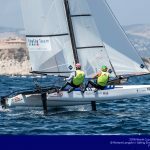 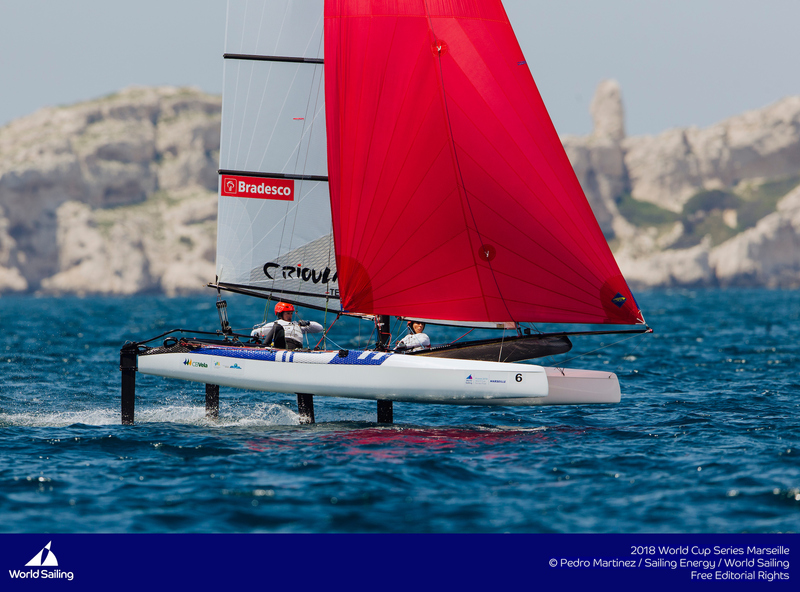 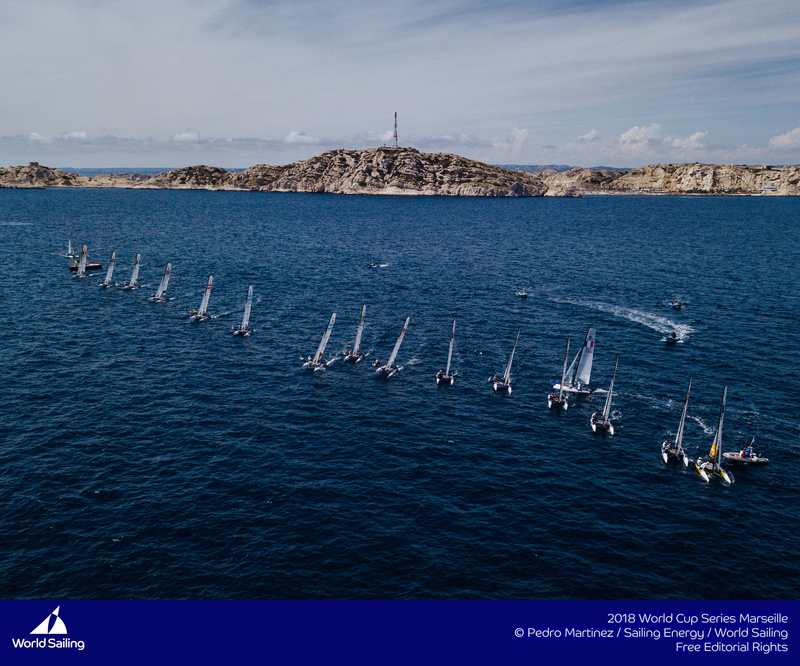 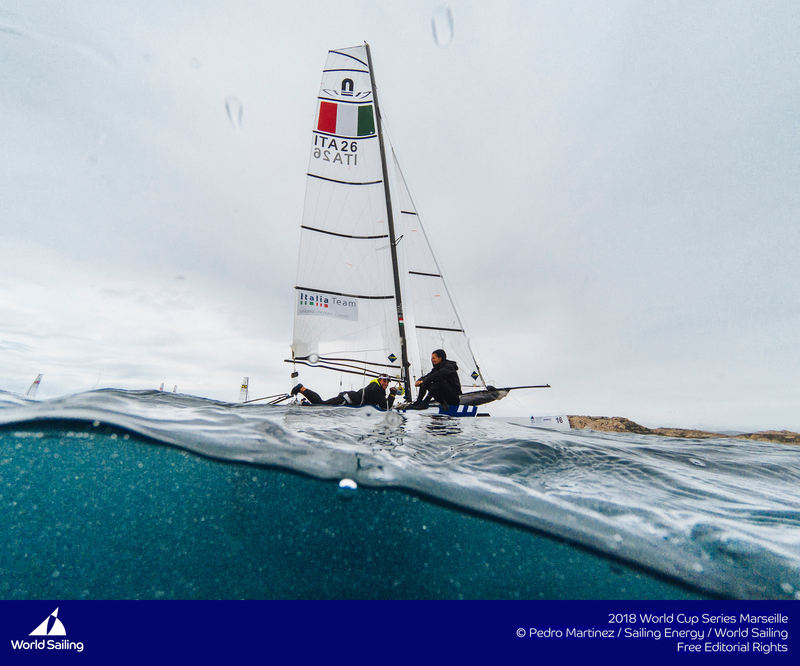 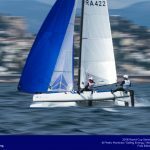 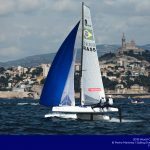 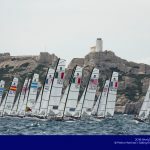 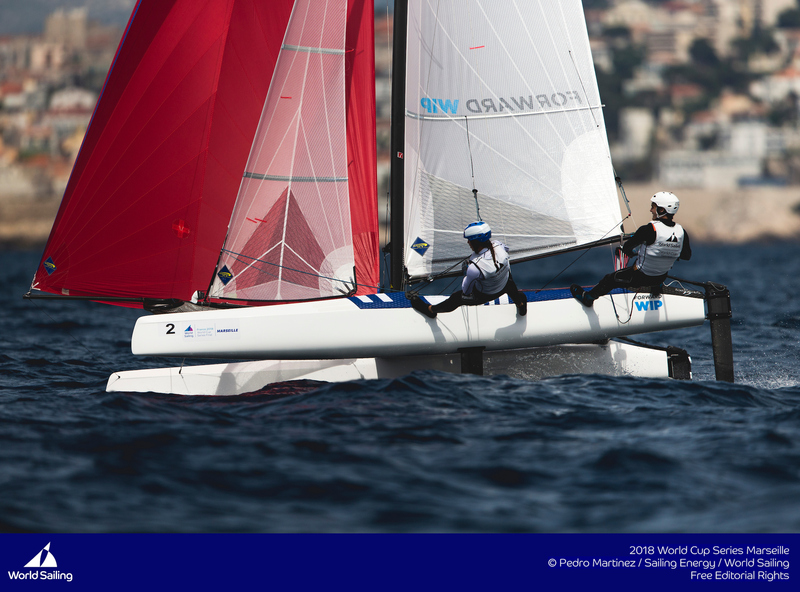 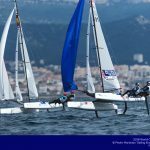 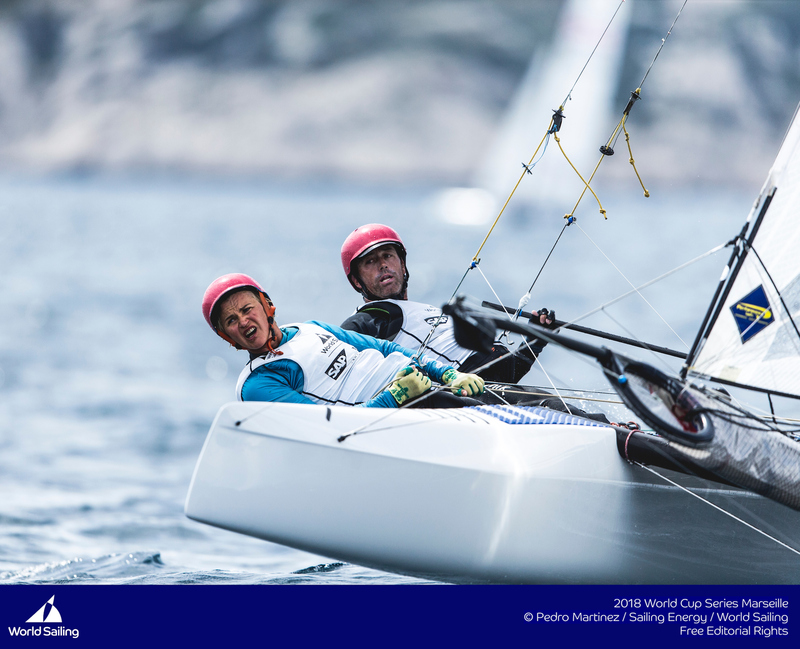 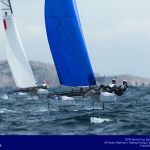 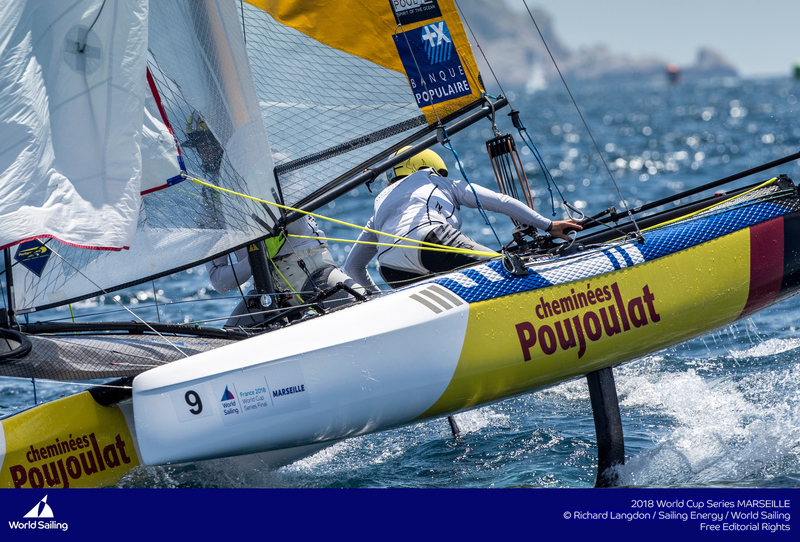 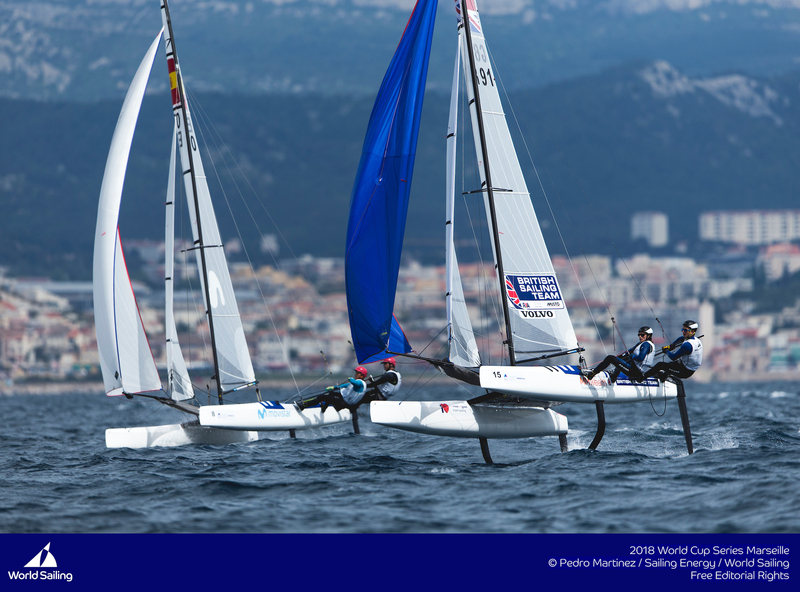 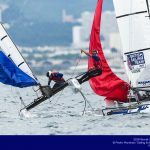 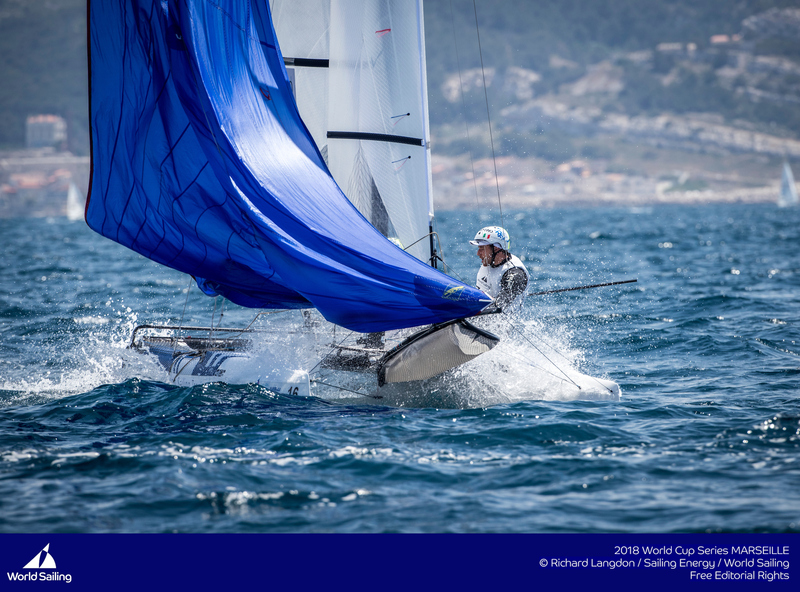 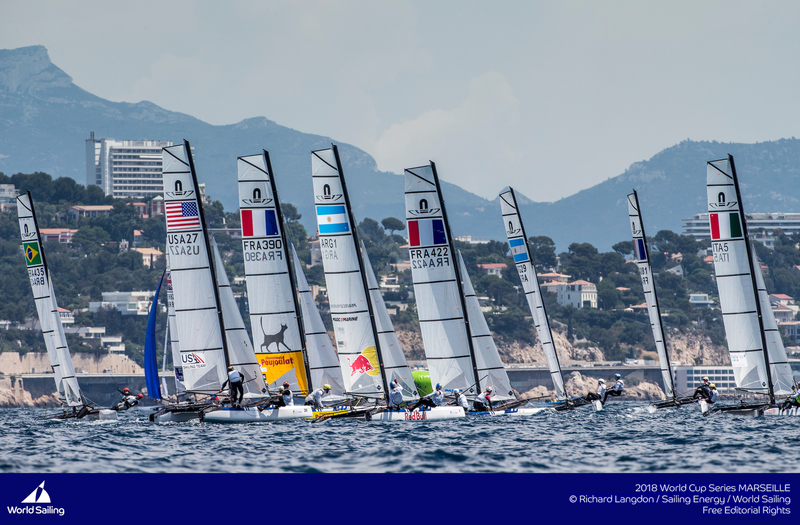 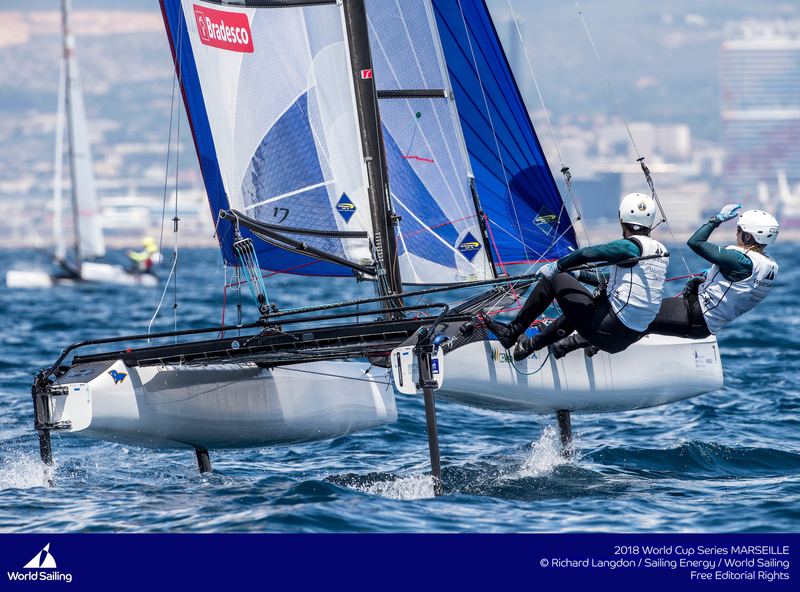 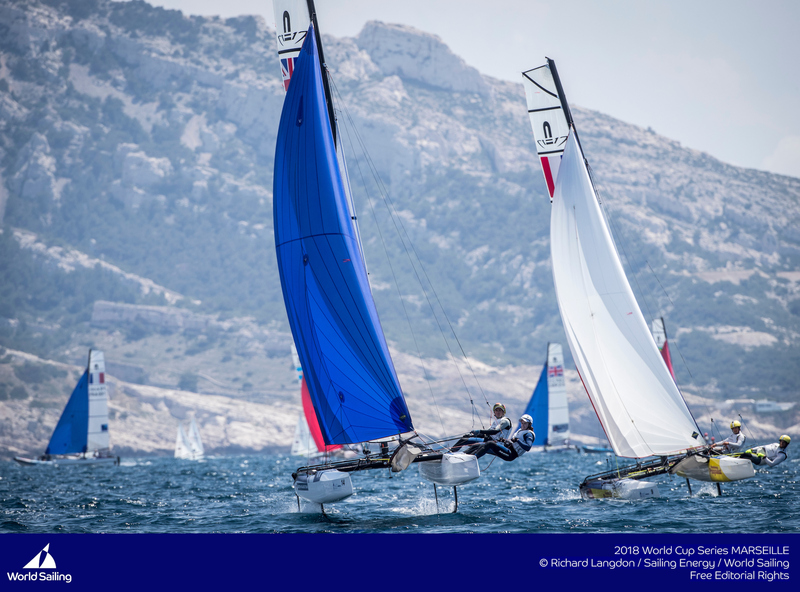 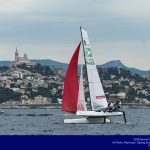 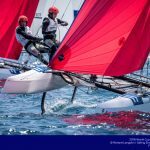 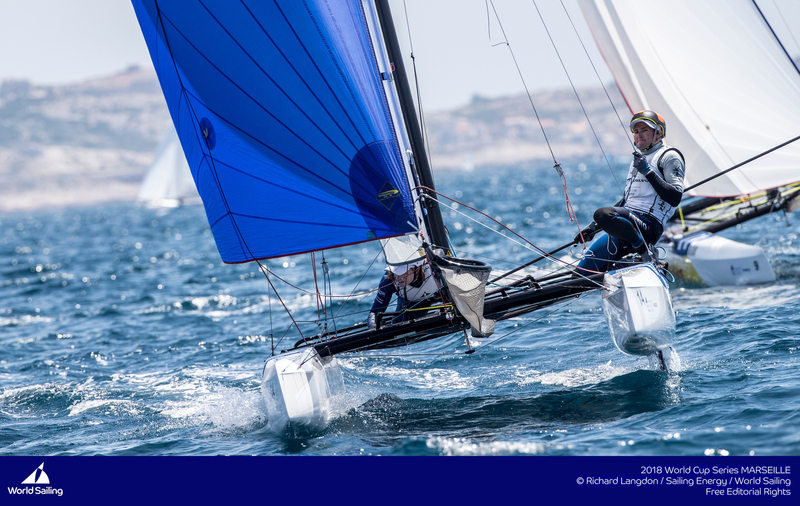 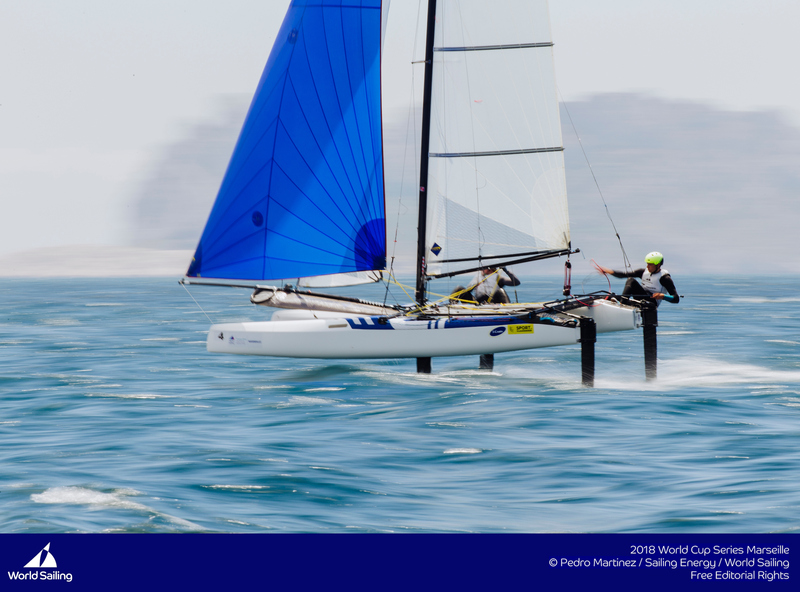 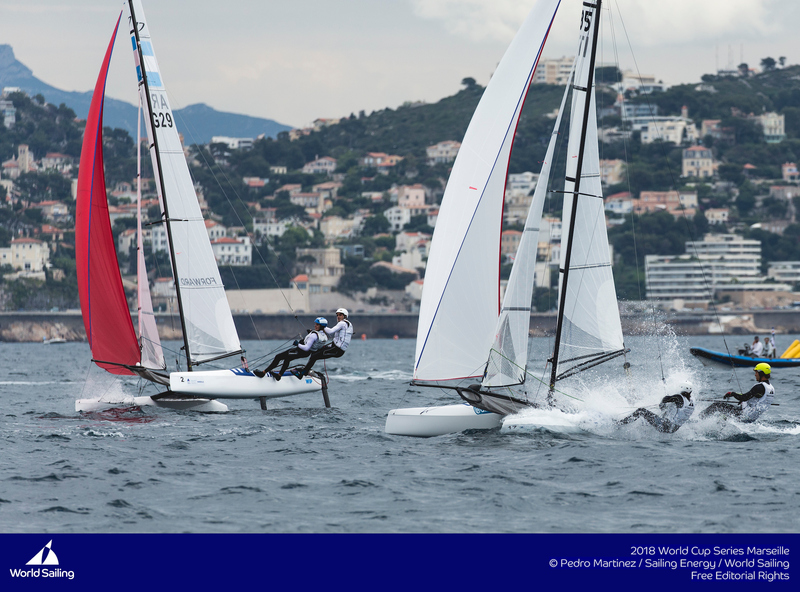 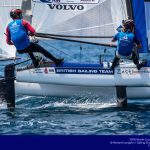 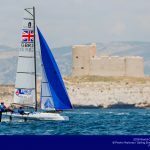 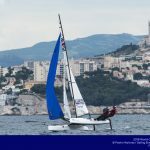 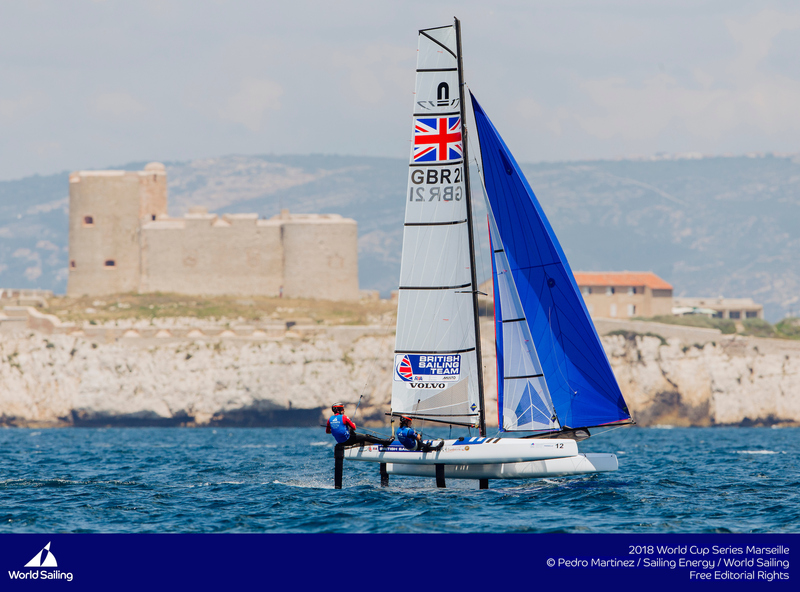 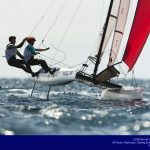 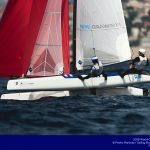 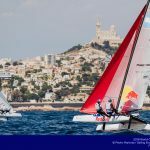 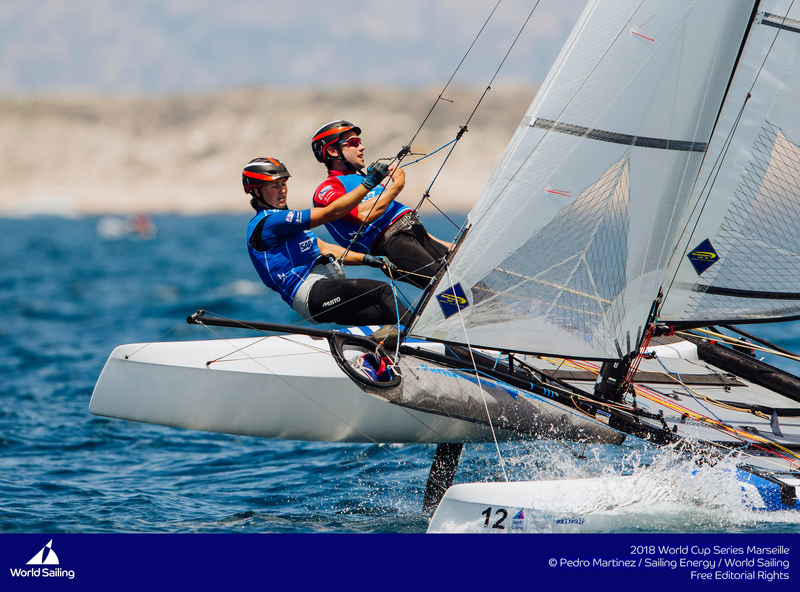 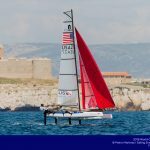 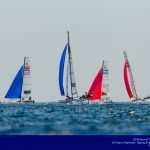 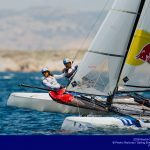 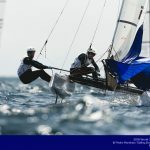 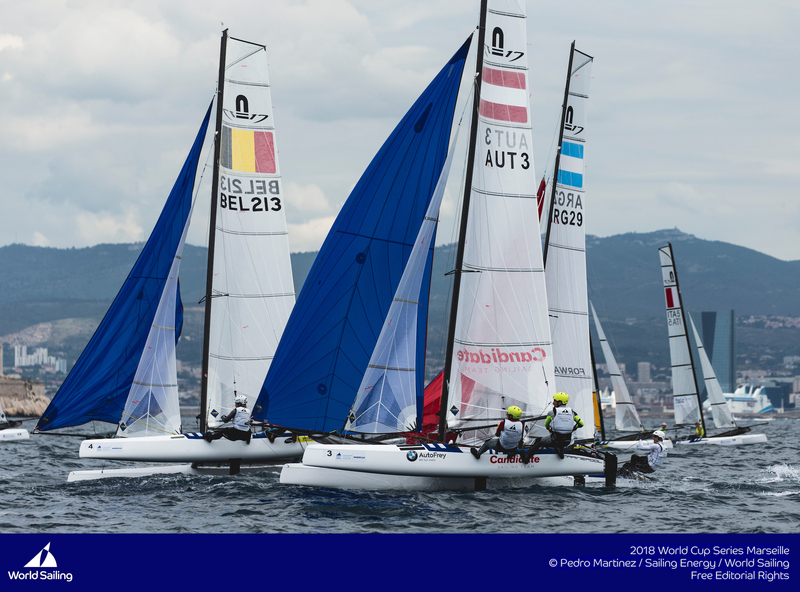 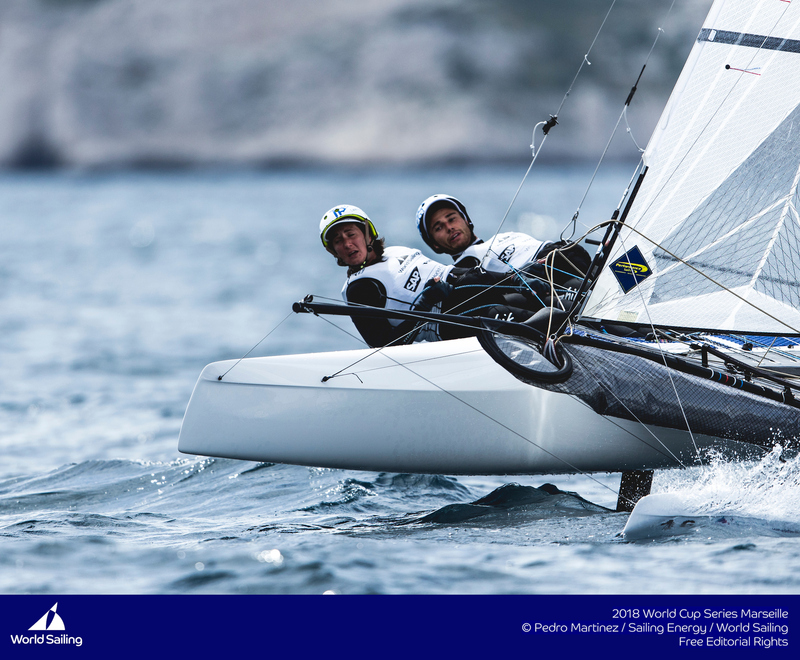 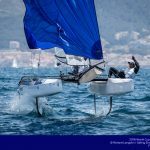 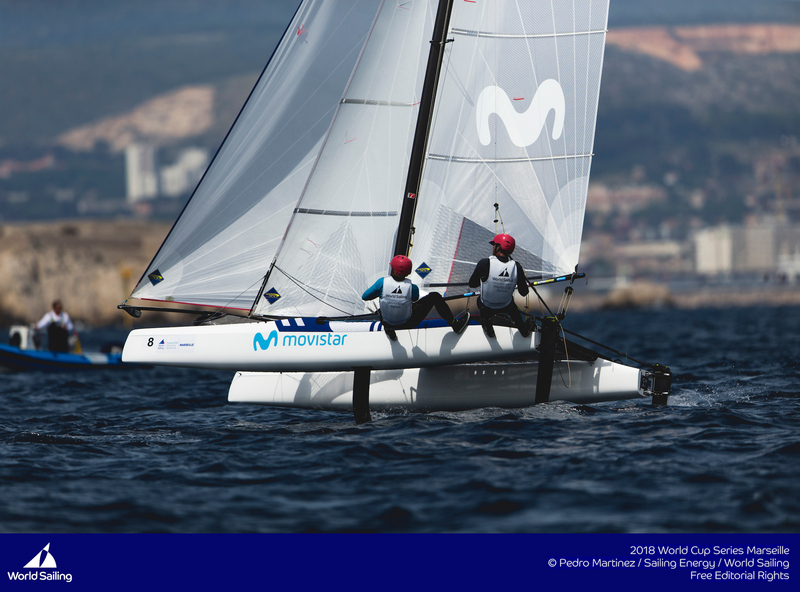 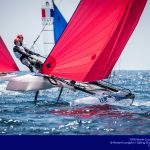 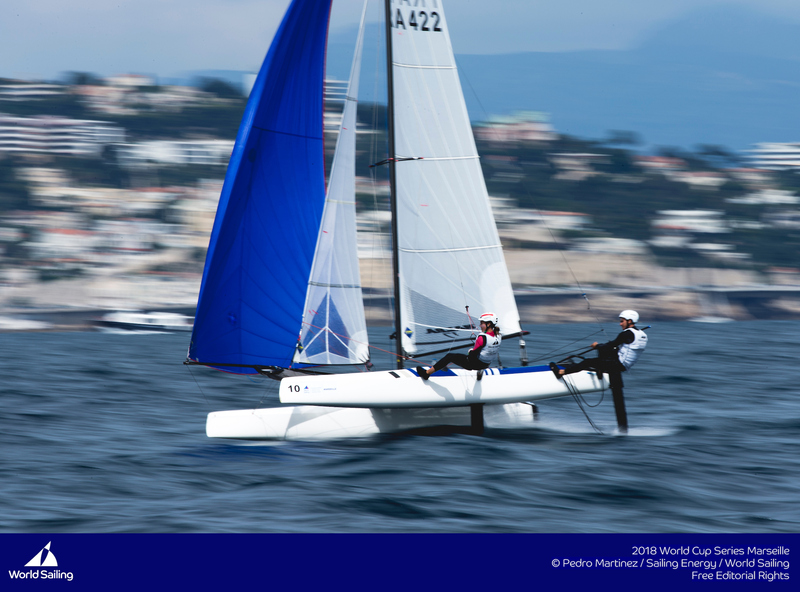 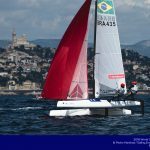 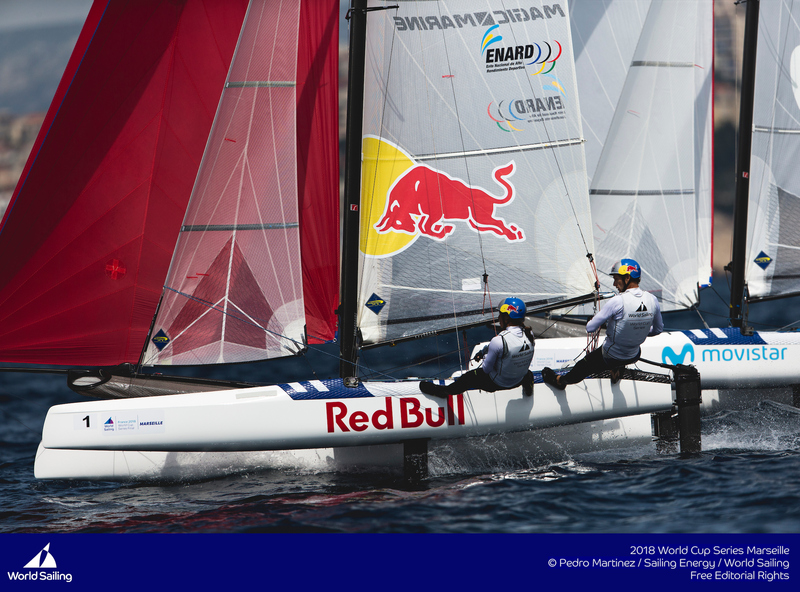 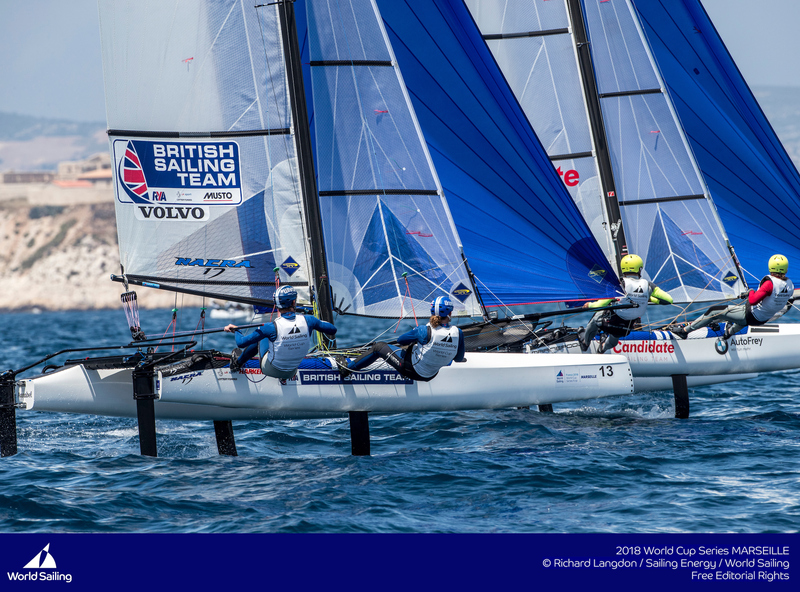 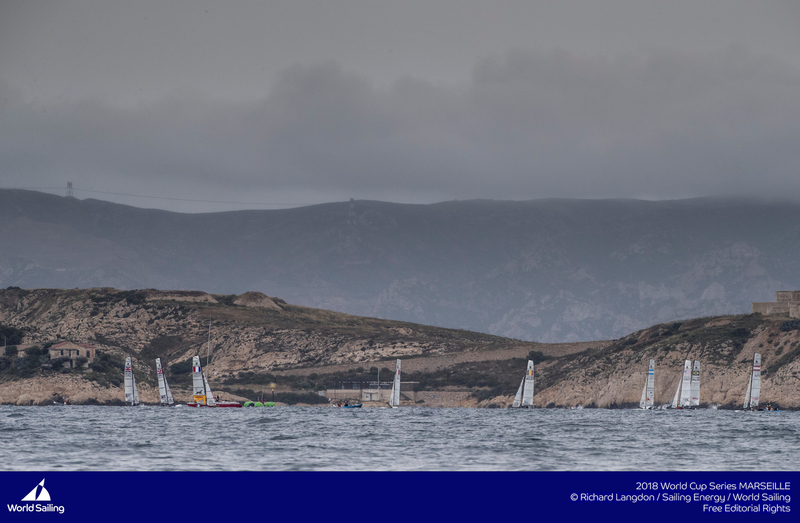 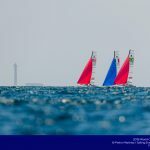 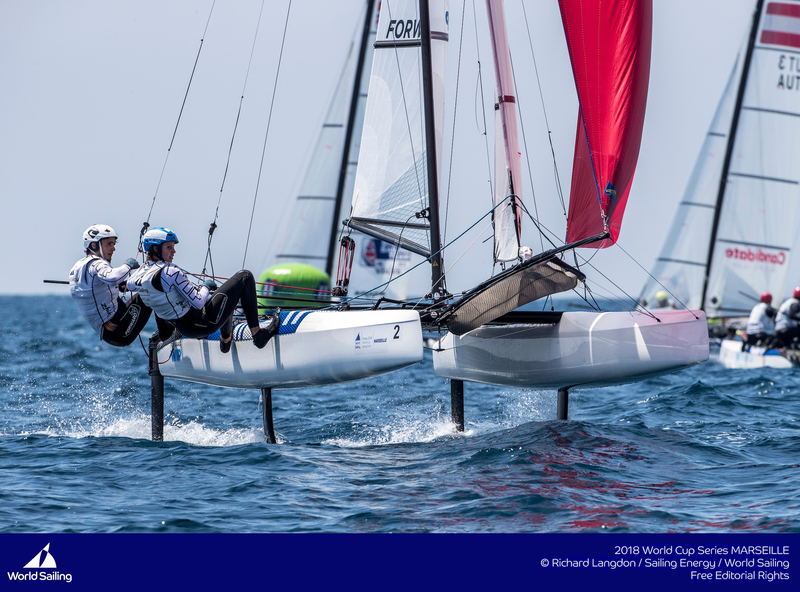 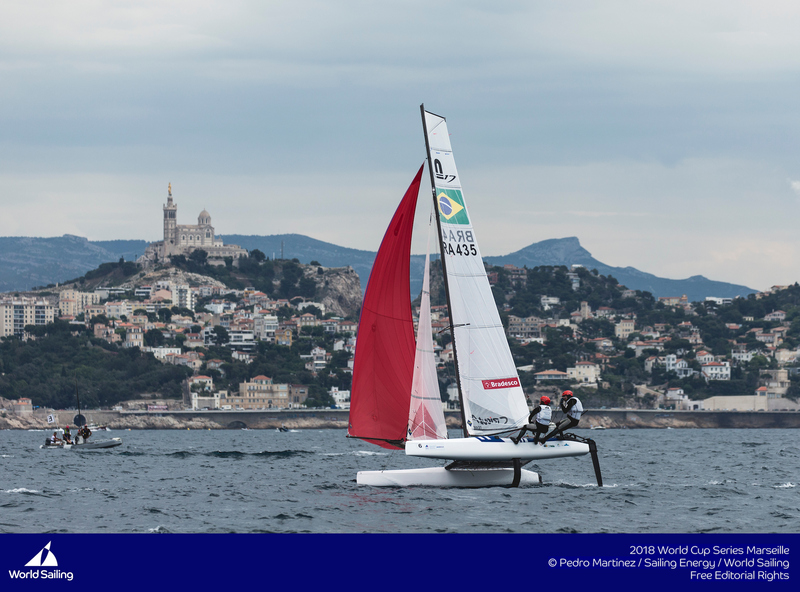 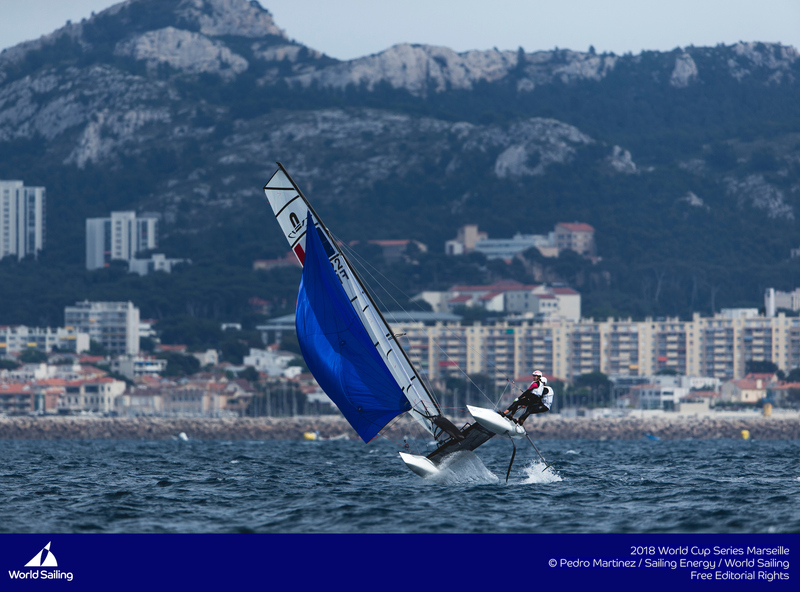 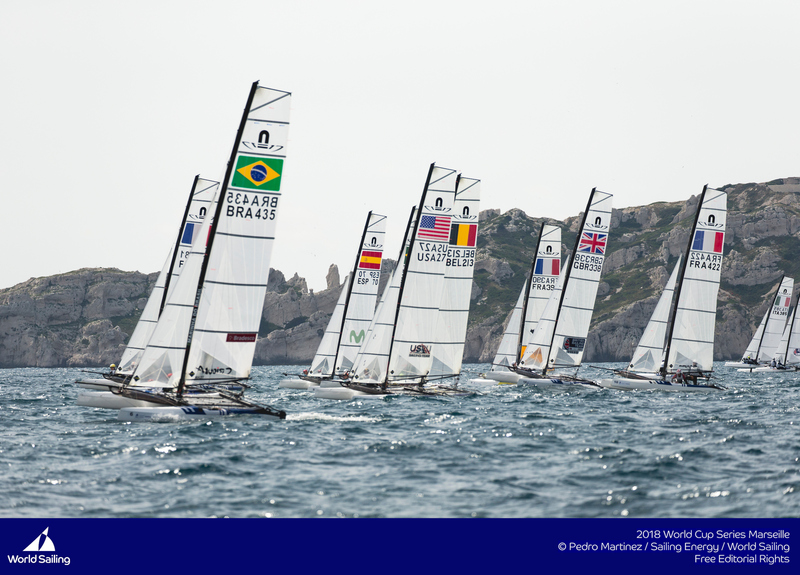 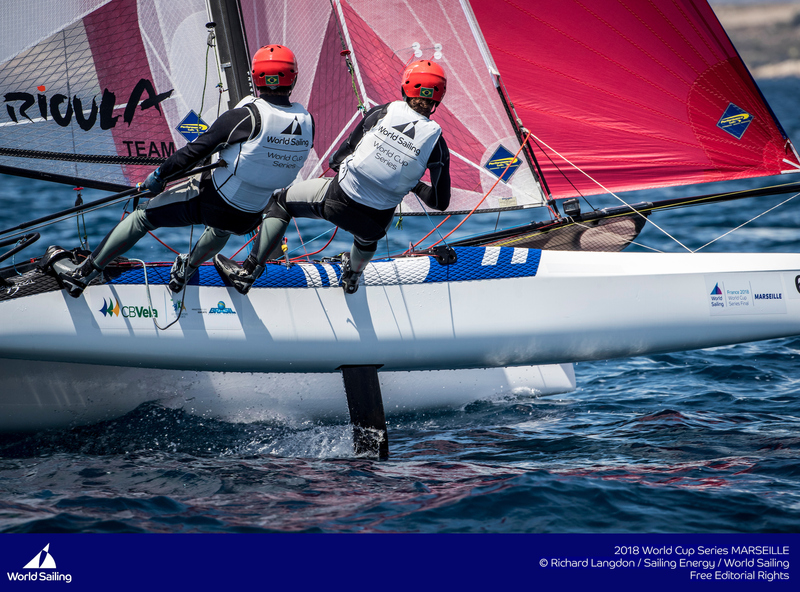 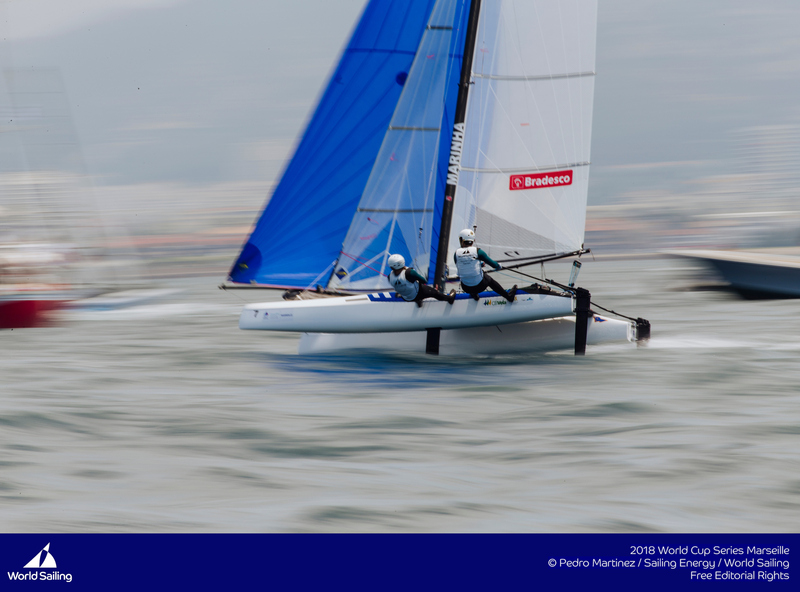 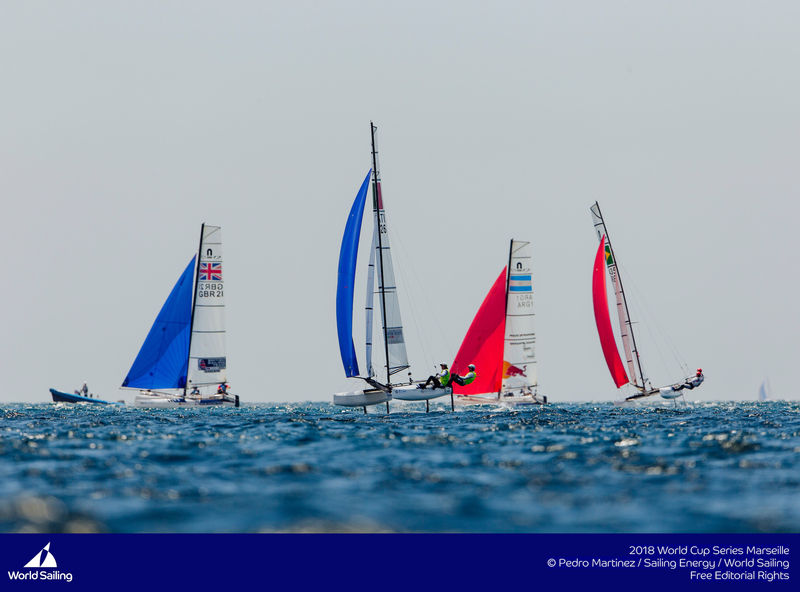 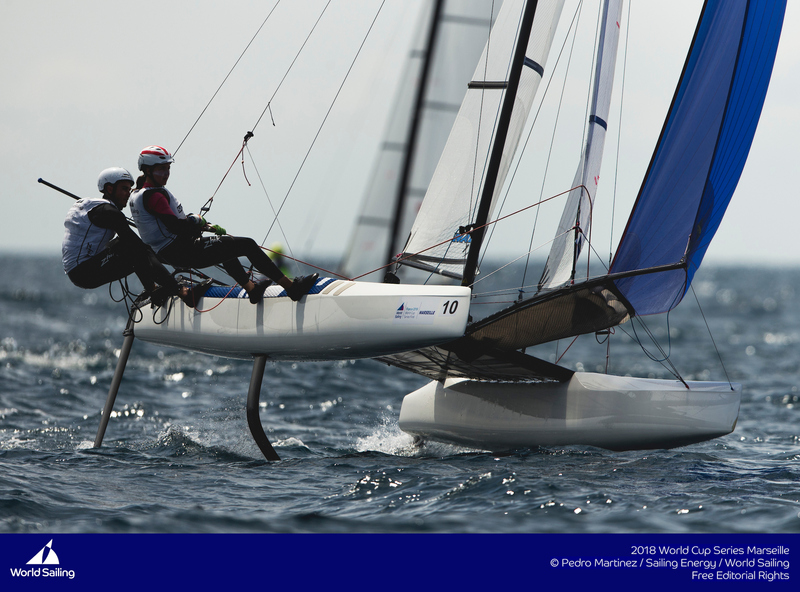 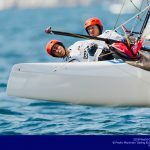 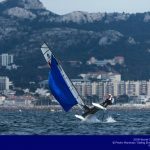 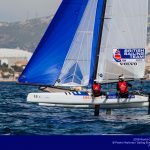 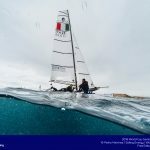 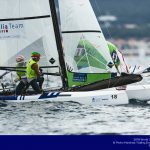 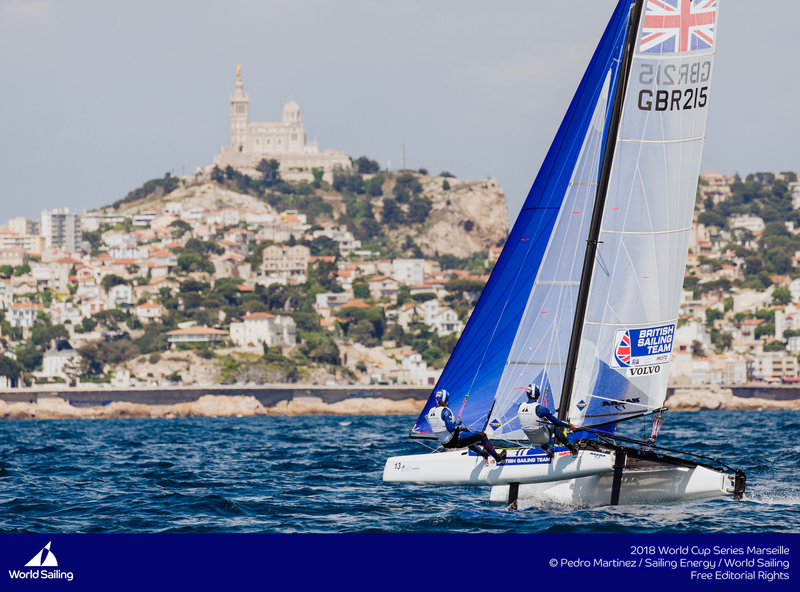 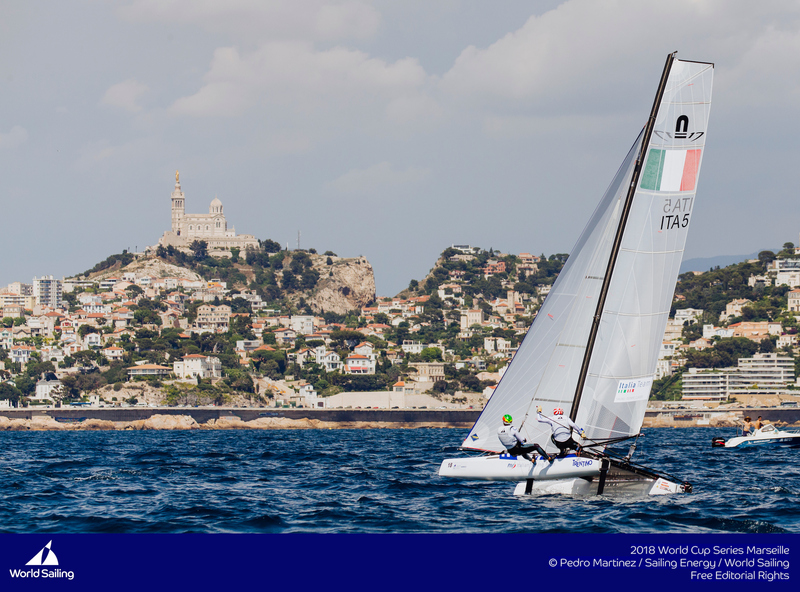 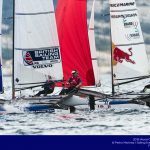 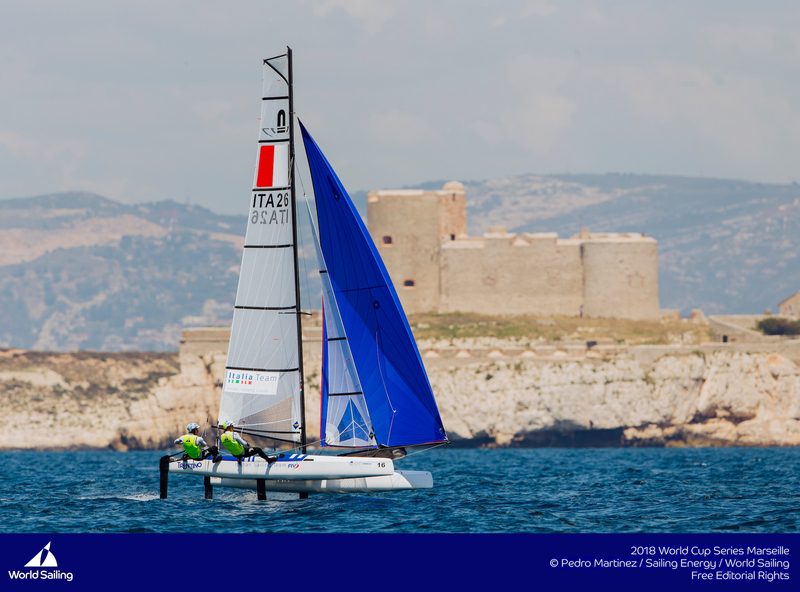 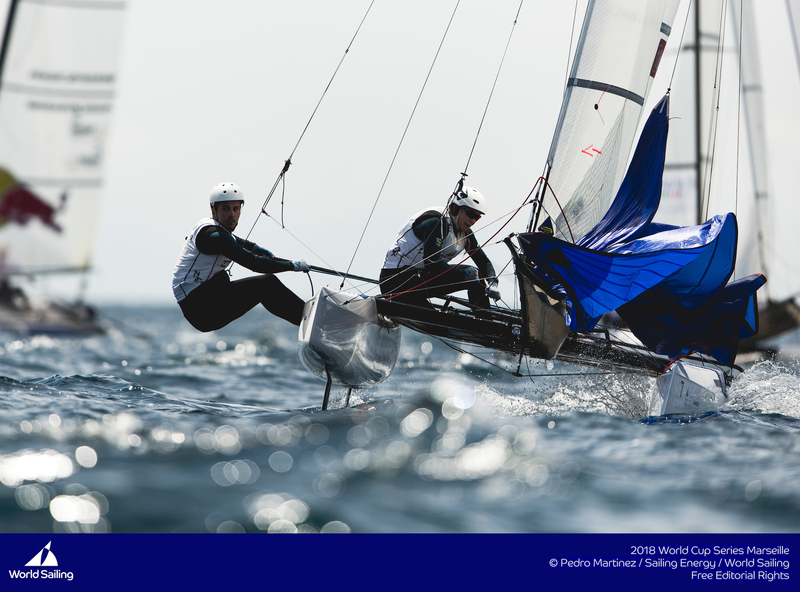 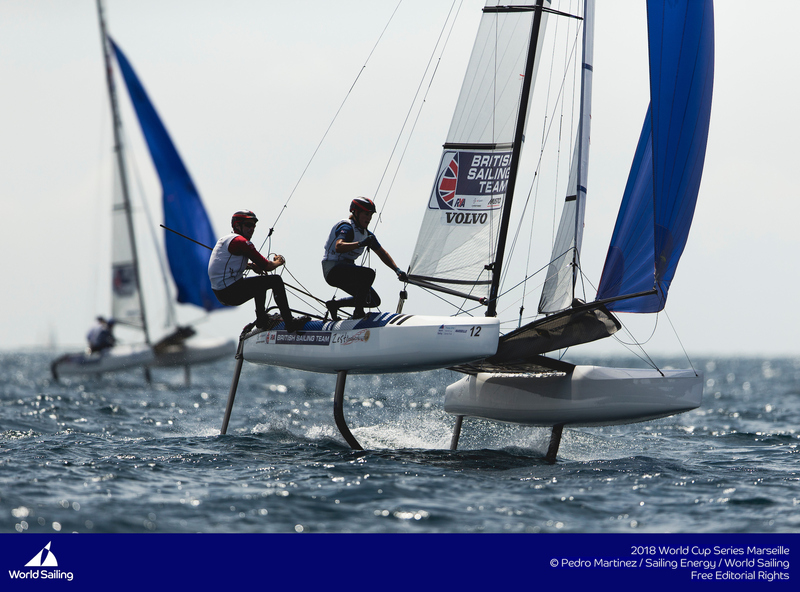 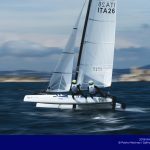 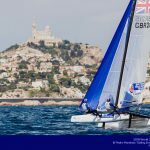 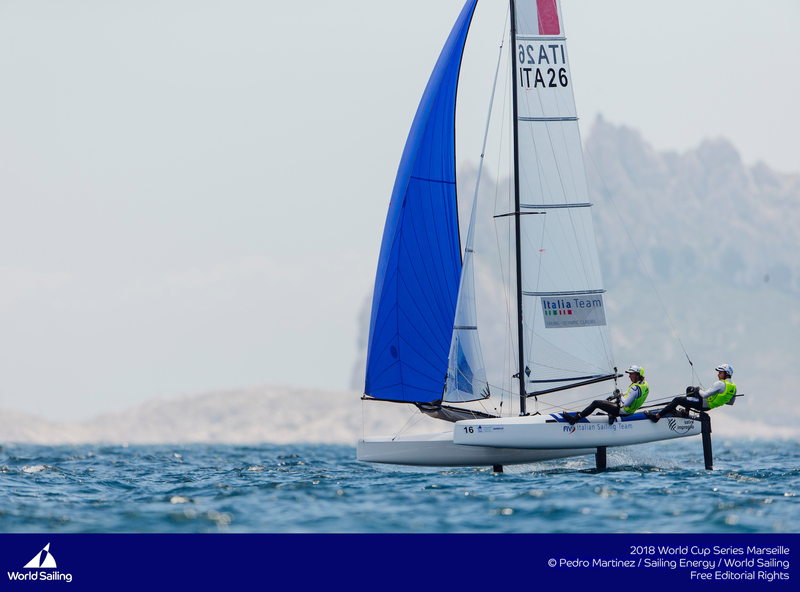 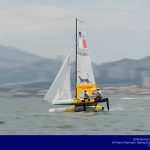 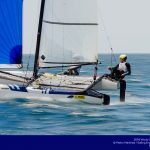 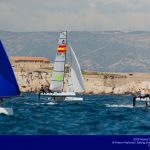 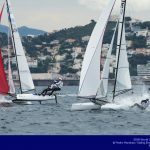 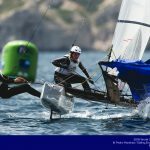 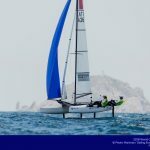 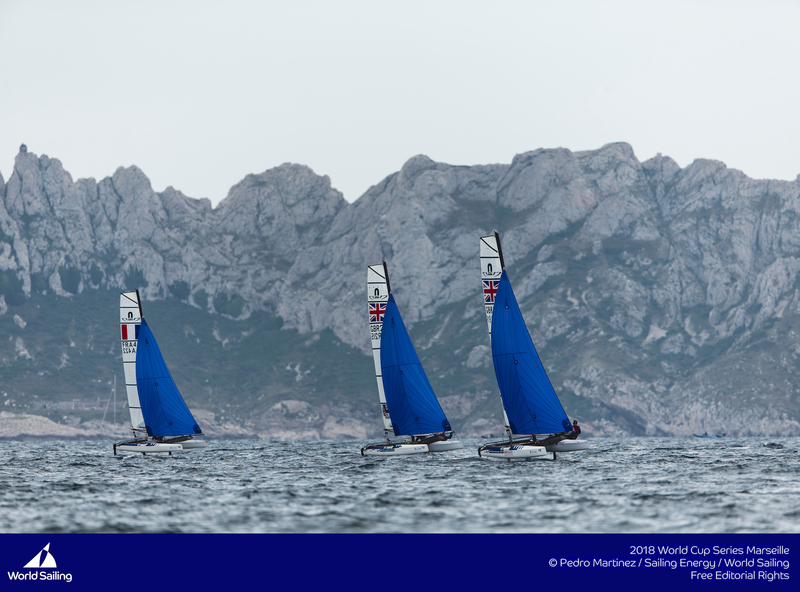 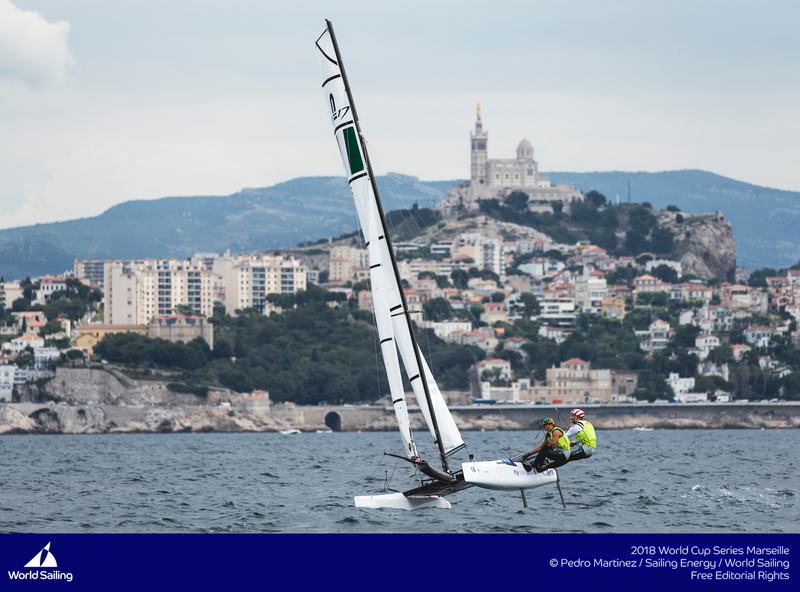 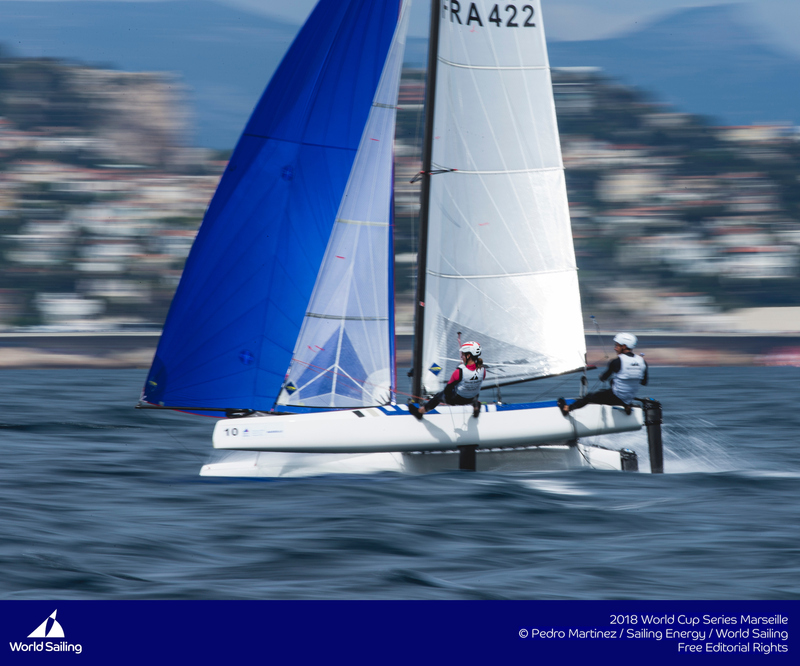 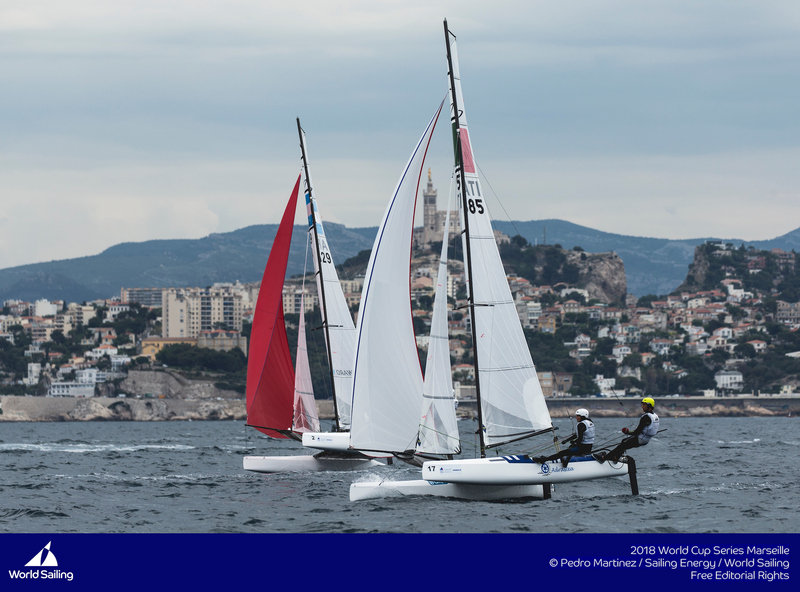 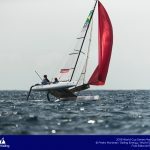 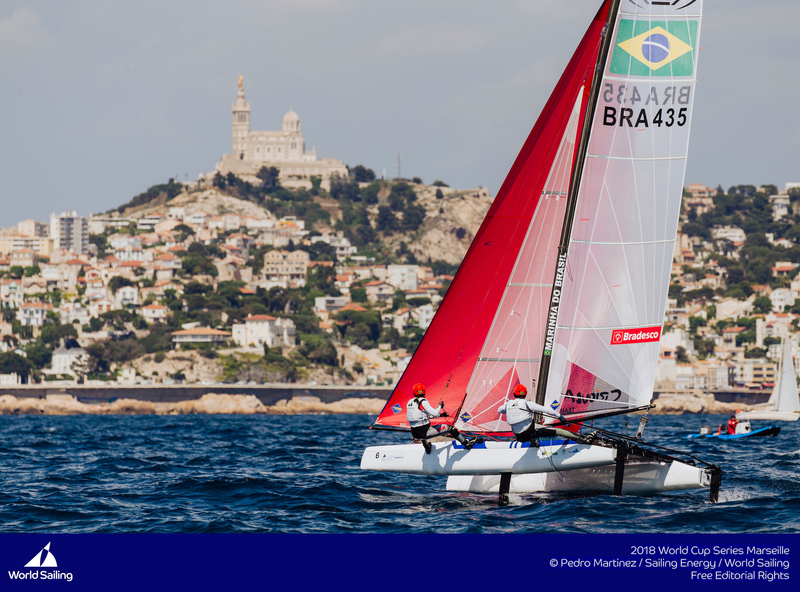 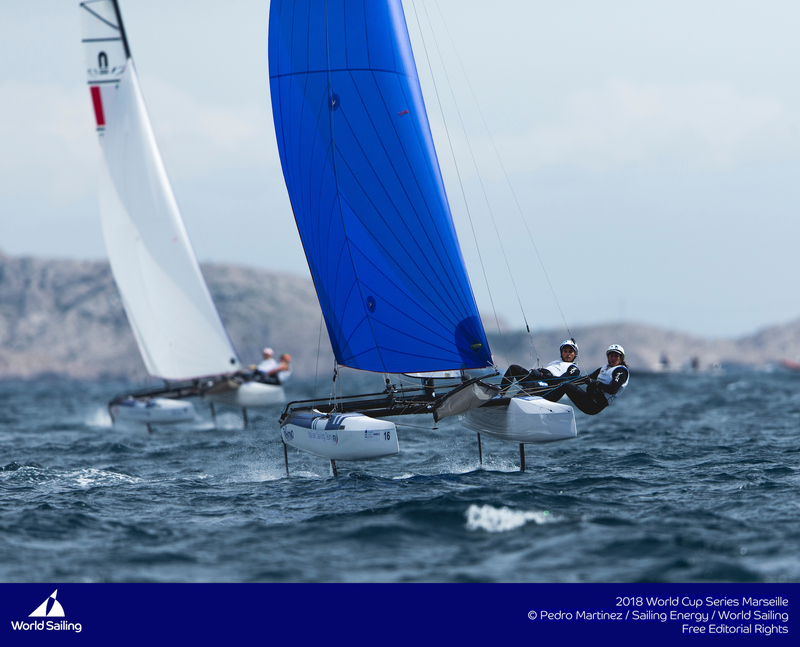 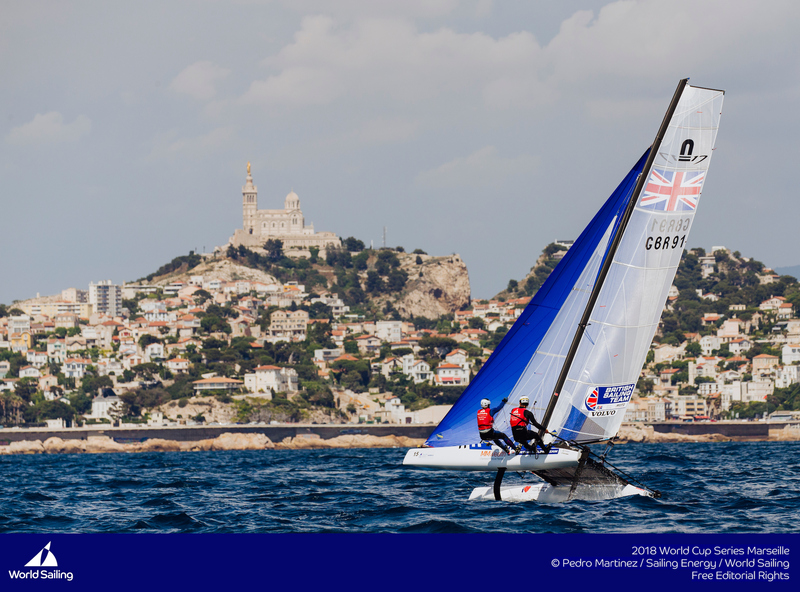 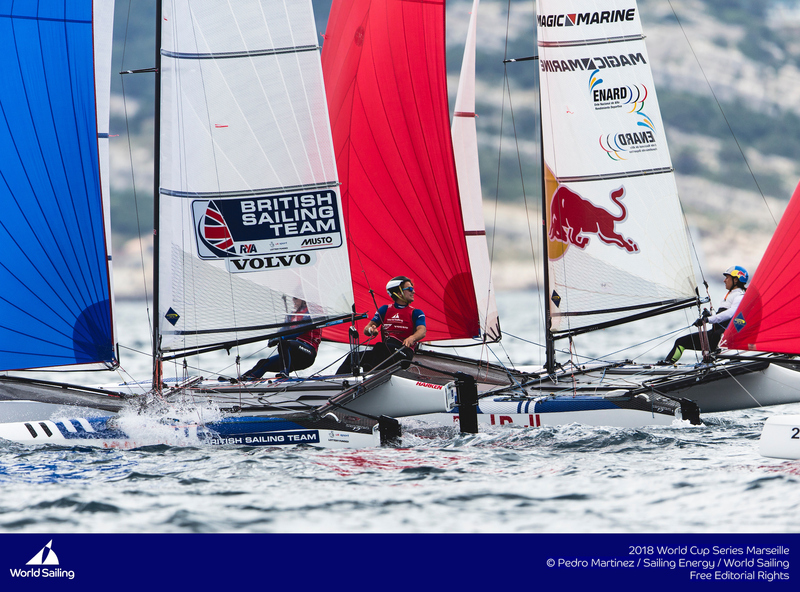 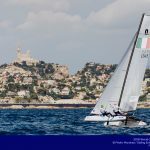 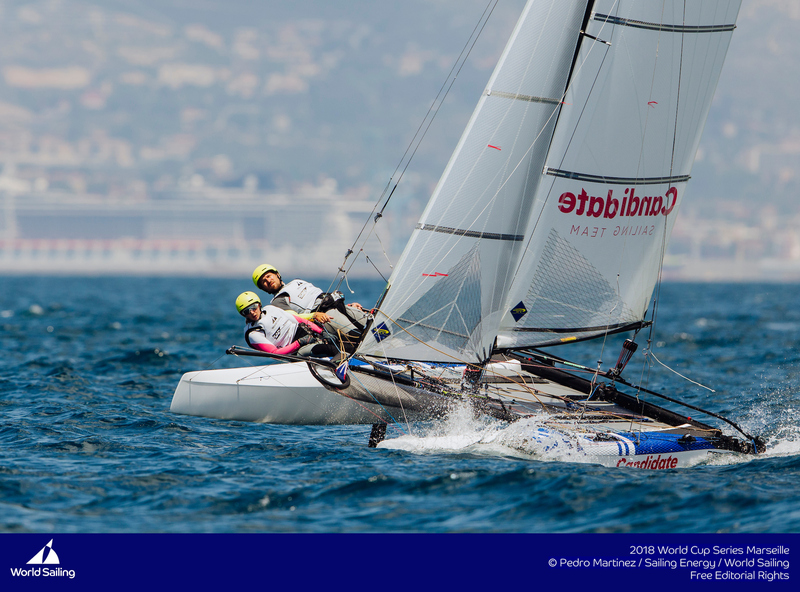 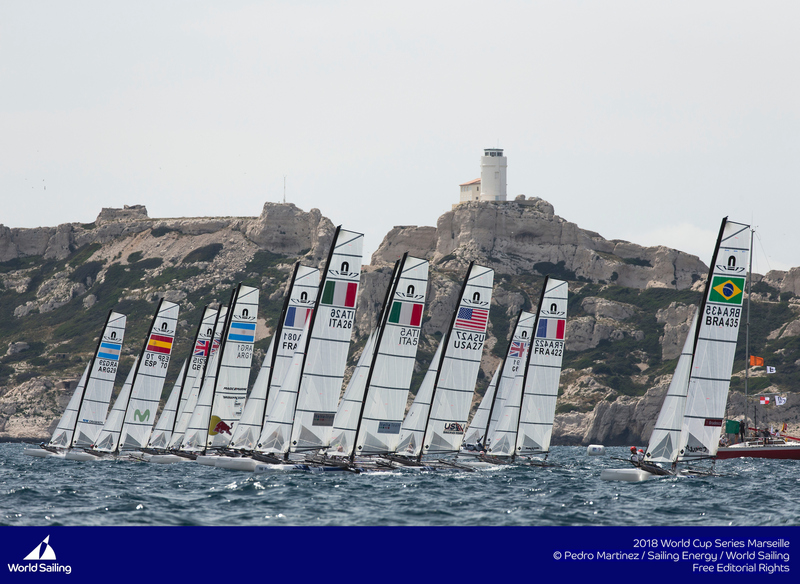 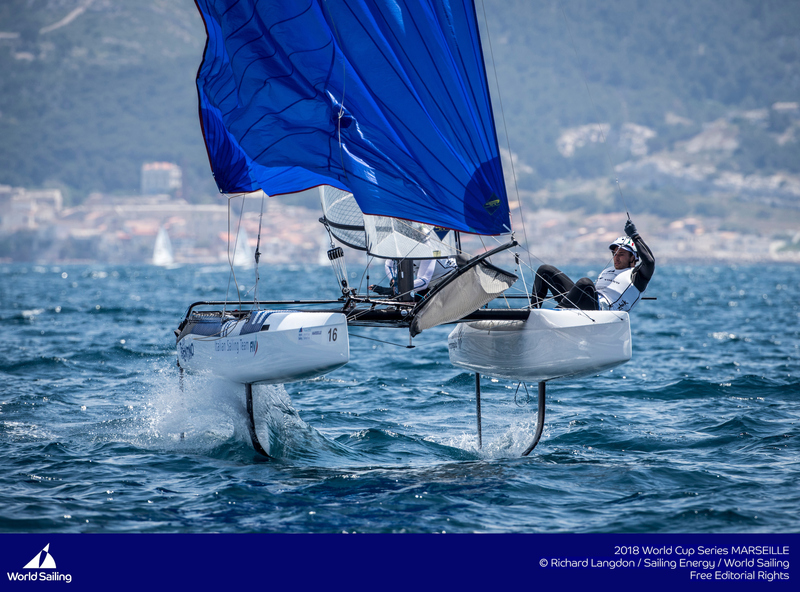 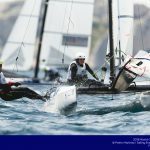 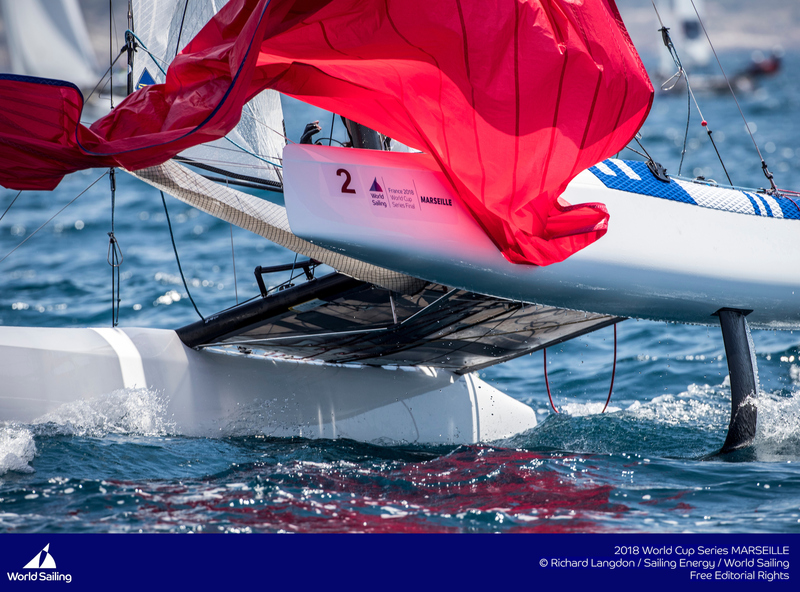 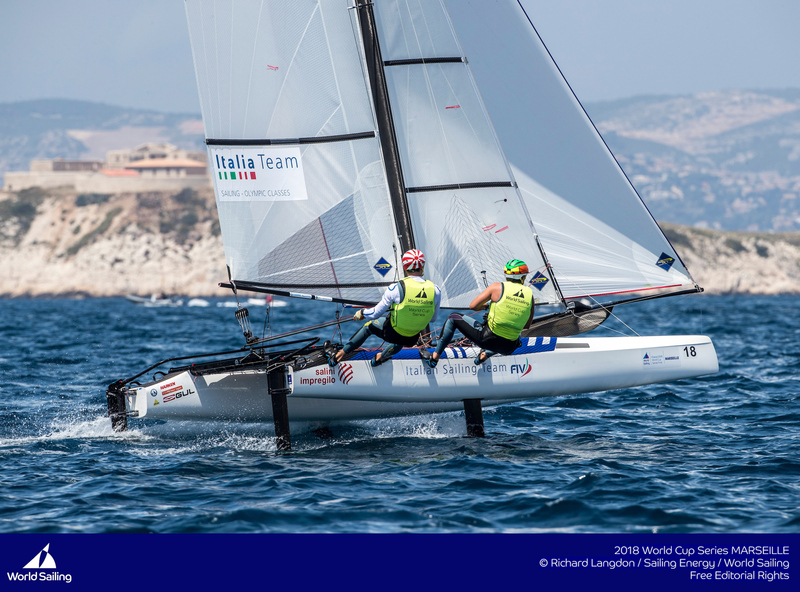 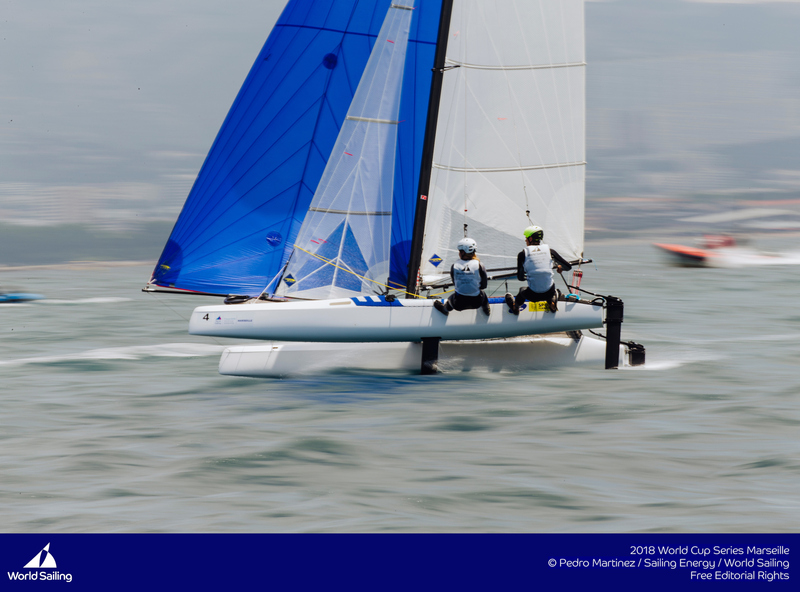 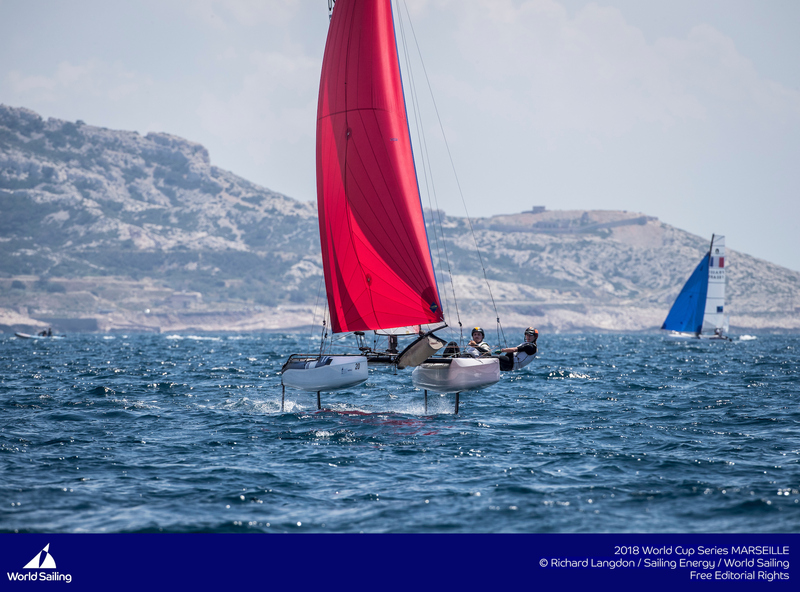 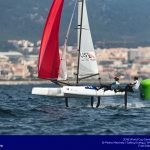 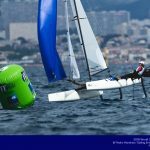 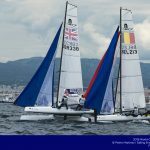 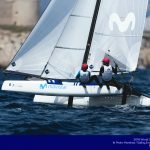 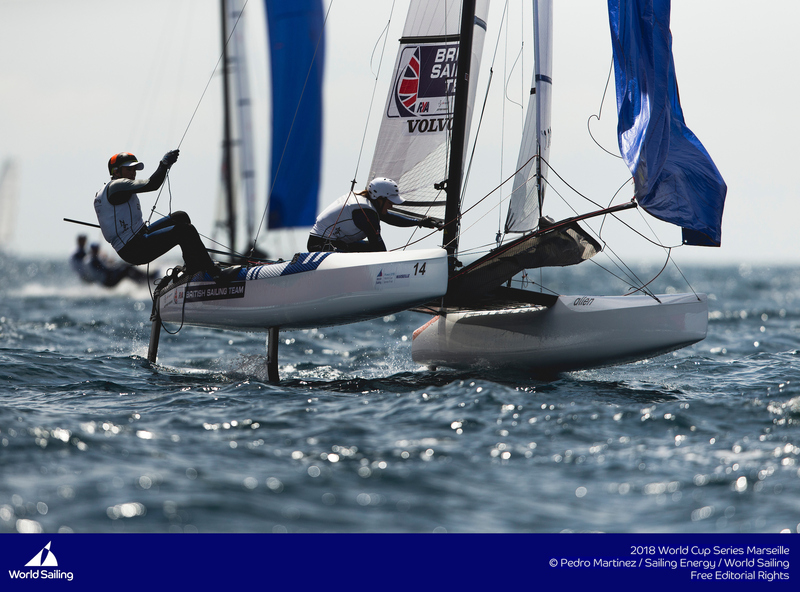 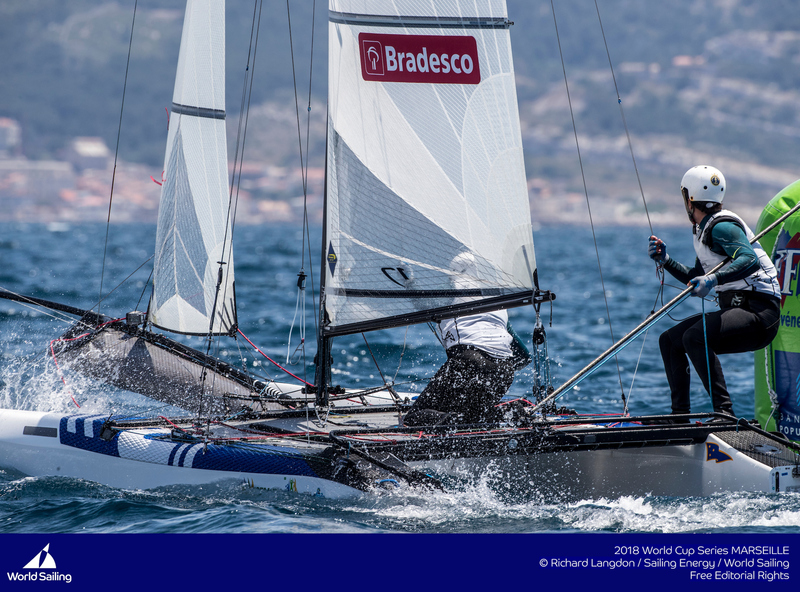 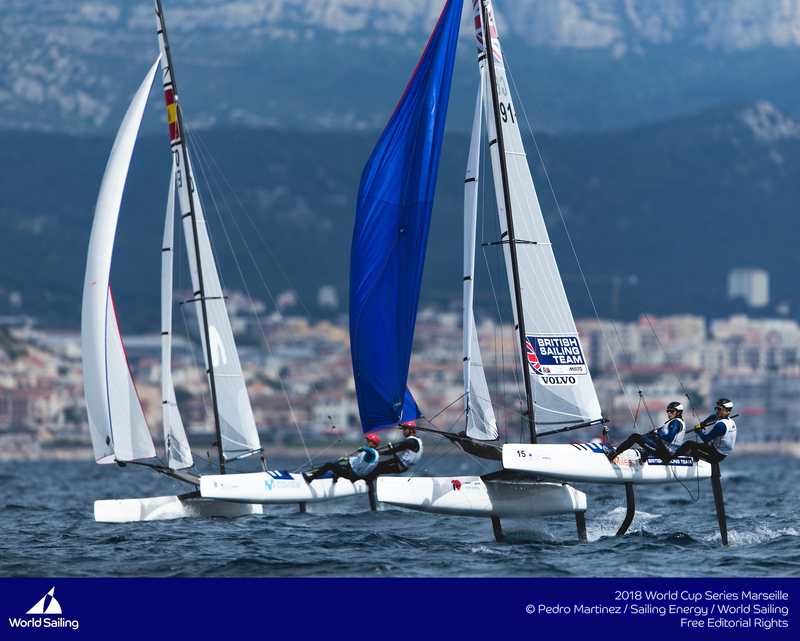 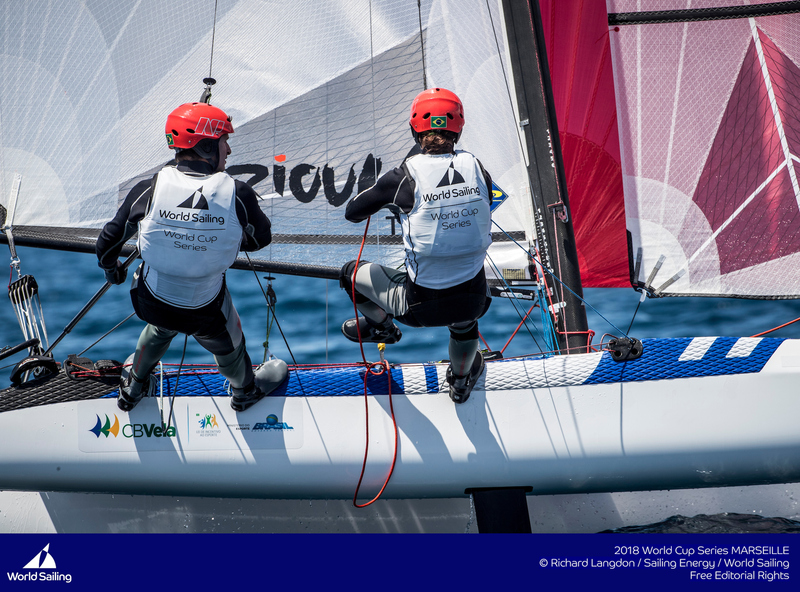 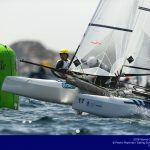 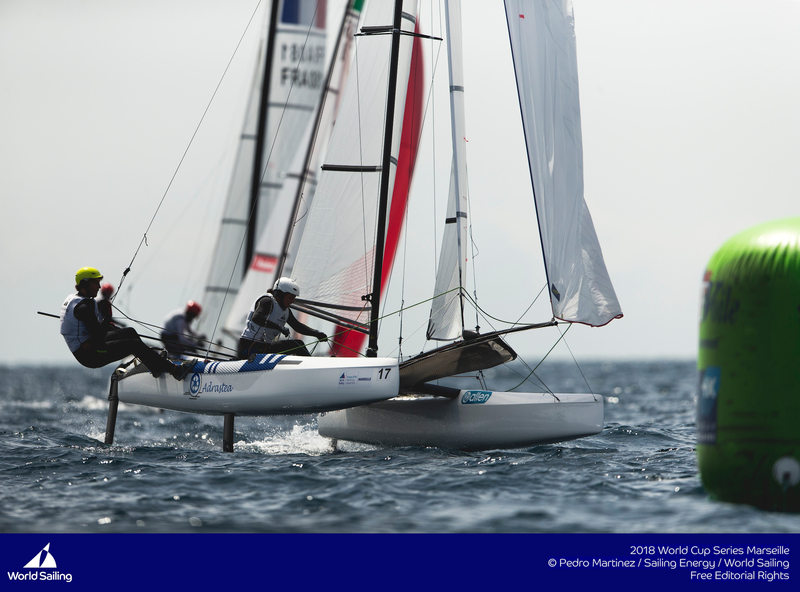 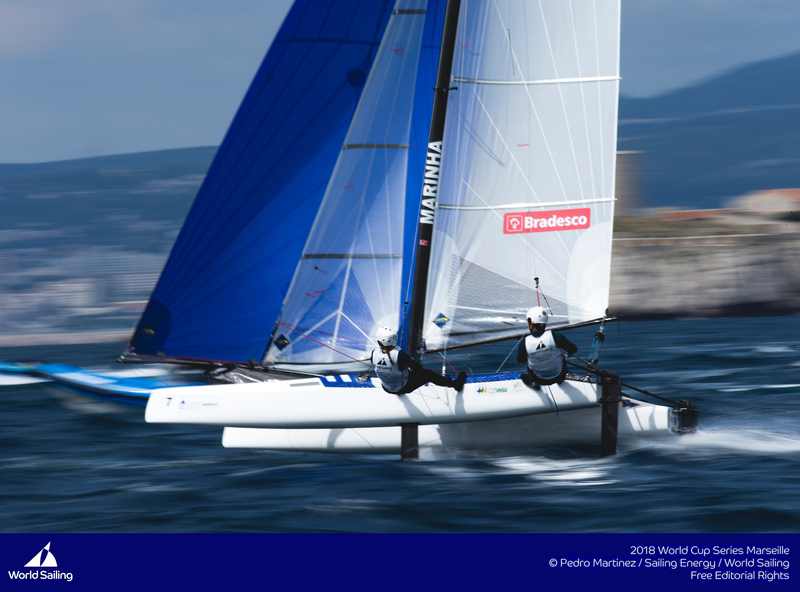 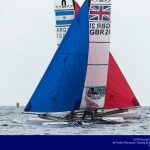 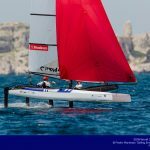 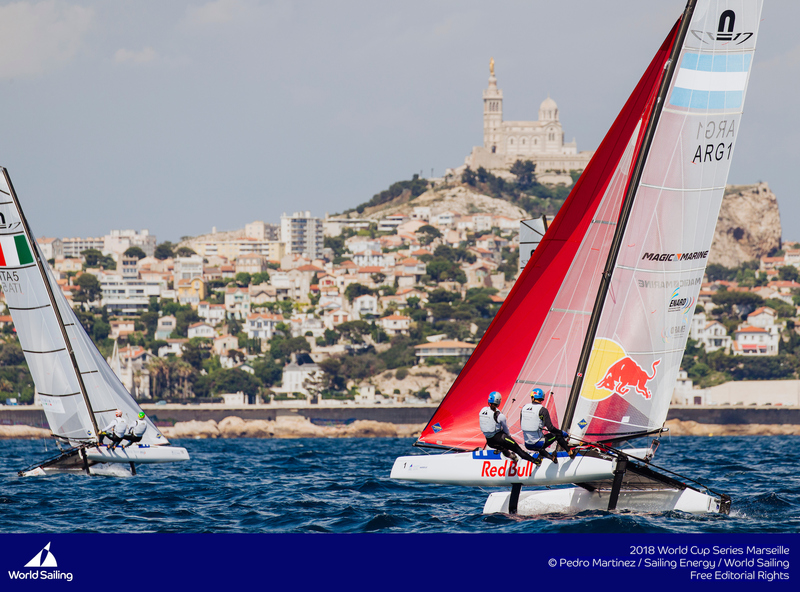 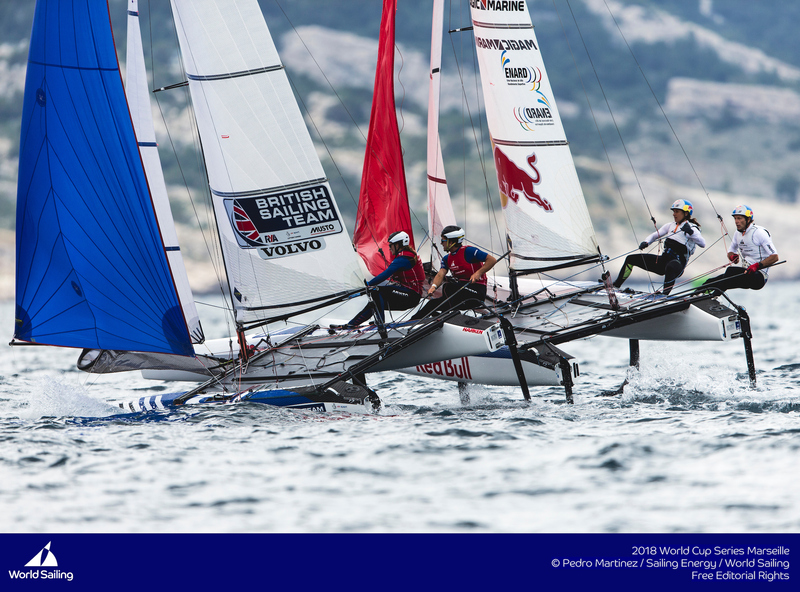 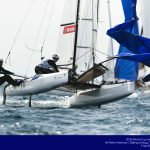 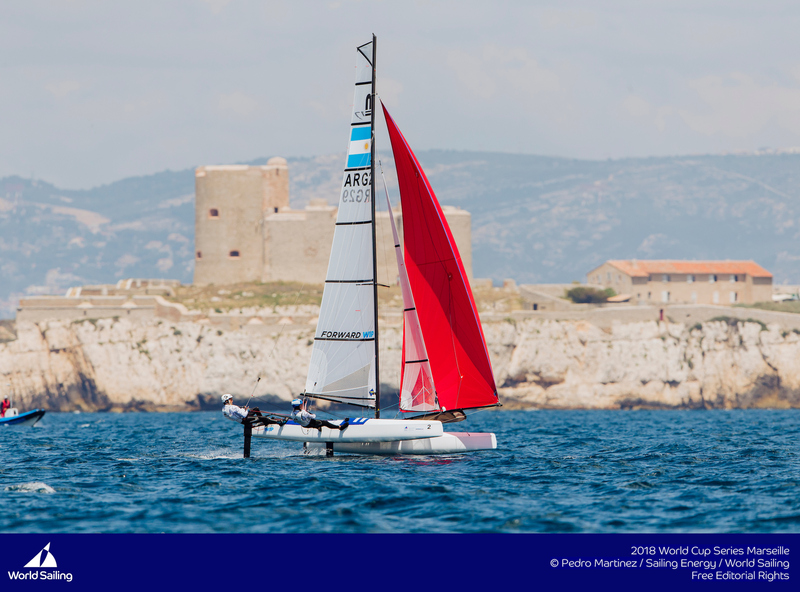 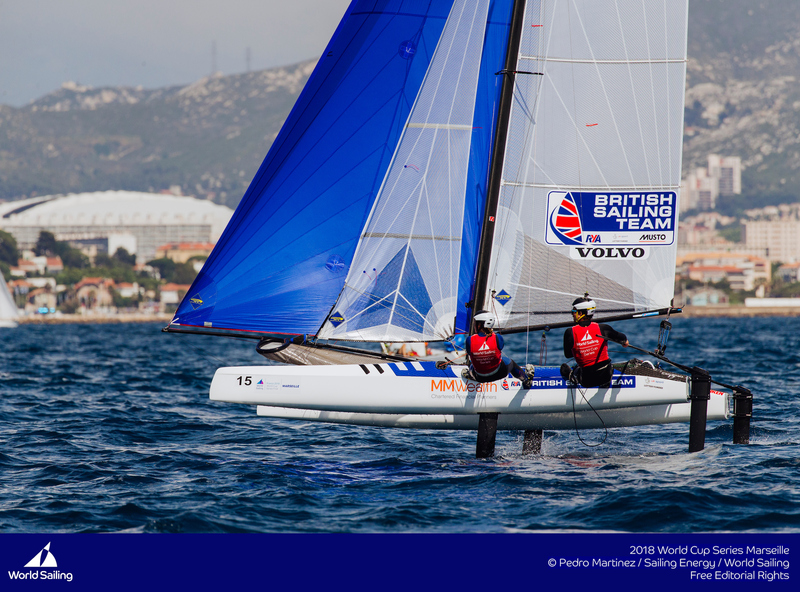 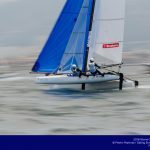 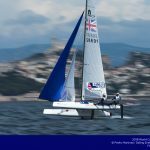 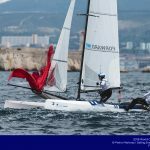 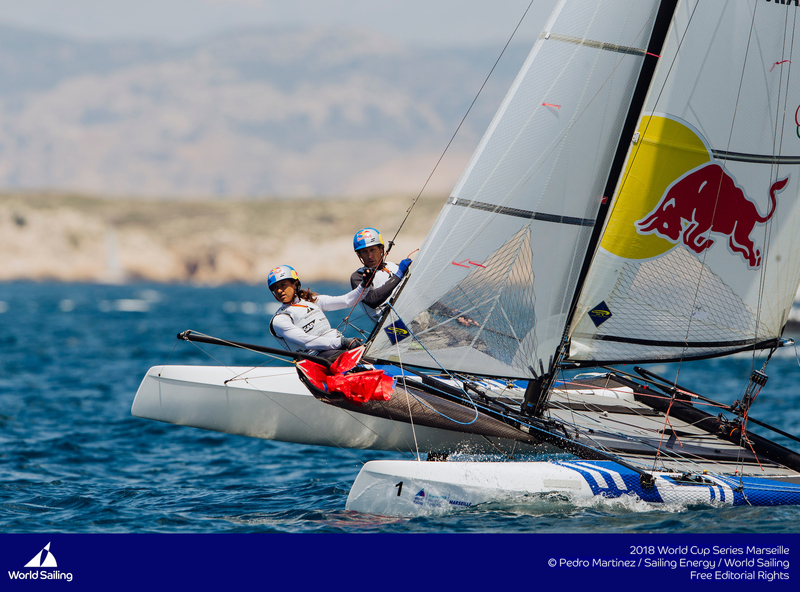 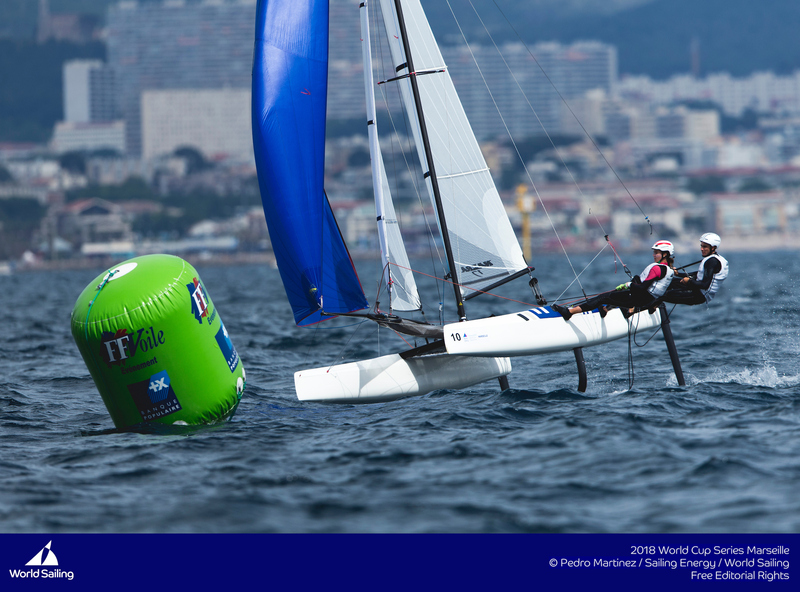 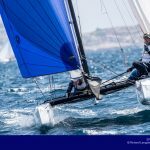 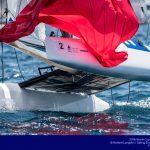 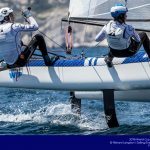 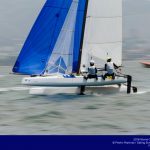 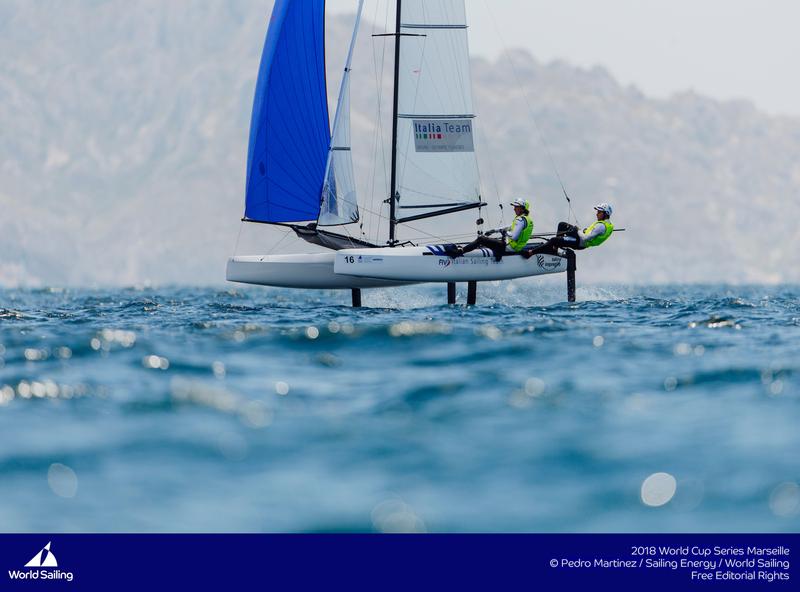 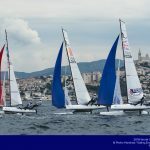 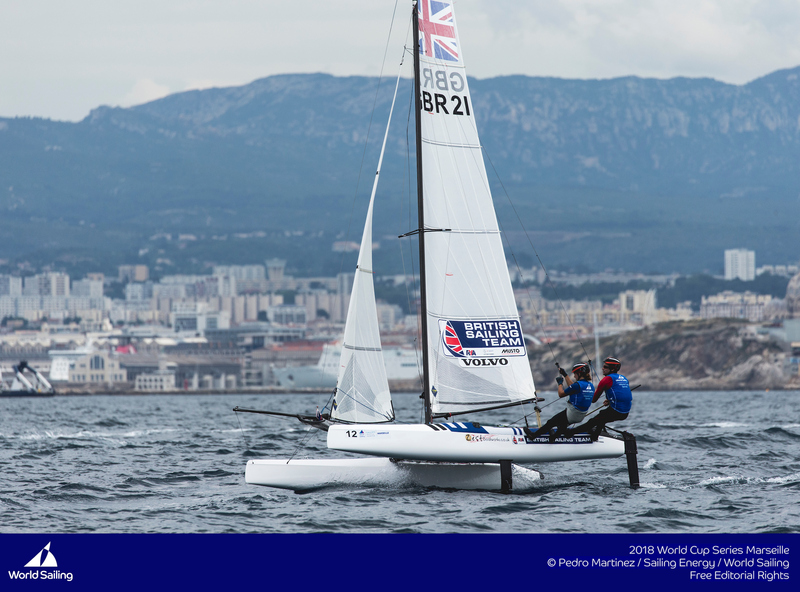 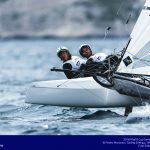 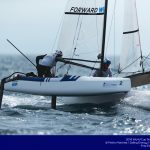 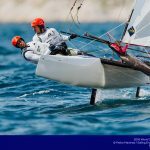 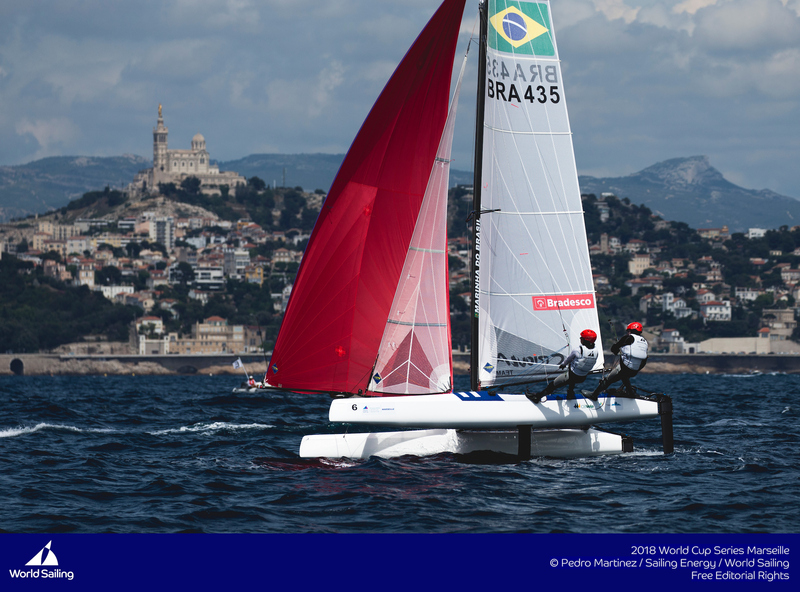 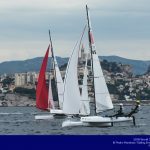 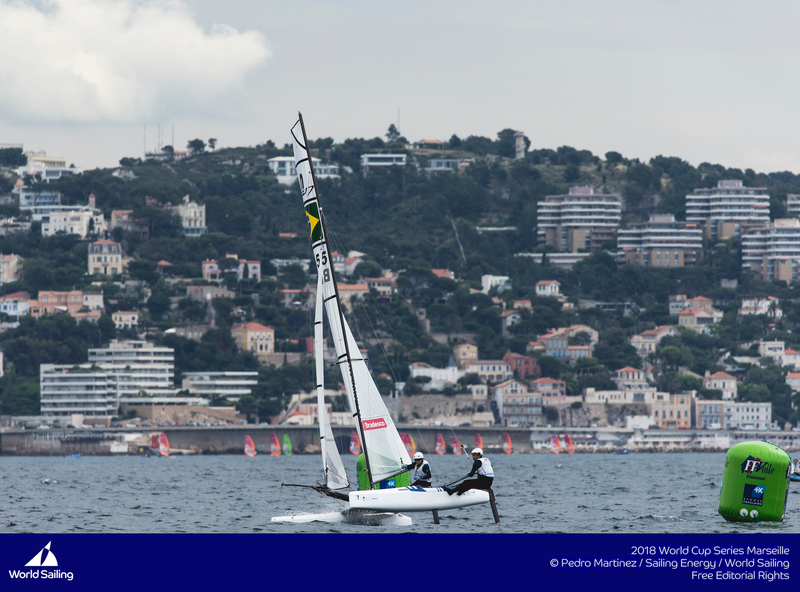 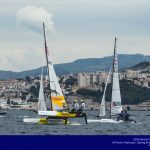 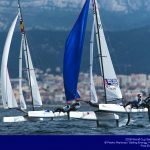 The Nacra 17 class voted this winter to assign sail numbers 1-20 to the Olympians in the order they finished in 2016, with numbers 21-99 assigned to other teams who have finished at the top 25 at previous worlds. 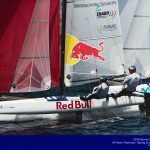 Teams can choose which number they prefer, o, for example, Zajac sailed with number 3, while Saxton (9th at the games) opted to sail with their chosen team number 91. 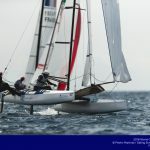 Back to the story though, it was a good test to see progress made through the winter by the different training groups. 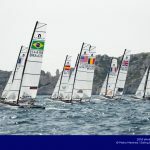 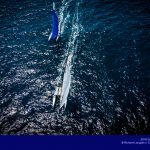 The Argentinians were back home, while Waterhouse was home in Australia, Zajak was with the Sardinia group, and Saxton was with the Santander group… they all finished in the top 4, indicating that general learning was the main thing this winter. 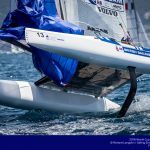 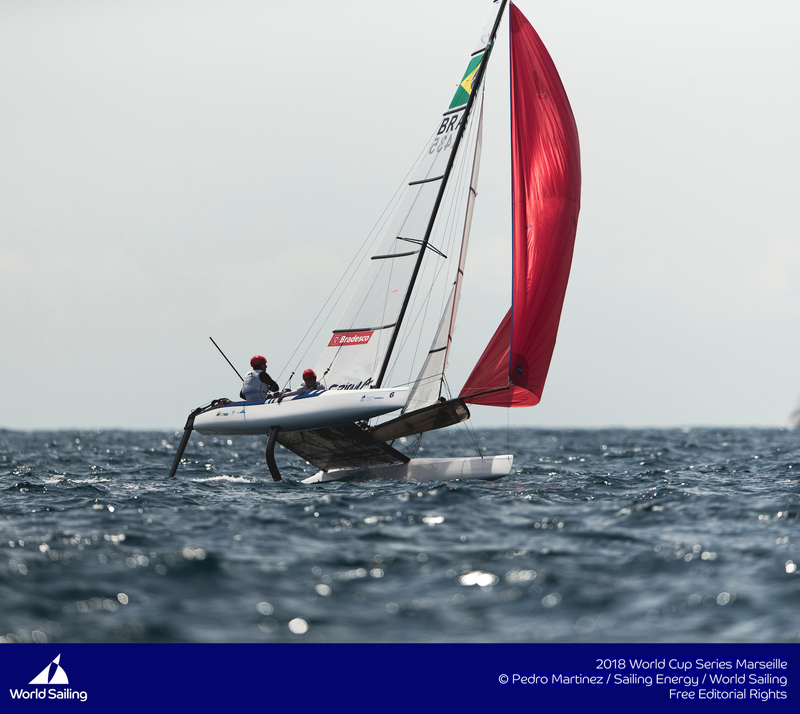 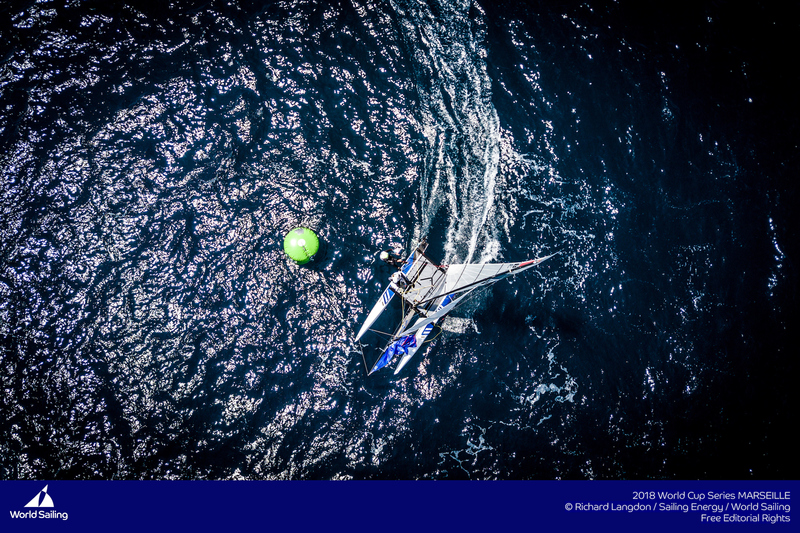 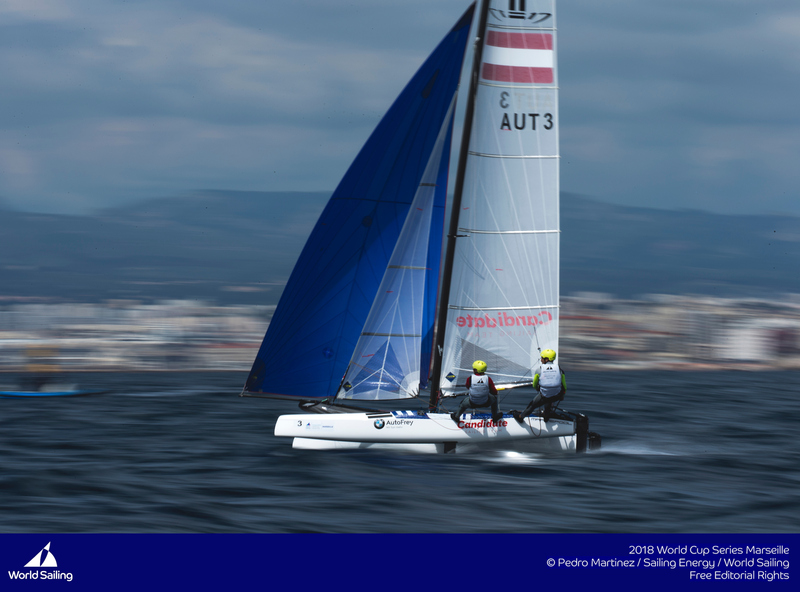 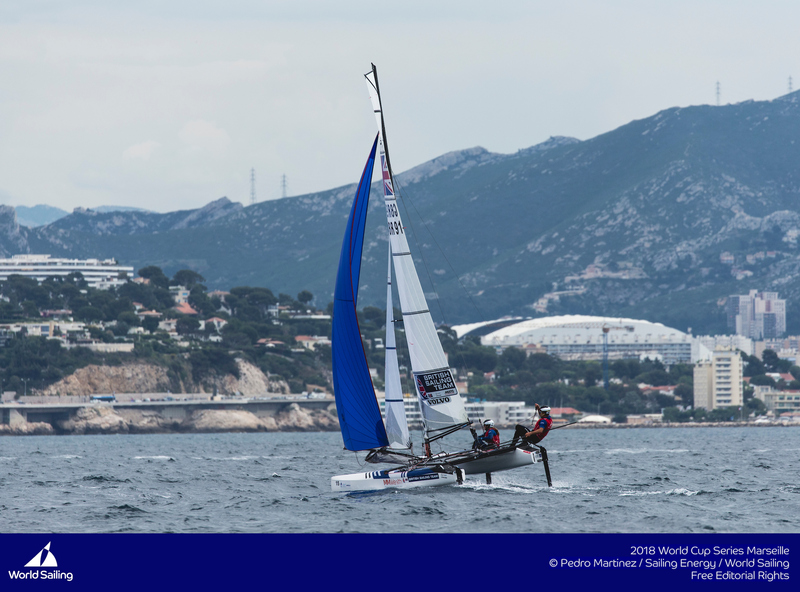 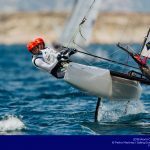 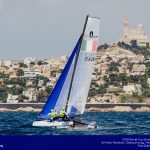 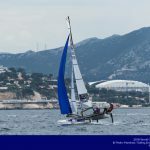 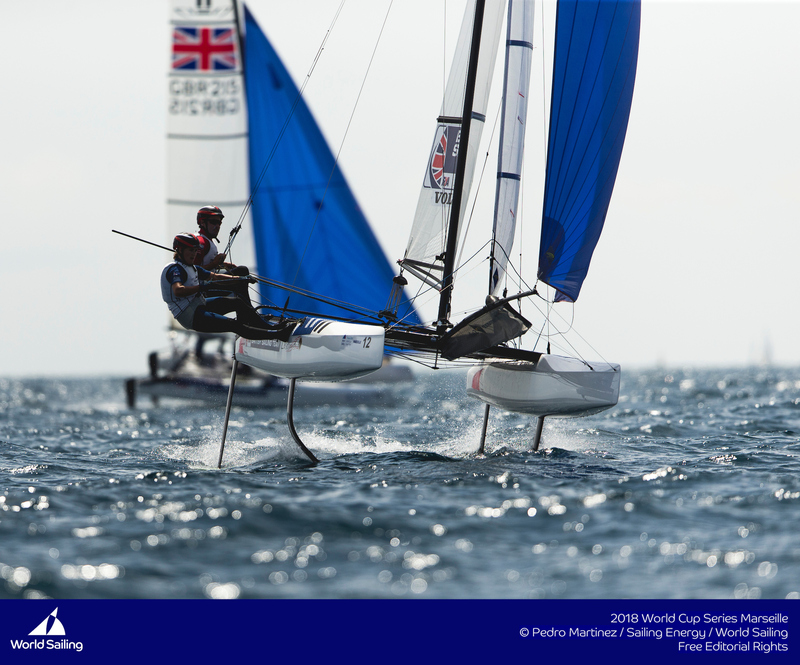 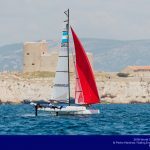 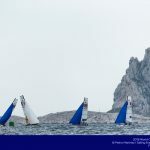 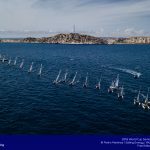 However, there remains intreague about foiling upwind… in the regatta, the foling downwind was at a much higher level than Worlds 4 months ago. 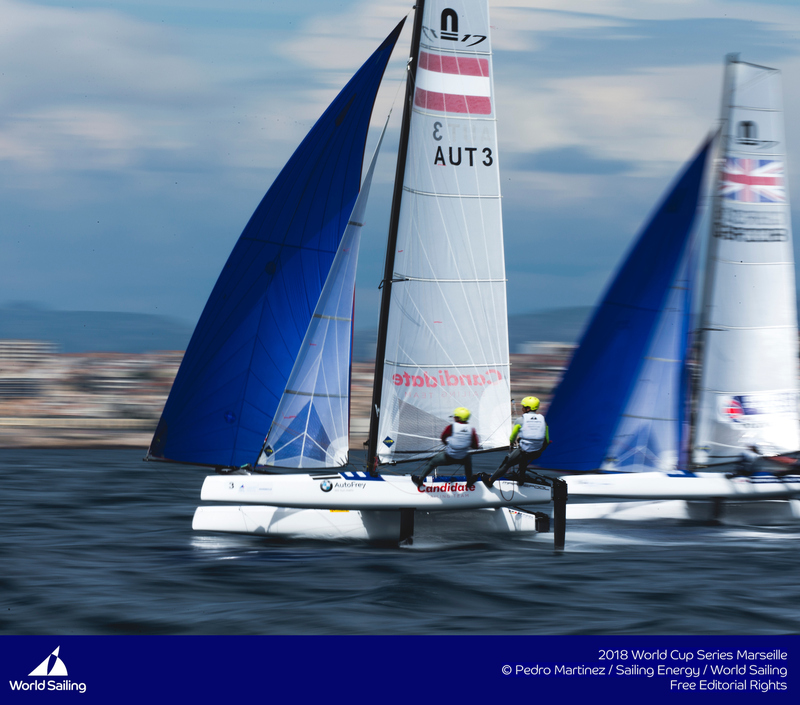 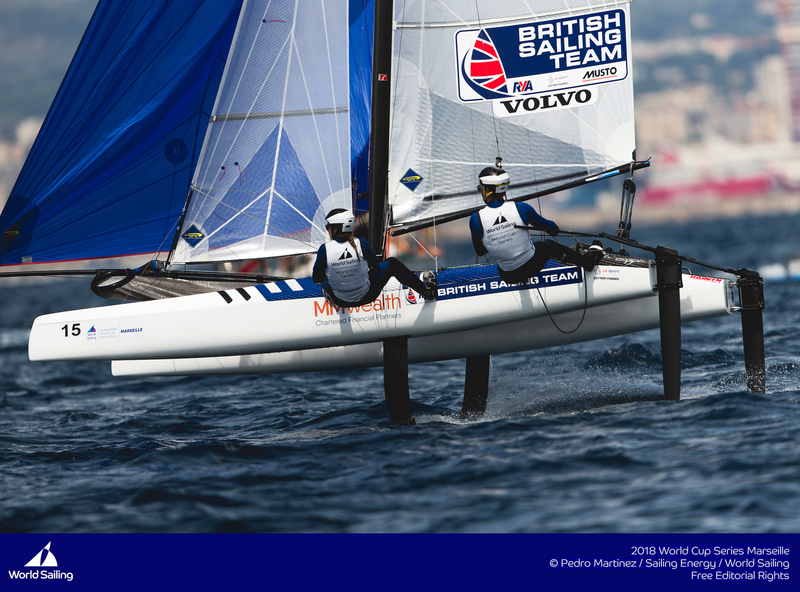 Even on the light day teams were foiling solidly almost all the time. 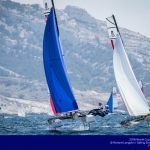 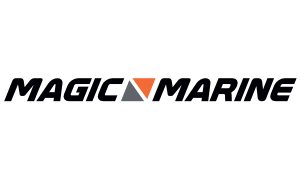 However, the VMG battle between skimmers and foilers has yet to be decided. 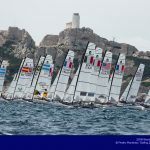 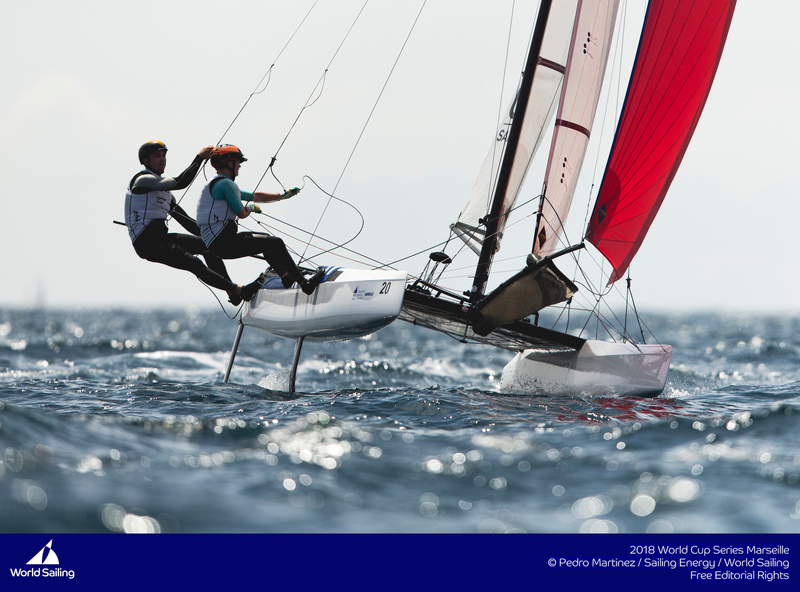 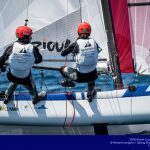 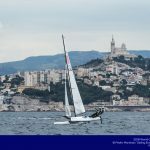 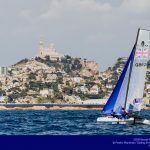 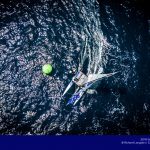 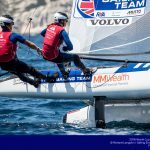 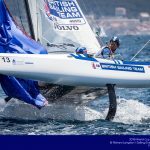 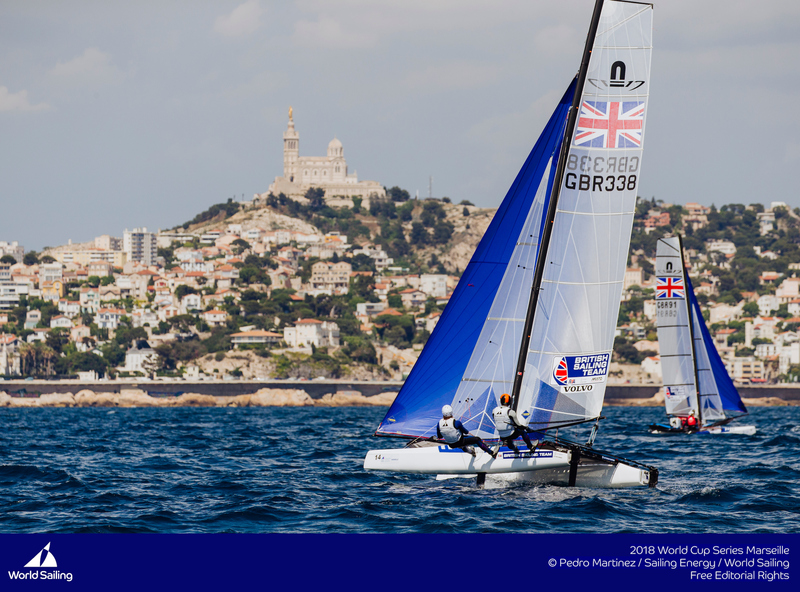 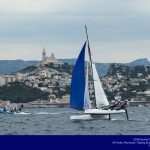 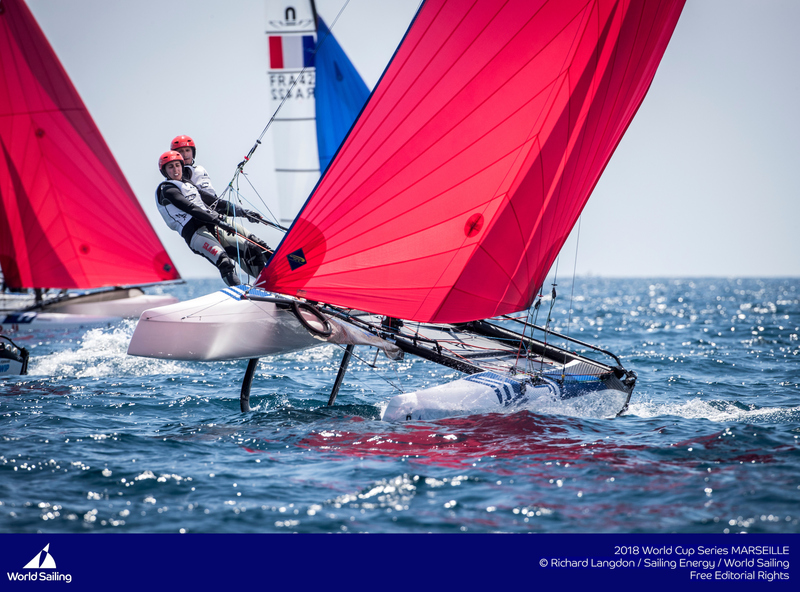 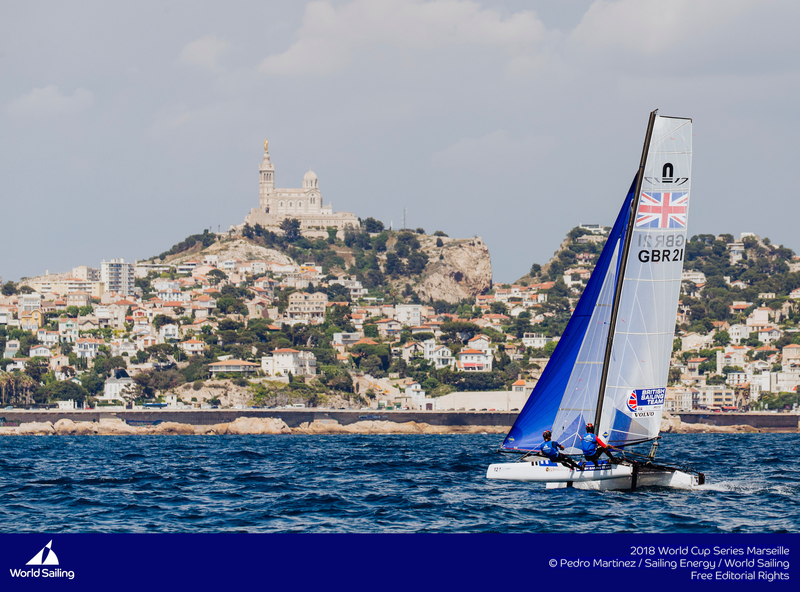 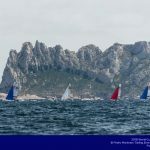 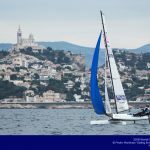 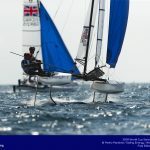 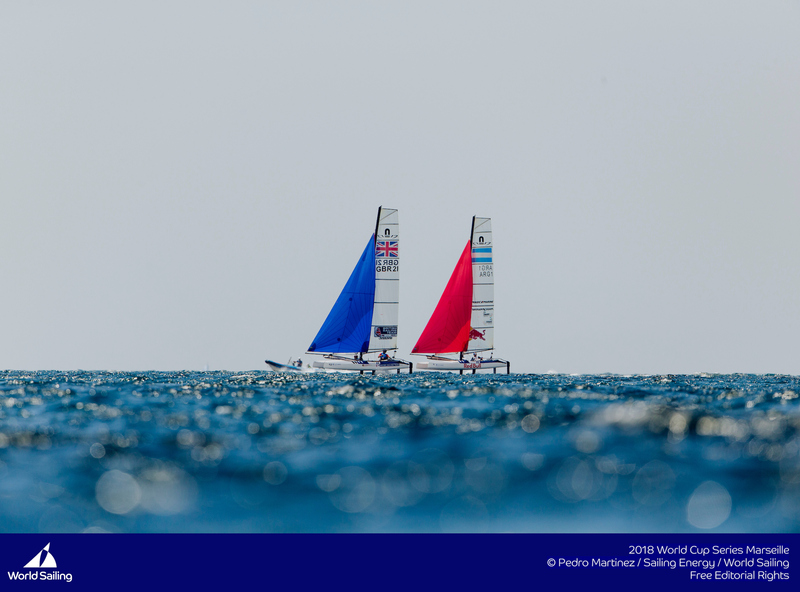 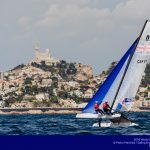 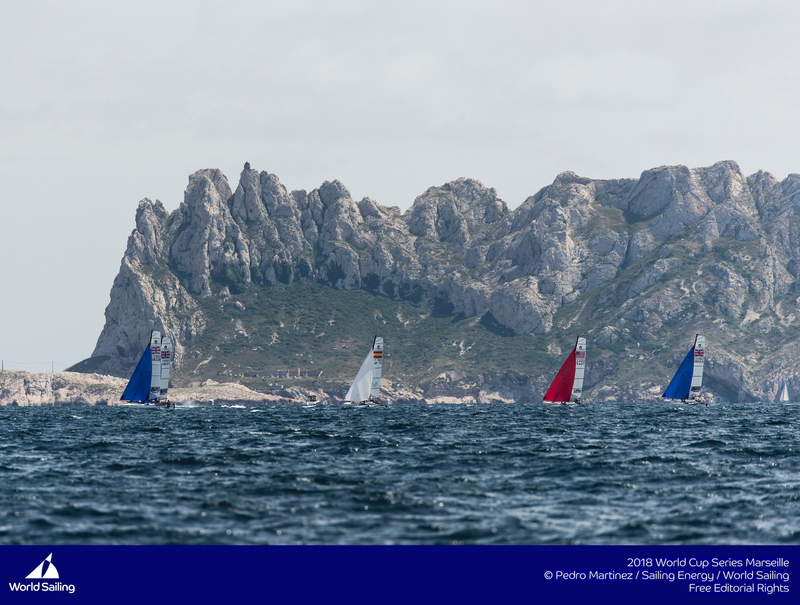 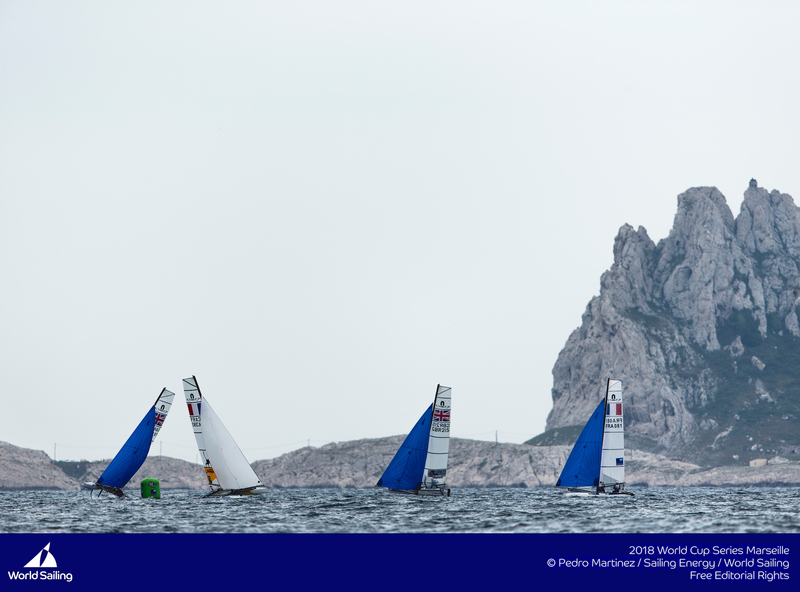 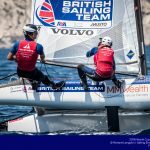 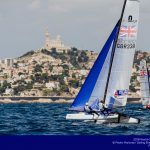 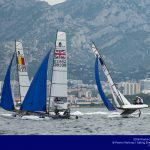 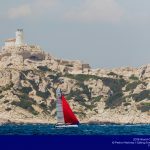 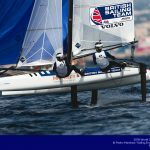 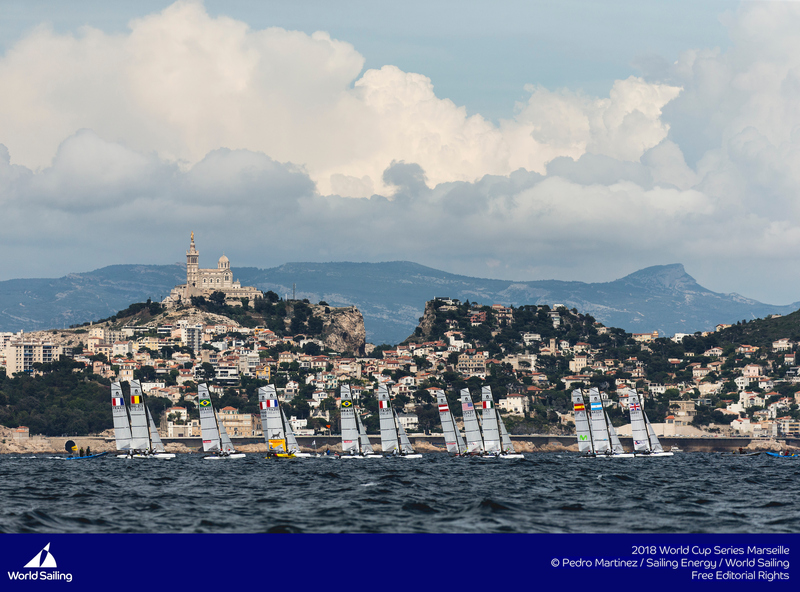 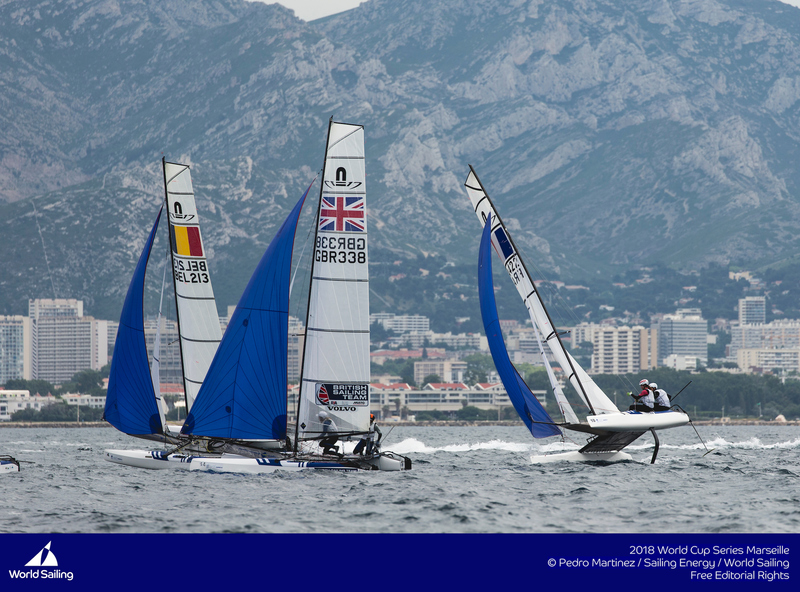 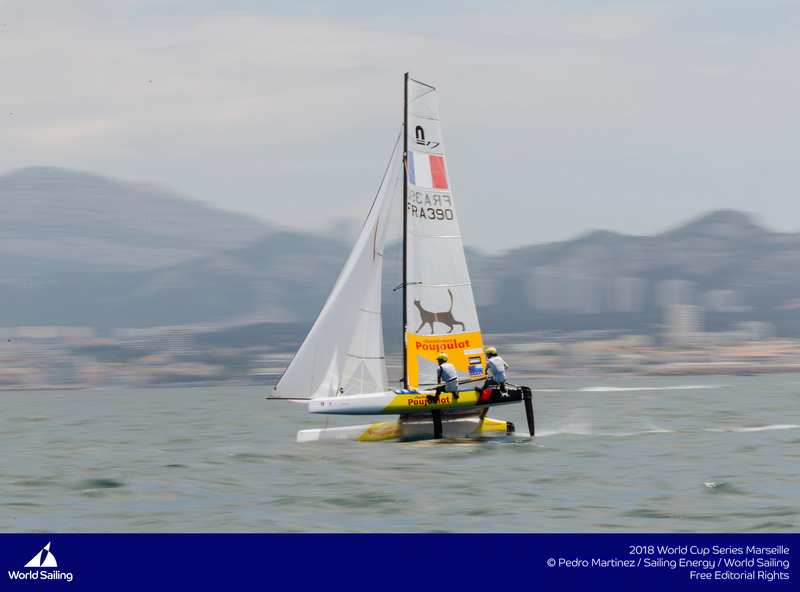 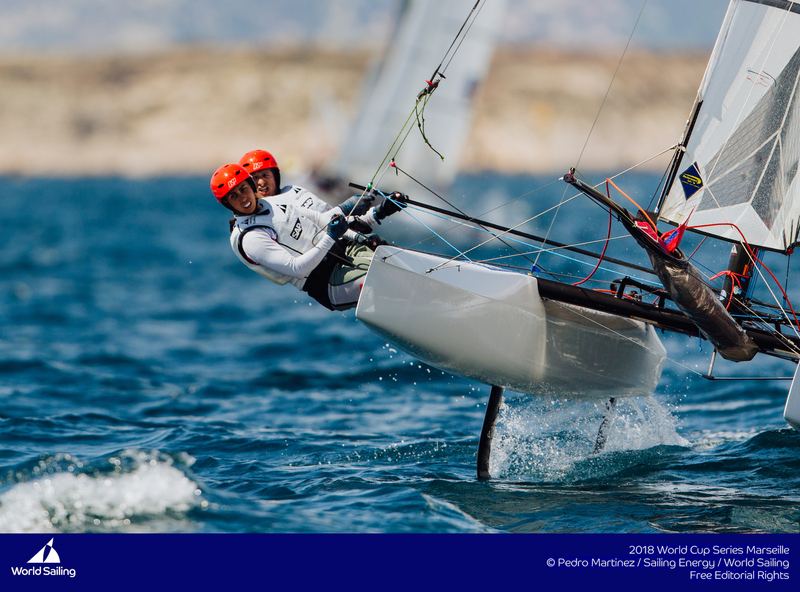 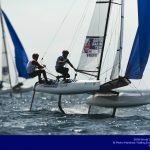 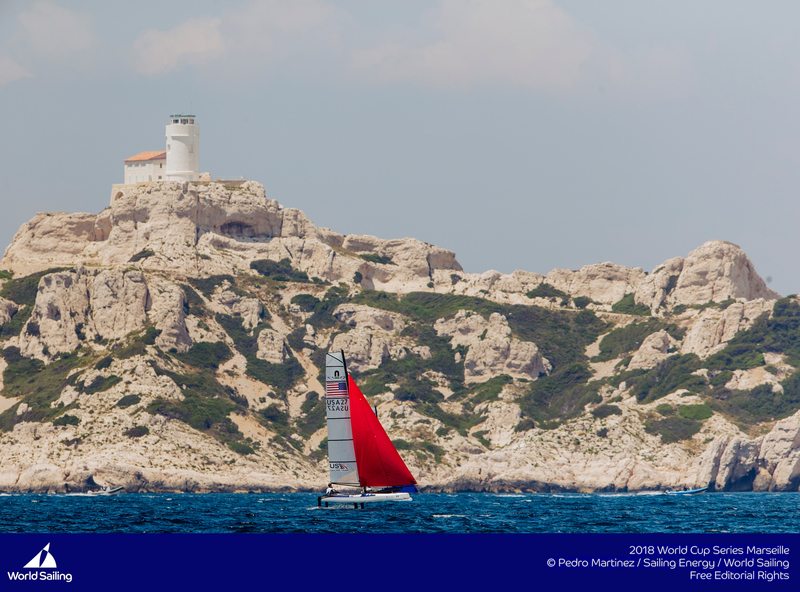 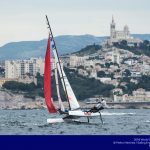 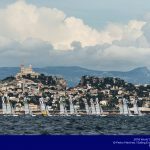 Waterhouse and Darmanin had the best day on day 2, which was the windiest day. 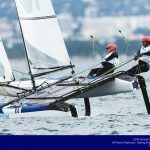 They were pretty dedicated to the foiling mode, and it seemed to pay off, but only barely. 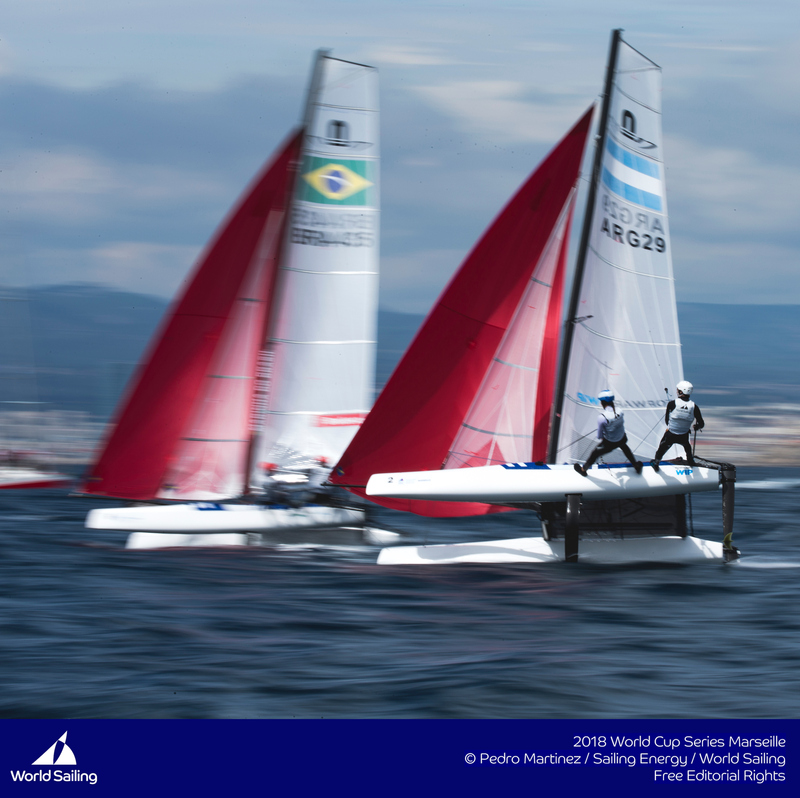 Miami is one of the flattest venues on circuit though, so look for this moding element to be at play all season. 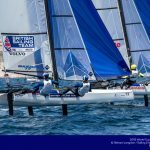 World Cup Series Miami begins on Tuesday January 23, where all the teams will be looking to put their best feet forward.